The fourteen race schedule for the K&N Pro Series East ended on Friday on the 12 turn, 2.54 mile road course in the Road Atlanta 115 with 25 cars in competition. 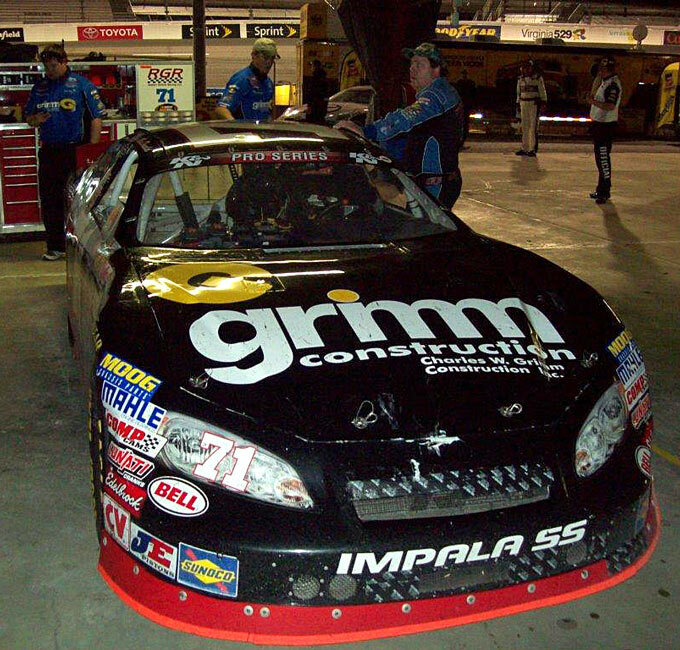 Eddie Mac and the Grimm Racing team struggled to an 18th place finish in the 28 lap event. 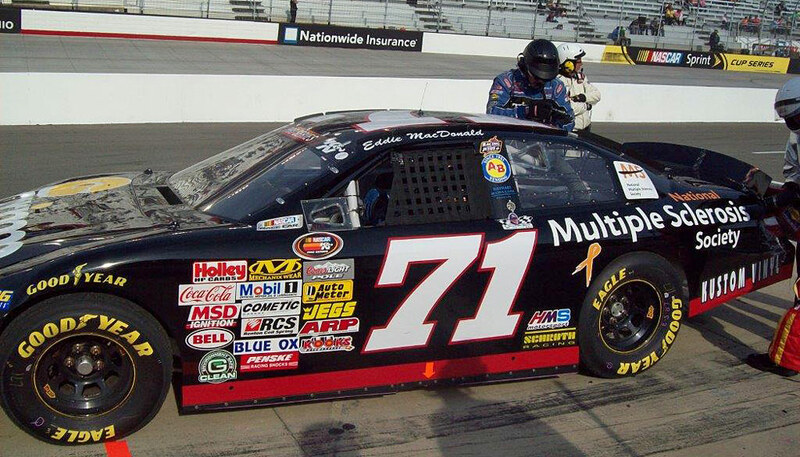 Despite the run, Eddie Mac held on to post a fifth place finish in the NASCAR point’s race. 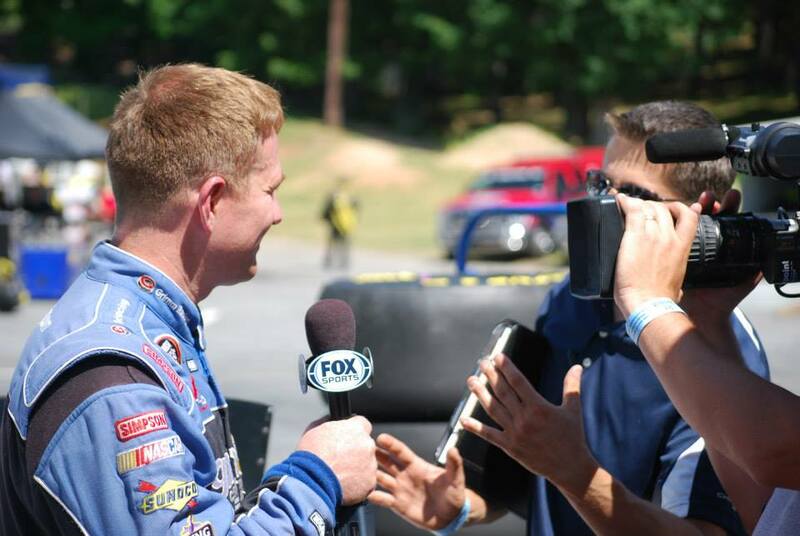 Fox Sports 2 will televise the Road Atlanta 115 at 10 am on Saturday, Nov.2. The Race: The NASCAR K&N Pro Series East is set to conclude the 2013 season with its inaugural event at Road Atlanta as part of the 16th Annual Petit Le Mans powered by Mazda race weekend. The Procedure: The starting field is 30 cars, including provisionals. The first 26 cars will have secured starting positions based on two-lap qualifying. The remaining four spots will be awarded through the provisional process. The race will be 28 laps (71.12 miles, 114.47 kilometers). The Track: A 2.54-mile, 12-turn road course, Road Atlanta opened on Sept. 13, 1970. Road Atlanta has played host to just two previous NASCAR races in its history – the NASCAR Nationwide Series in 1986 and 1987. Series History in the Peach State: The inaugural Road Atlanta event will be the fourth race in NASCAR K&N Pro Series East history in the state of Georgia. 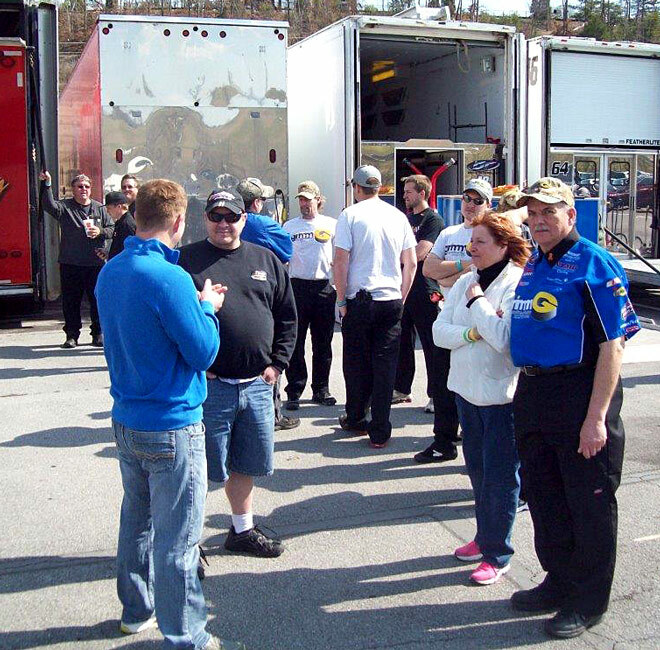 The series previously visited Gresham Motorsports Park in Jefferson, Ga., once a year from 2010-12. Series History at Road Courses: Road Atlanta will be the fourth different road course the K&N Pro Series East has visited in its 27-year history. Lime Rock Park in Lakeville, Conn., held 18 races from 1993-2010 while Watkins Glen (N.Y.) International welcomed the series 14 times from 1993-2009. Earlier this season the K&N Pro Series East held its inaugural event at Virginia International Raceway in Alton, Va.
• Just five points separate Dylan Kwasniewski and Brett Moffitt atop the NASCAR K&N Pro Series East championship standings heading into the season finale at Road Atlanta. 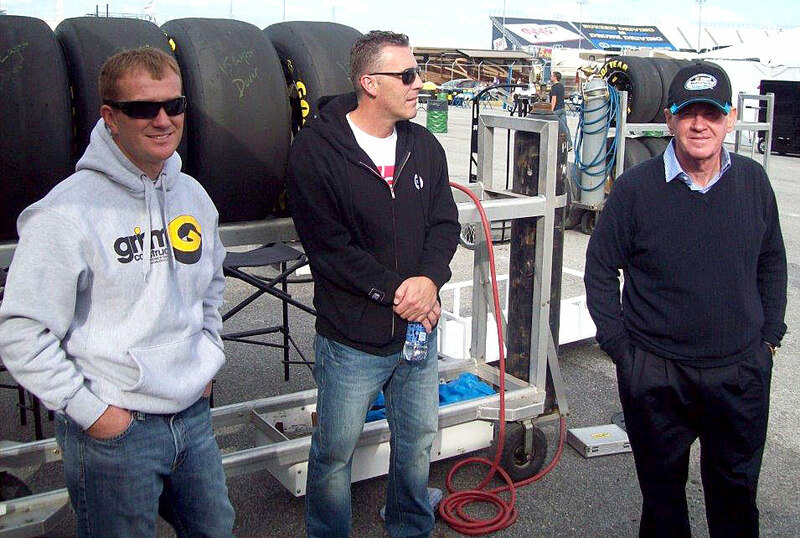 • Kwasniewski – the 2012 NASCAR K&N Pro Series West champion – will attempt to become the first driver to win titles in both the East and West while Moffitt is looking to capture his first title after four years of finishes on the championship podium. • In addition to the overall championship, the Sunoco Rookie of the Year title is also up for grabs at Road Atlanta. Jesse Little has a six-point lead on Gray Gaulding and Kenzie Ruston entering the event. • The 13 previous races this year have produced seven different first-time race winners, the most since 1994 when there were eight first-time victors. • Held its first race on Sept. 13, 1970. 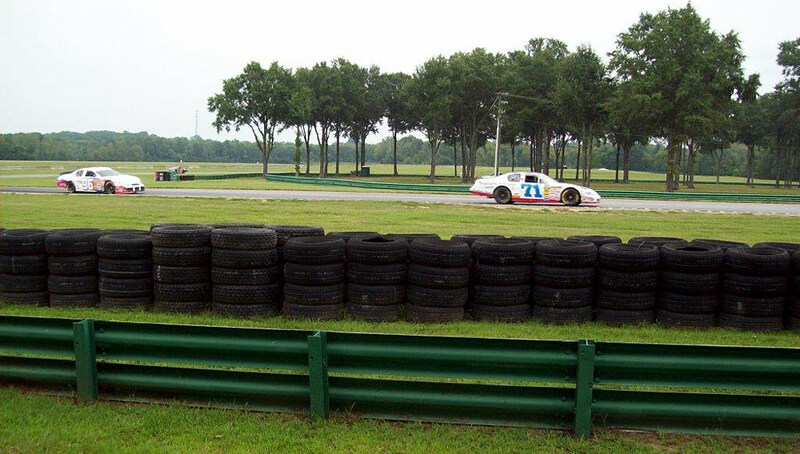 • The facility’s premier annual event is the Petit Le Mans. The NASCAR K&N Pro Series East’s inaugural race at the track will be part of the 16th Annual Petit Le Mans presented by Mazda weekend. 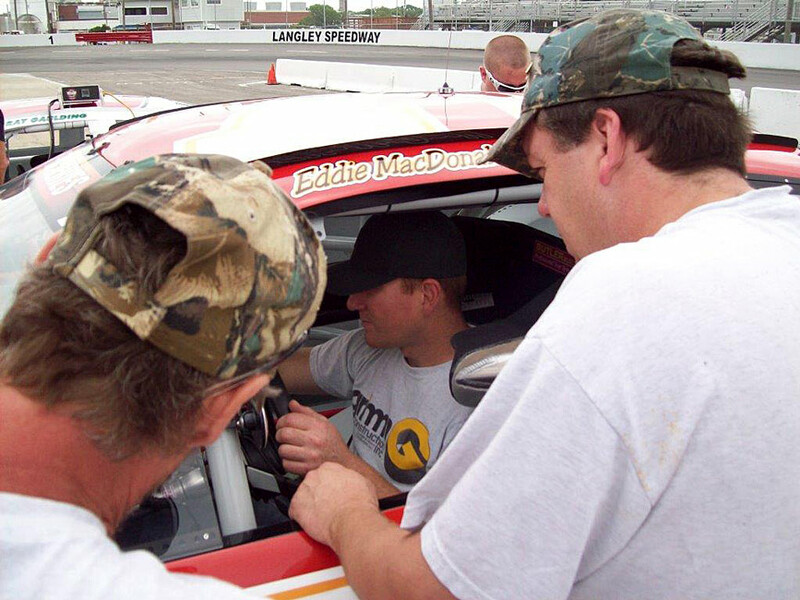 • Has held two previous NASCAR races. The NASCAR Nationwide Series competed there in 1986 and 1987. 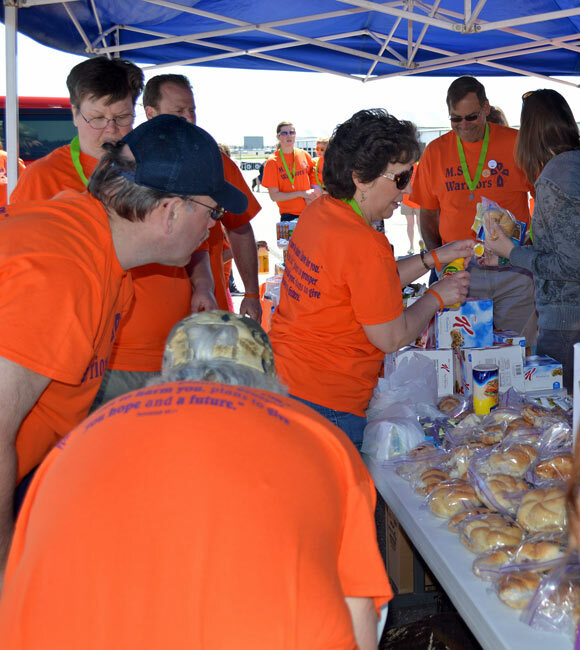 • This will be the fourth all-time NKNPS East event in the state of Georgia. 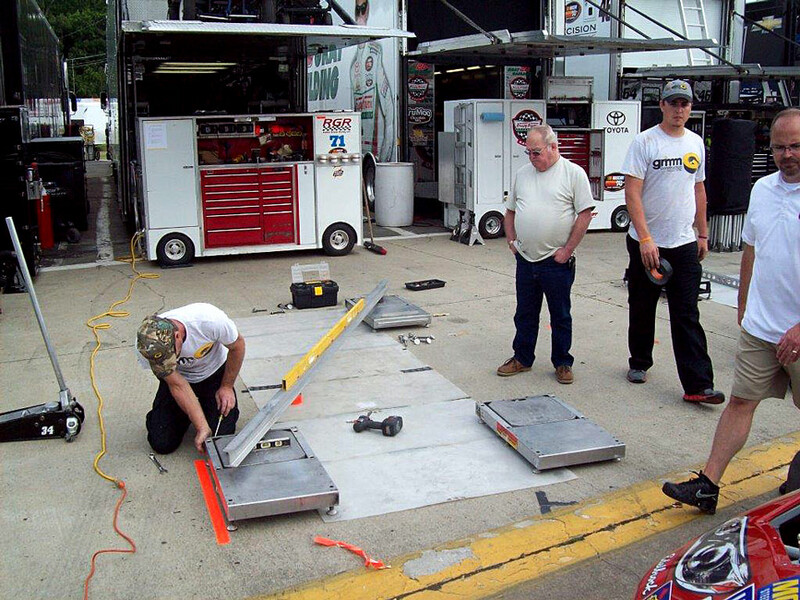 The first three took place from 2010-12 at Gresham Motorsports Park in Jefferson. • This will be the NKNPS East’s 34th all-time road course race since the series was formed in 1987. There were 18 at Lime Rock Park from 1993-2010 and 14 at Watkins Glen International from 1993-2009. The series’ first race at Virginia International Raceway was held earlier this year. 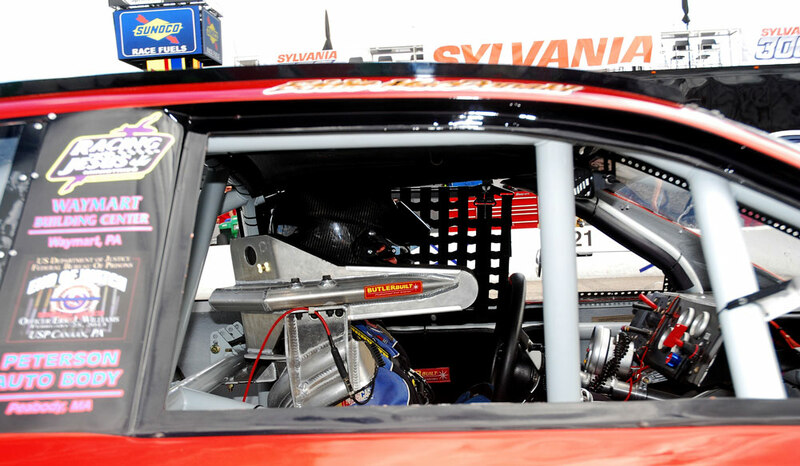 • Has six wins, two poles, 31 top fives and 83 top 10s in 171 career series starts. • Sits fifth in points with eight top 10s in 13 outings, highlighted by a runner-up finish at Iowa in August. 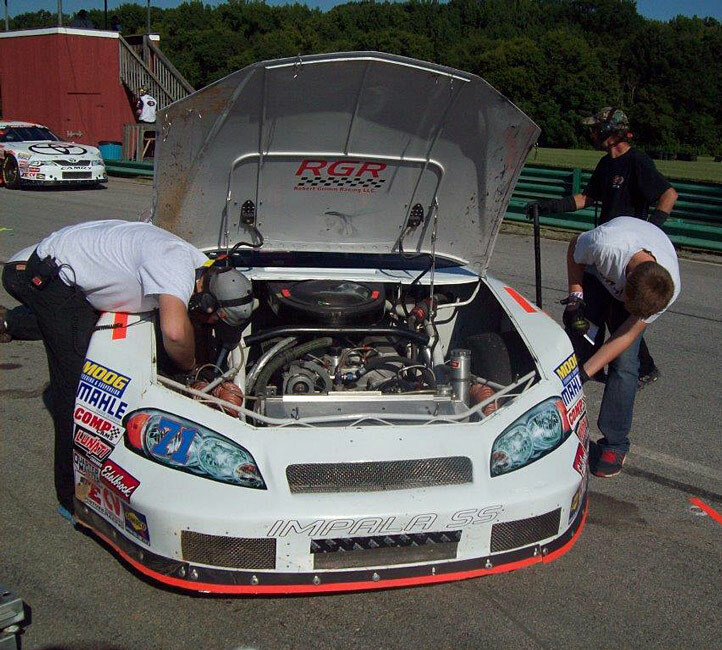 • Finished ninth at VIR in August. Has seven top 10s and an average finish of 15th in 16 career road course starts. Best road course finish was second at Lime Rock in 2009. 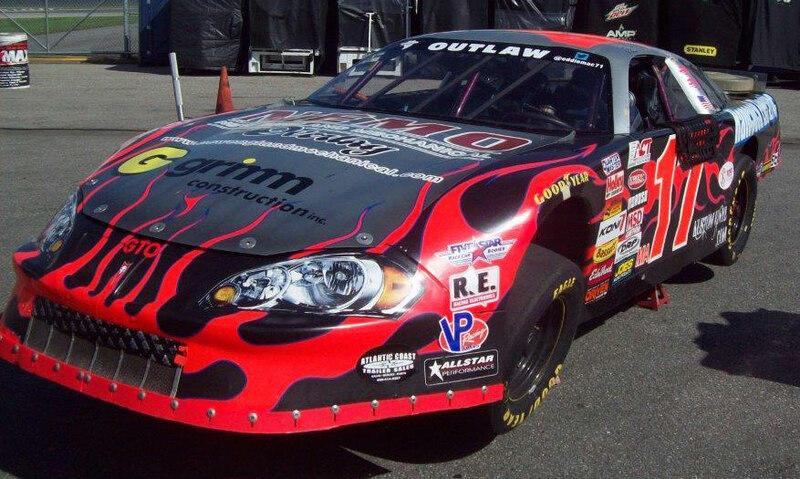 ACT PRESS RELEASE - Quebec’s Patrick Laperle and the “Outlaw” Eddie MacDonald from Rowley, MA are the latest entries in the 51st Peoples United Bank Milk Bowl, to be held at Thunder Road International Speedbowl on Saturday and Sunday, October 5-6, 2013. Newly crowned ACT Champion Wayne Helliwell, Jr. from Dover, NH and his Bruce Bernhardt team have withdrawn their entry from the event. 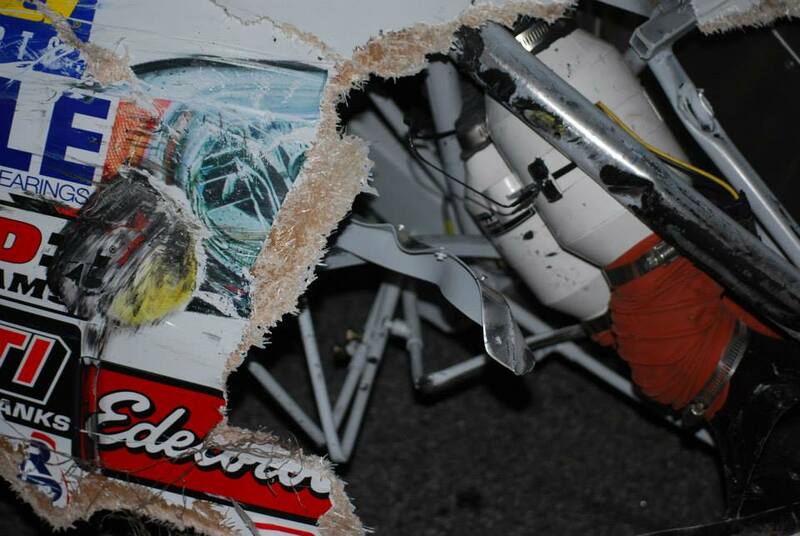 “Our sponsor backed out so we don’t have the money to make the Milk Bowl weekend,” the 2013 Champion said. 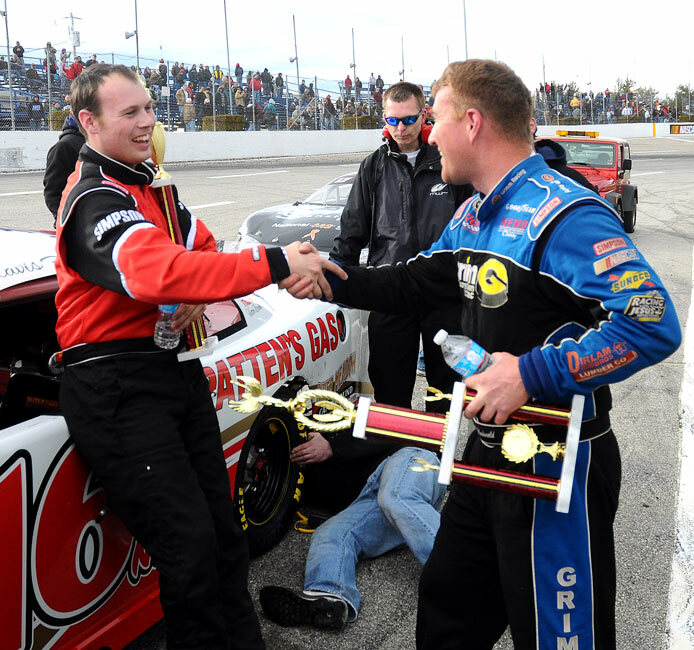 MacDonald, fresh off his third Bond Auto ACT Invitational win at the New Hampshire Motor Speedway two weeks ago, will look for his first win when he tackles the high banks at the ‘Nations Site of Excitement’. 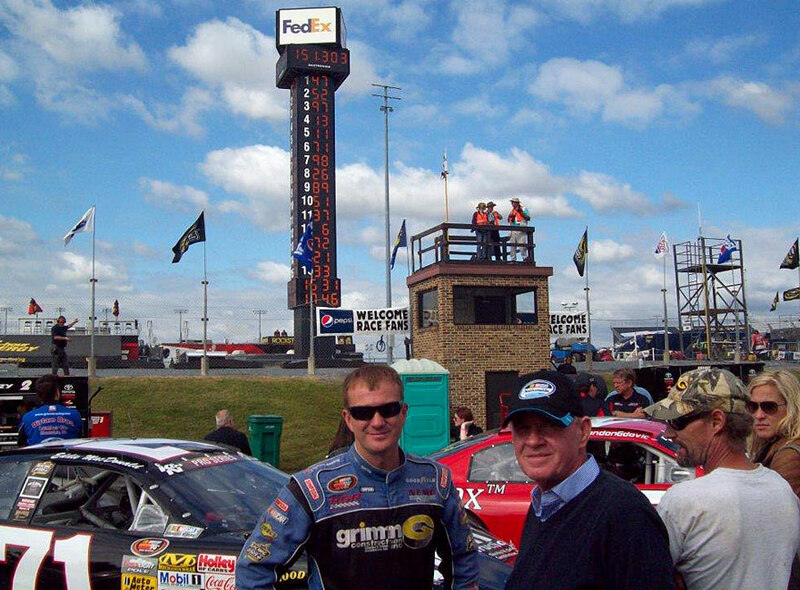 The Booth Bros. /Hood qualifying day is Saturday, October 5, 2013. All teams will qualify under the clock for starting positions in the traditional triple 50 lap qualifying races to be held Saturday. Thunder Road’s Bond Auto Tigers and Allen Lumber Street Stocks will also have the unique experience of time trial qualifying for the ‘mini Milk Bowls’ to be held on Sunday, October 6, 2013. 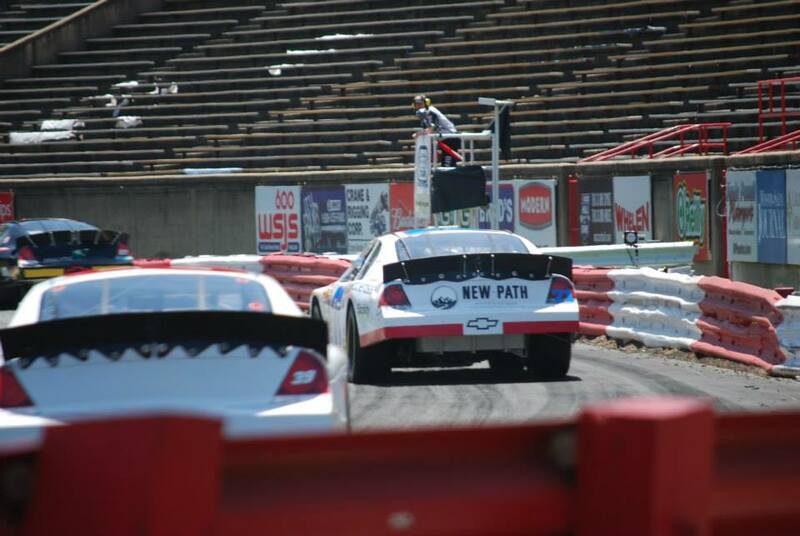 Thirty teams will make up the starting grid on the tricky quarter mile on top of Quarry Hill and will compete in three 50-lap dashes, with the final two segments inverted. Combined lowest scores of the three segments will win over $10,000.00 and hoist the milk can trophy before kissing the ‘beauty queen’, a genuine Vermont Ayrshire dairy cow. Gates will open both days at 10am. Post time each day is 1:00. Adult tickets for the Peoples United Milk Bowl are $30 for two days and $25 for Sunday only. Kids 12 and under are admitted free of charge. 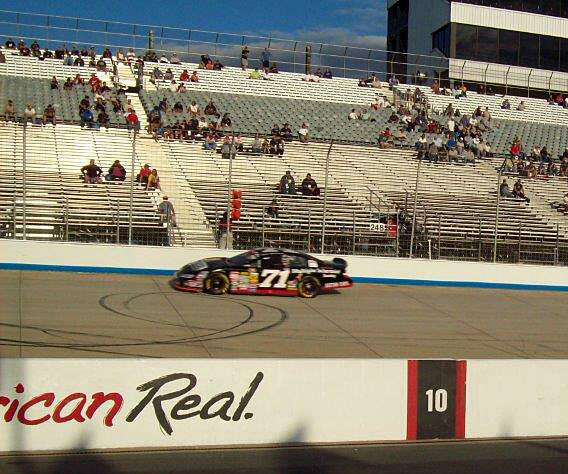 A tire issue late in the Drive Sober 150 at Dover International Speedway on Friday in the NASCAR K&N Pro Series East twelfth race of the season forced a 15th place finish. 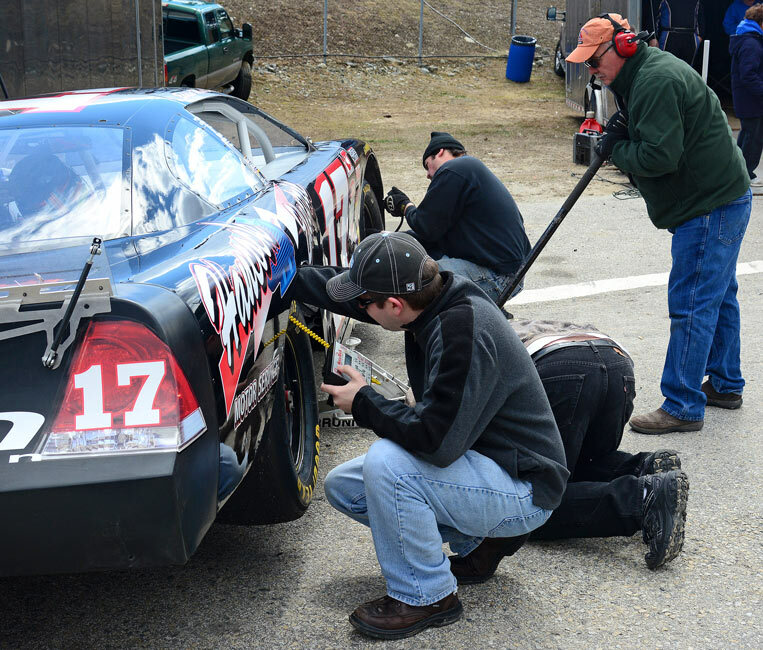 A tire problem last week at New Hampshire Motor Speedway’s Magic Mile ruined a potentially strong day and racecar. Friday’s finish cost the Grimm Construction/Multiple Sclerosis Toyota at least four spots at the finish line and a number of positions in the all-important point’s race. Eddie Mac slipped back from his ninth starting position to 15th with a tight car, eventually falling to 18th when the second caution flag of the race waved on lap 57. 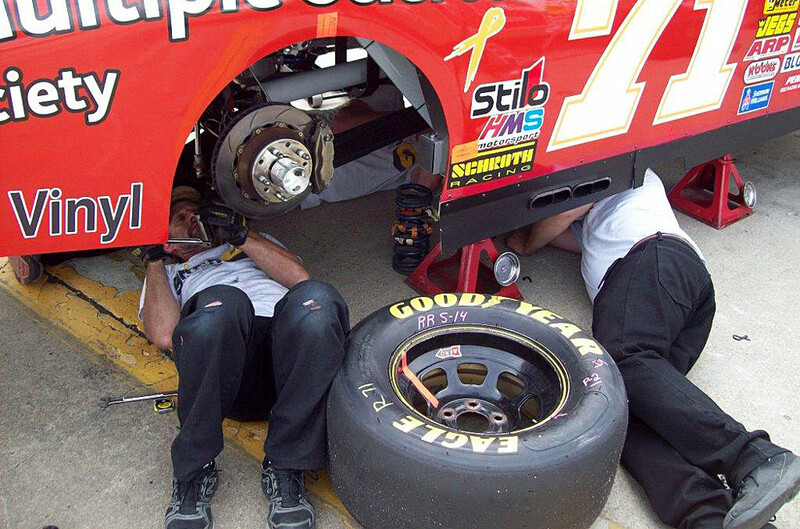 A decision to pit during the caution to free the #71 up was made for a wedge and tire adjustment. The Grimm Construction Toyota headed to the pits again on a lap 64 caution to loosen it up more with a track bar adjustment. A caution on lap 71 also served as the halfway break. 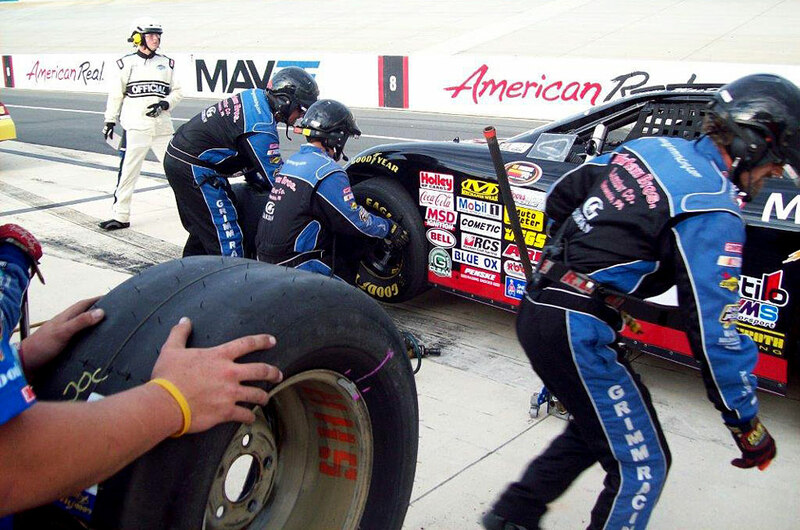 The Grimm Racing Team changed tires and more adjustments and returned for the final laps in 17th place. 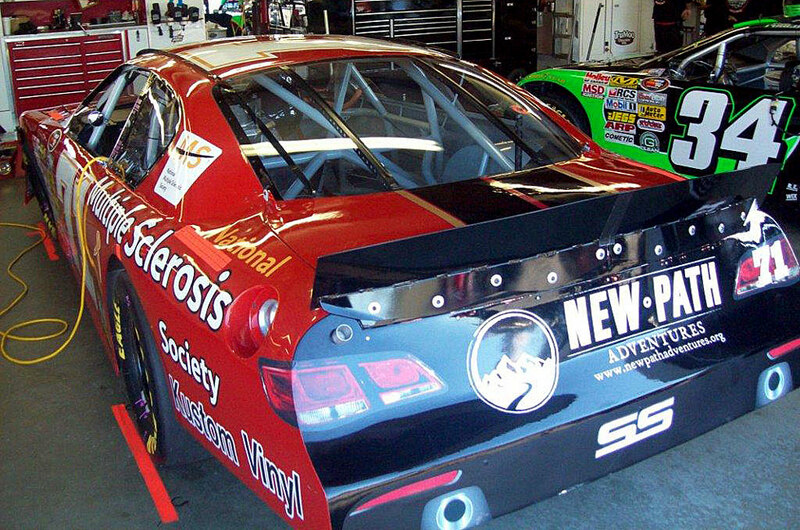 The NASCAR K&N Pro Series East will wrap up the season with an inaugural trip to Road Atlanta on October 18. 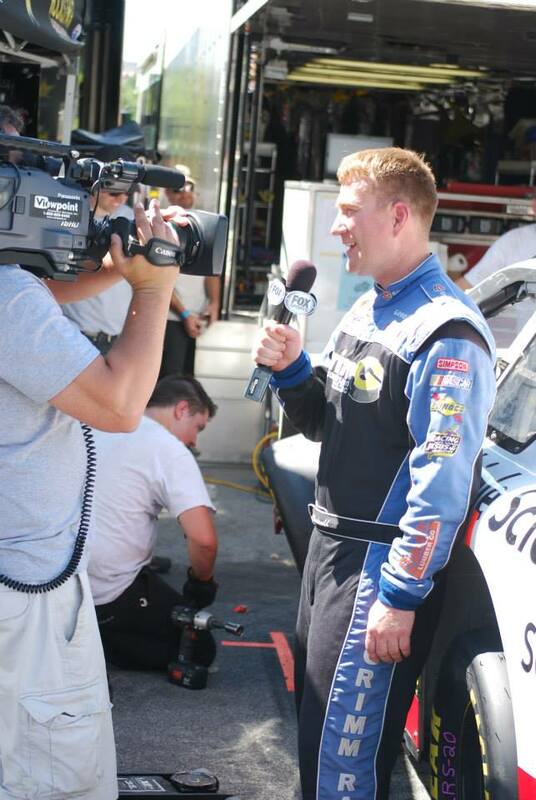 Fox Sports 1 will televise the Drive Sober 150 on October 13 at noon. A replay of the race will be shown on Monday, October 14 at 7 p.m. 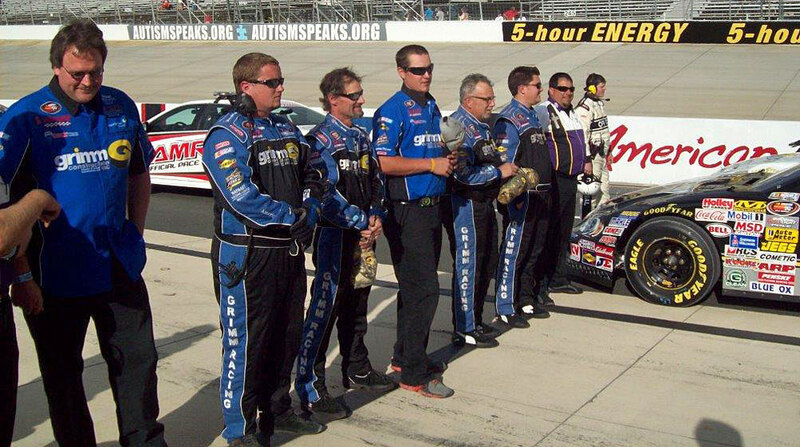 The Race: The Drive Sober 150 at Dover International Speedway will be the 13th event of the 14-race 2013 schedule for the NASCAR K&N Pro Series East. This will be the 13th all-time stand-alone race for the series at Dover. The Procedure: The starting field is 30 cars, including provisionals. The first 26 cars will have secured starting positions based on two-lap qualifying. The remaining four spots will be awarded through the provisional process. The race will be 150 laps (150 miles) and will have a 10-minute break at or near the conclusion of Lap 75. 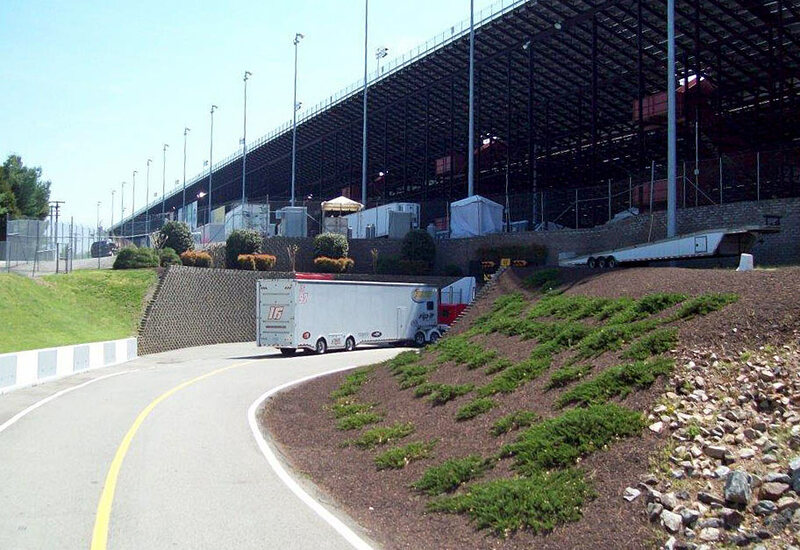 The Track: Known as the “Monster Mile,” Dover is an even one-mile concrete oval with banking of nine degrees on the straightaways and 24 degrees in the turns. 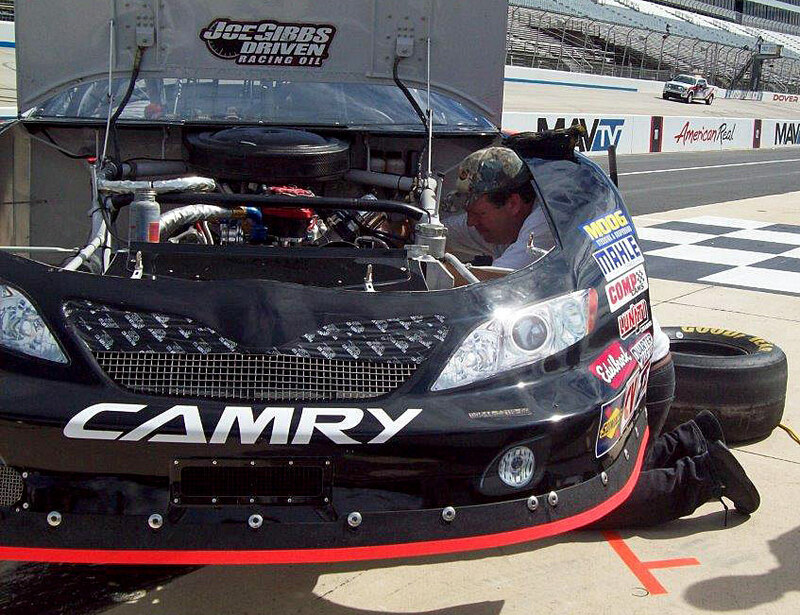 Race Winners: There have been 11 winners in the previous 12 K&N Pro Series East races at Dover. Corey LaJoie was last year’s winner while Brett Moffitt is the only driver with multiple victories at the track. Pole Winners: In the 12 previous events there have been 10 different pole winners. 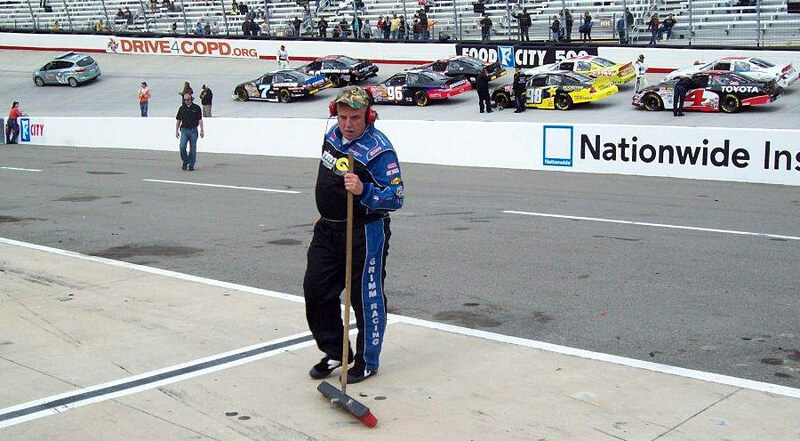 Darrell Wallace Jr. is the only multi-time polesitter at Dover while Matt DiBenedetto has the qualifying record at 23.201 seconds (155.166 mph), established in 2009. • Points leader Dylan Kwasniewski has a mathematical shot at clinching the 2013 NASCAR K&N Pro Series East championship at Dover International Speedway. He brings a 23-point lead on Brett Moffitt into the Drive Sober 150. • Kwasniewski can move into a tie with Brad Leighton for second on the NASCAR K&N Pro Series East single-season wins list with a victory, which would be his sixth of 2013. • Moffitt is the only driver in series history with two victories at Dover and he’s led laps in three of his four career starts there. • Daniel Suárez has finished on the podium in five of the last six races and has improved from 12th to fifth in the standings during that run. 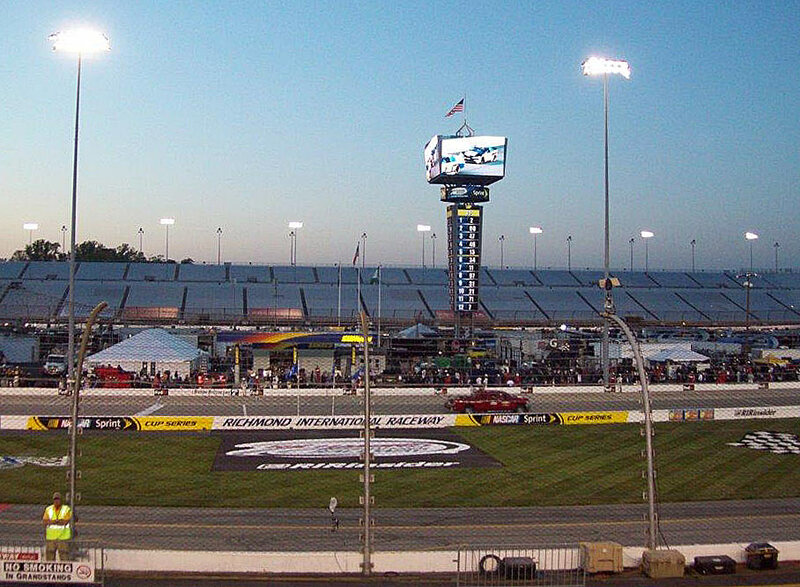 • The official opening of Dover International Speedway, then called Dover Downs International Speedway, was in 1969. • The first NASCAR Sprint Cup race was held on July 6, 1969 – won by Richard Petty. 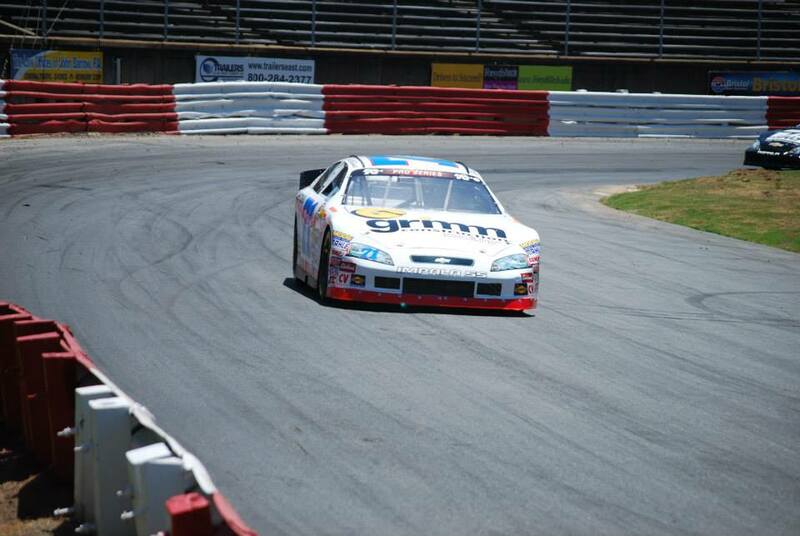 • Dover held 10 NASCAR Nationwide Series–NASCAR K&N Pro Series East combination races from 1987-92. 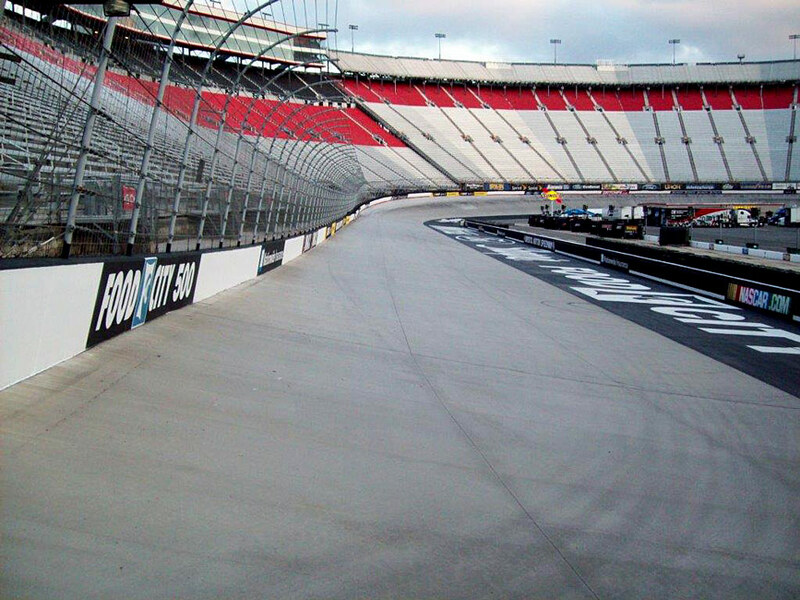 • The track surface was changed to concrete in 1995. 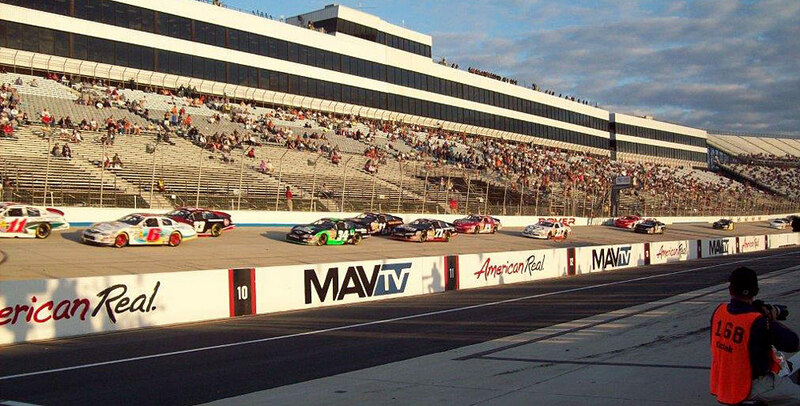 • The first stand-alone NKNPS East race was held at Dover on July 18, 1998. 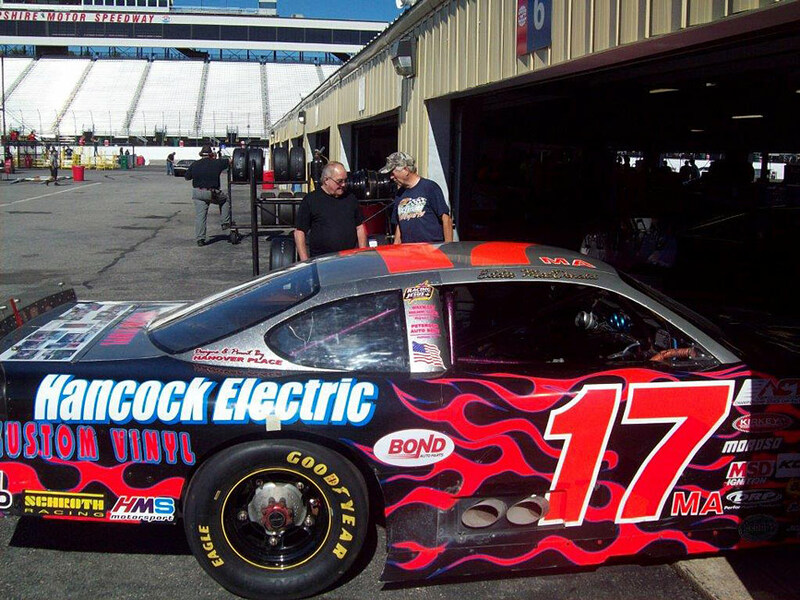 • The track name was changed to Dover International Speedway in 2002. 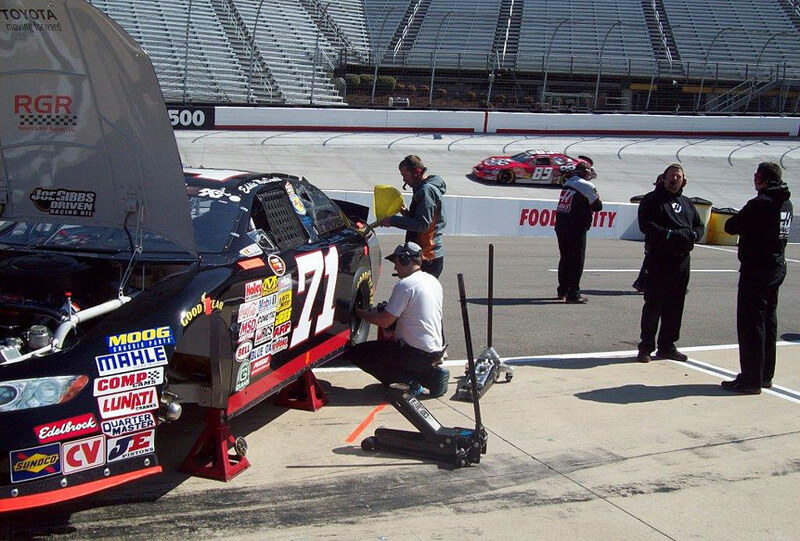 • There have been 12 previous stand-alone NKNPS East races at Dover. • Of those 12 previous events, there have been 11 different race winners and 10 different pole winners, with qualifying cancelled one year. • Of the 11 previous winners, only Brett Moffitt has won twice. • Of the 10 previous pole winners, only Darrell Wallace Jr. has two. • Has six wins, two poles, 31 top fives and 83 top 10s in 170 career series starts. • Is tied for third in points with eight top 10s in 12 outings, highlighted by a runner-up finish at Iowa in August. 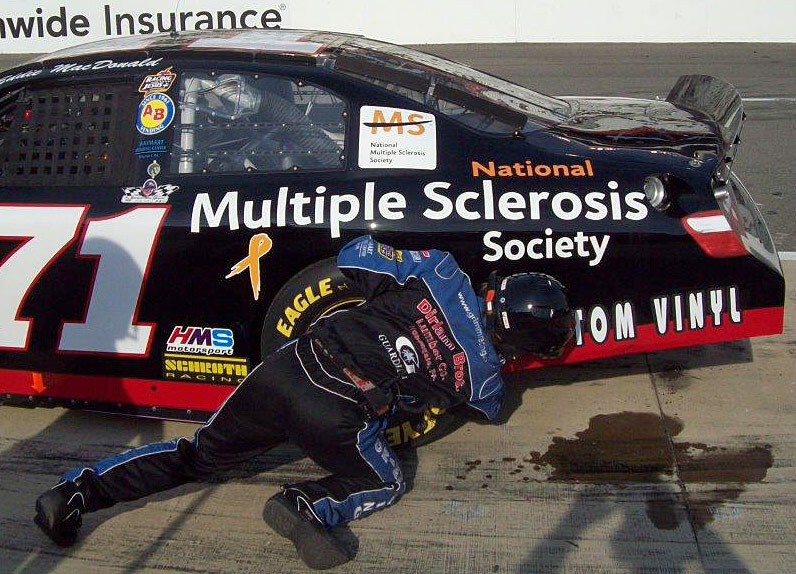 • Has four top 10s, an average finish of 12th and a best result of third (2004) in 11 previous races at Dover. Eddie MacDonald continued his dominance at the Magic Mile in Loudon, N.H. with his third victory in the American Canadian Tour’s 5th Annual Bond Auto 50 lap event. The Rowley, Mass. driver won the first ever ACT race at NHMS and has now won three of the five contests held on the September NASCAR Sprint Cup weekend schedule. 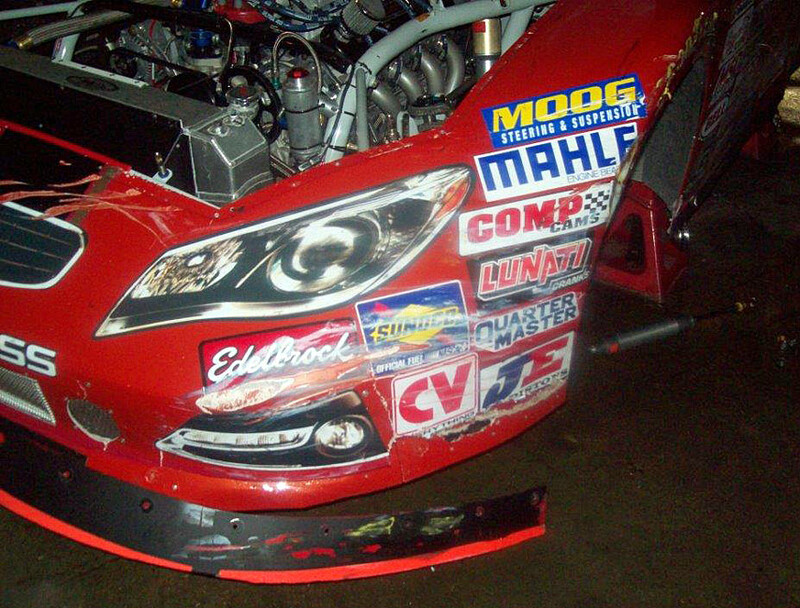 Unfortunately, Eddie Mac was not as fortunate in the K&N Pro Series East race when he hit the wall in turn one while leading the race when the right side tire blew apart. 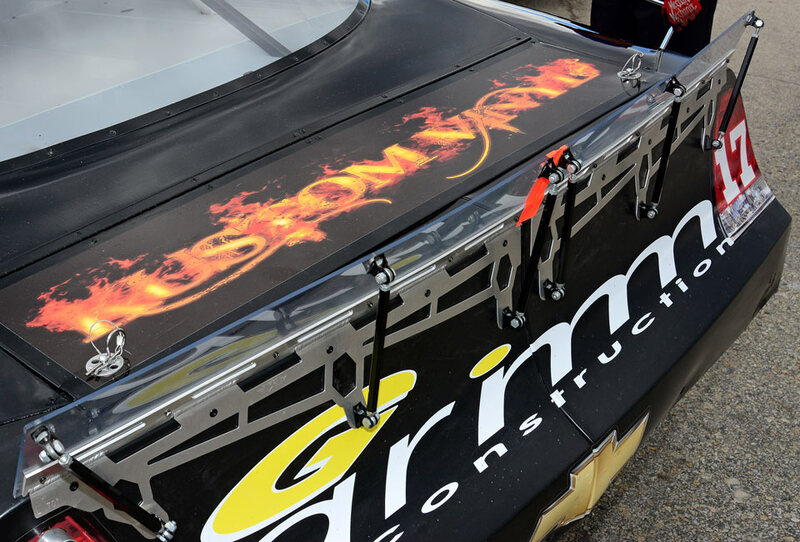 The Grimm Construction Chevy was “just riding” in sixth before taking the fifth position on a lap 17 restart. 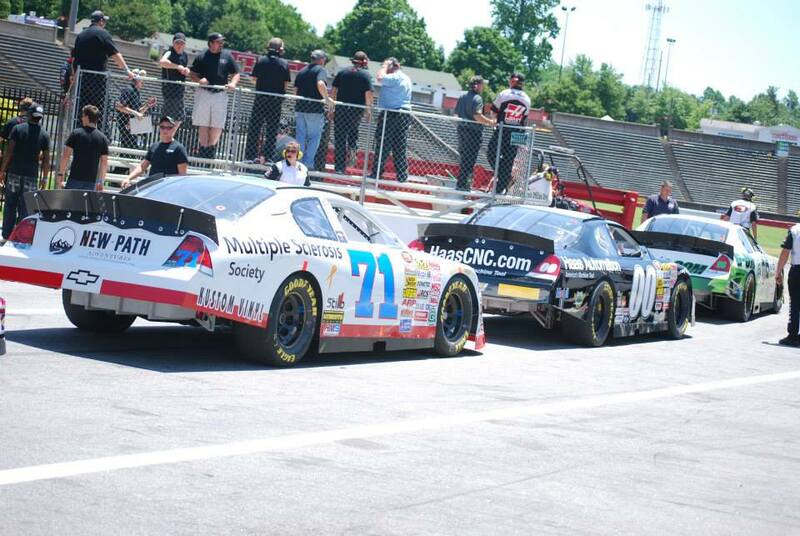 The #71 then began powering to the front. 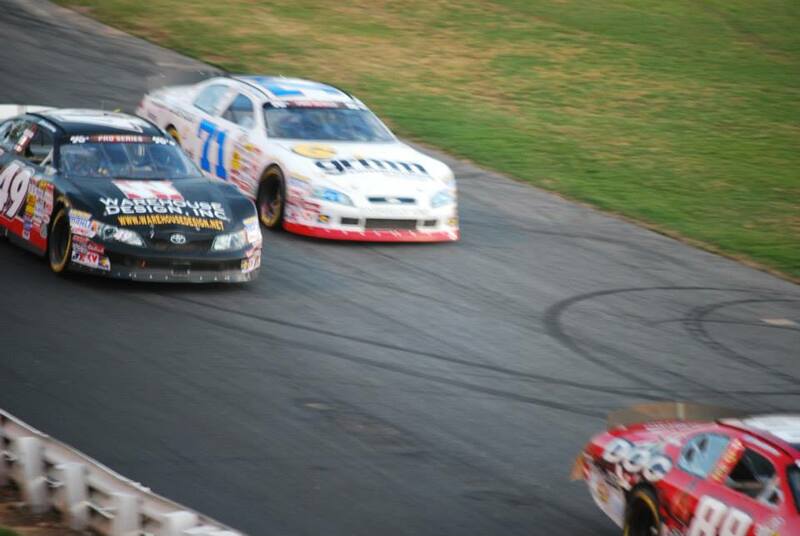 On a lap 40 restart after a red flag, Eddie Mac moved into third then took the top spot on lap 41. The lead was short-lived when four laps later the right front tire exploded sending Eddie nose first into the turn one wall. 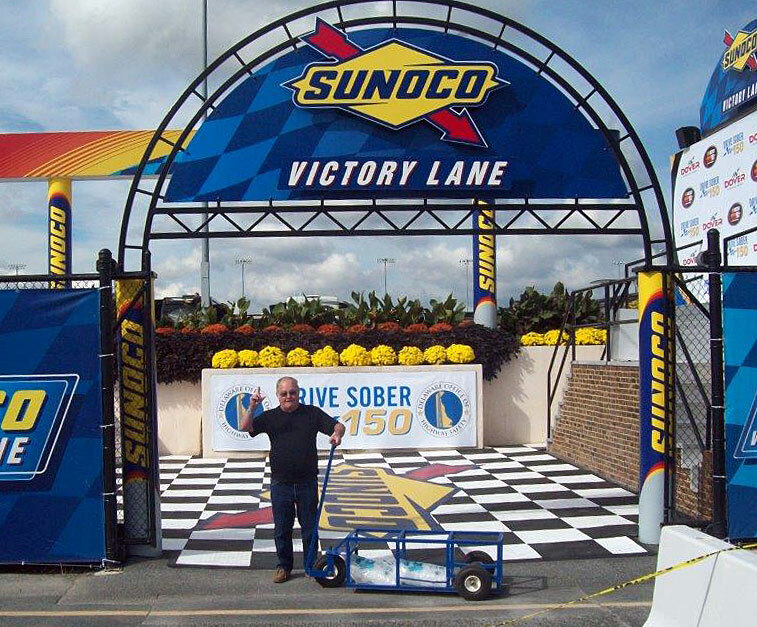 The Drive Sober 150 will take the green flag in the second to last race on the K&N Pro Series East schedule this Friday on the “Monster Mile” as another companion race for the third “Chase” race for the NASCAR Sprint Cup Series. Having taken the lead on lap 41, , Eddie had the right front tire suddenly go down on lap 44. 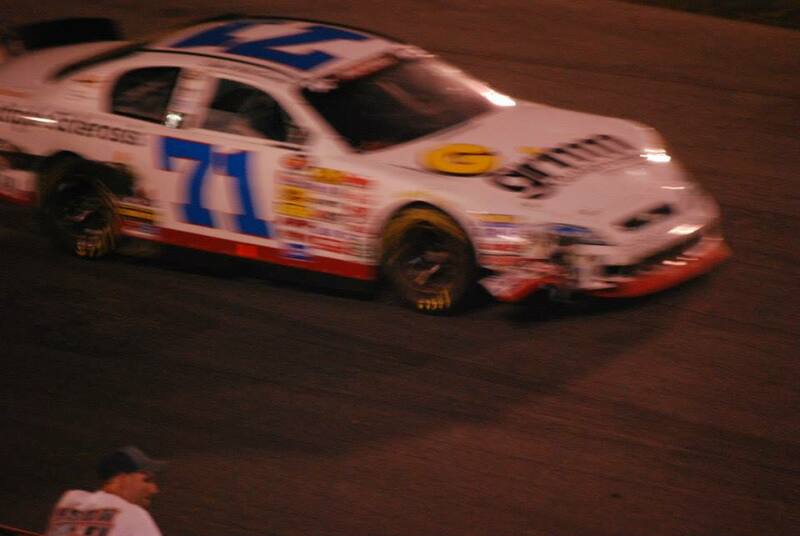 The #71 pounded the turn one wall for a 23rd place finish. 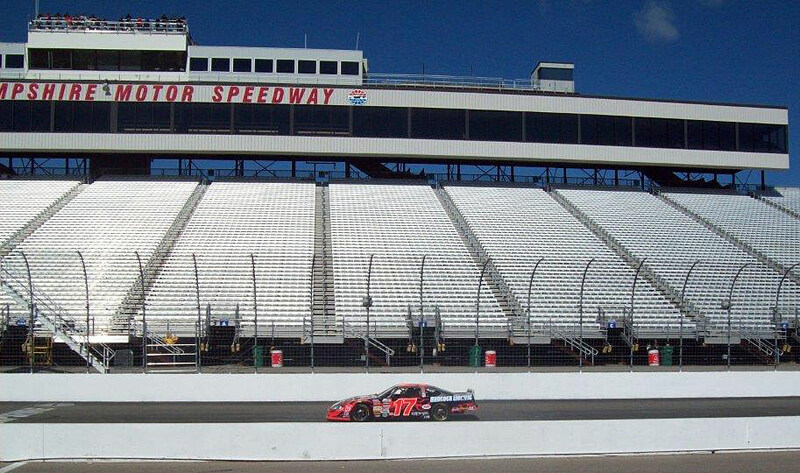 The Race: The North American Power 100 will be the 12th of 14 races on the 2013 NASCAR K&N Pro Series East schedule and the lone trip to New Hampshire Motor Speedway. The Procedure: The starting field is 36 cars, including provisionals. The first 32 cars will qualify through two-lap time trials. The remaining four spots will be awarded through the provisional process. The race will be 100 laps (105.8 miles) with a 10-minute break at or near the conclusion of Lap 50. The tire change rule is two tires, any position. 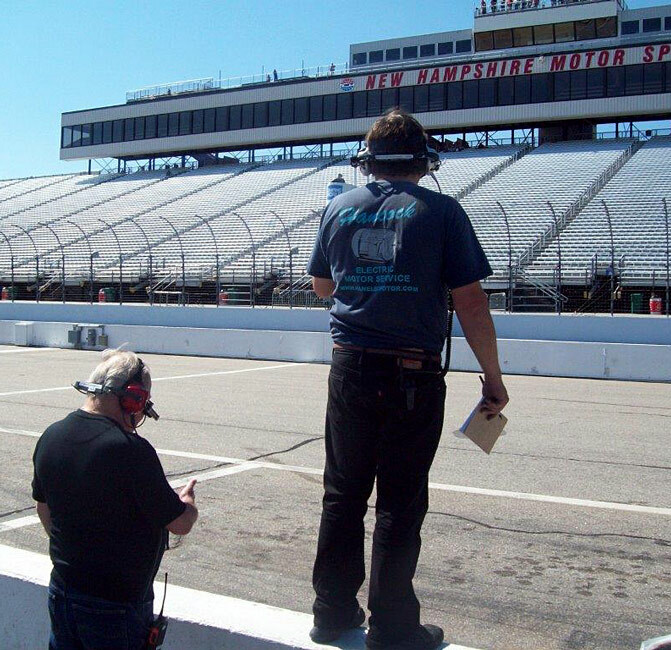 The Track: NHMS, a 1.058-mile slightly-banked asphalt oval, is the largest track the K&N Pro Series East races at. 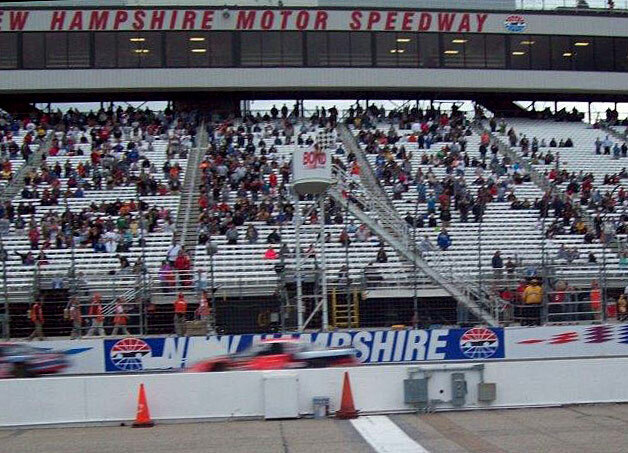 NHMS has played host to the K&N Pro Series East in each year of the track’s existence and has held more races than any other facility in the series’ 27-year history. Race Winners: There have been 26 different winners in 57 all-time stand-alone races at NHMS. 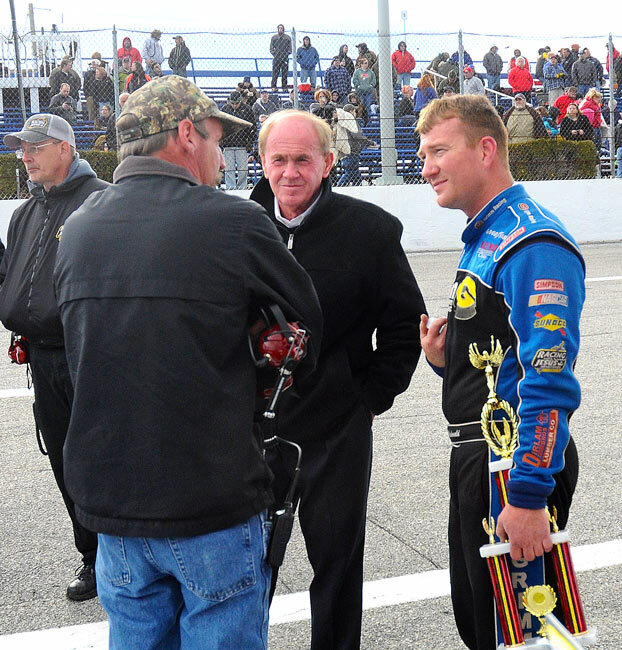 New Hampshire native Brad Leighton has the most series wins at the “Magic Mile” with eight while Eddie MacDonald is the active leader with three. Pole Winners: Of the 29 different drivers to earn a Coors Light Pole Award at NHMS, Kelly Moore has the most in K&N Pro Series East history with six. Brett Moffitt set the track qualifying record at 29.648 seconds (128.467 mph) in this event last year for his third “Magic Mile” pole. 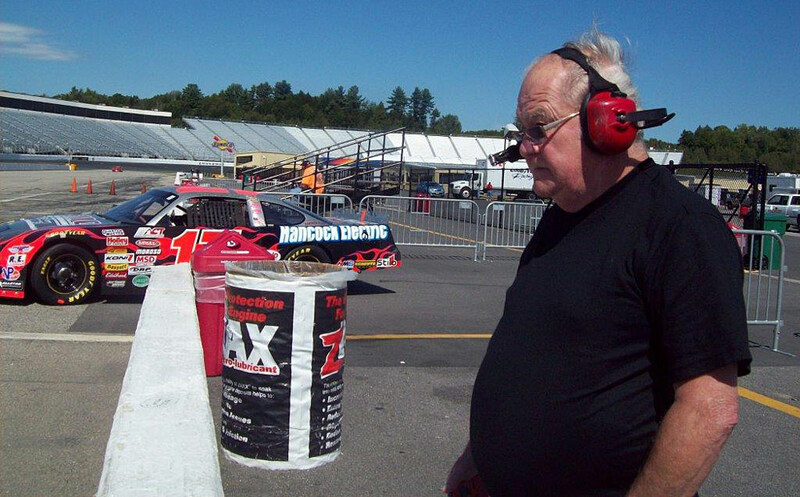 MacDonald on a Run: Eddie MacDonald is once again turning in a commendable performance in 2013, and it could get even better as the K&N Pro Series East heads to his home track this week for the North American Power 100 at NHMS. MacDonald ranks fourth in points and only championship leaders Dylan Kwasniewski and Brett Moffitt have more top-10 finishes (nine) than the Rowley, Mass., native (eight). Following five straight top 10s, MacDonald heads to his best track, where he’s posted three of his six career victories. 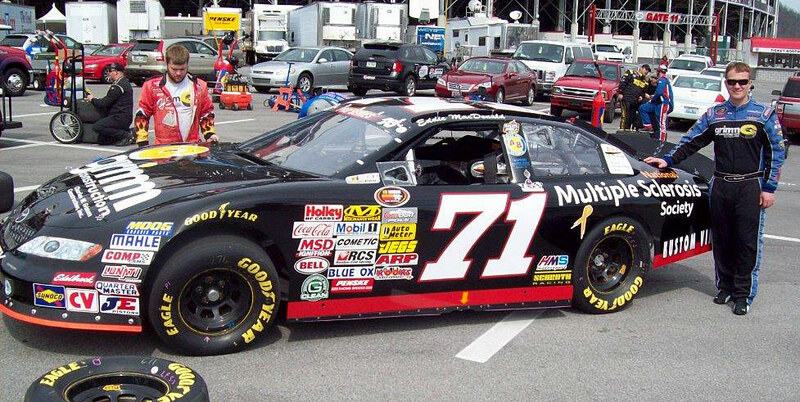 The recent run of success could have MacDonald positioned to end a 48-race winless drought that dates to his last Loudon win in 2009. • Points leader Dylan Kwasniewski can move into a tie with Brad Leighton for second on the NASCAR K&N Pro Series East single-season wins list with a victory, which would be his sixth of 2013. 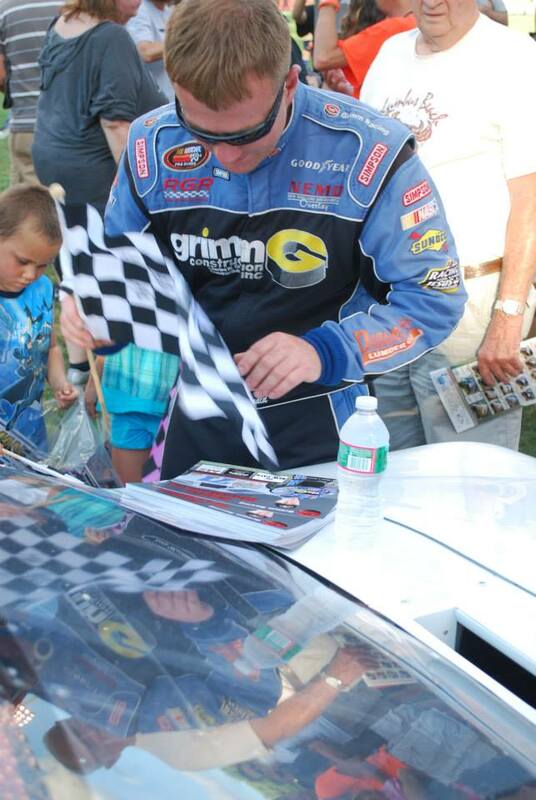 • Brett Moffitt has a win and three runner-up finishes in seven previous races at NHMS. • The active leader with three wins at NHMS, Eddie MacDonald enters this race with a streak of 10 consecutive top-10 finishes at his home track. • Daniel Suárez has finished on the podium in four of the last five races and has improved from 12th to sixth in the standings during that run. • Groundbreaking for New Hampshire International Speedway, as New Hampshire Motor Speedway was originally named, was Aug. 13, 1989. • The 1.058-mile oval is located on approximately 1,200 acres; the multi-use complex is the largest sports facility in New England. • The official opening was June 5, 1990 and the first NASCAR event was a NASCAR Nationwide Series race on July 15, 1990 in which NASCAR K&N Pro Series East drivers competed in combination. 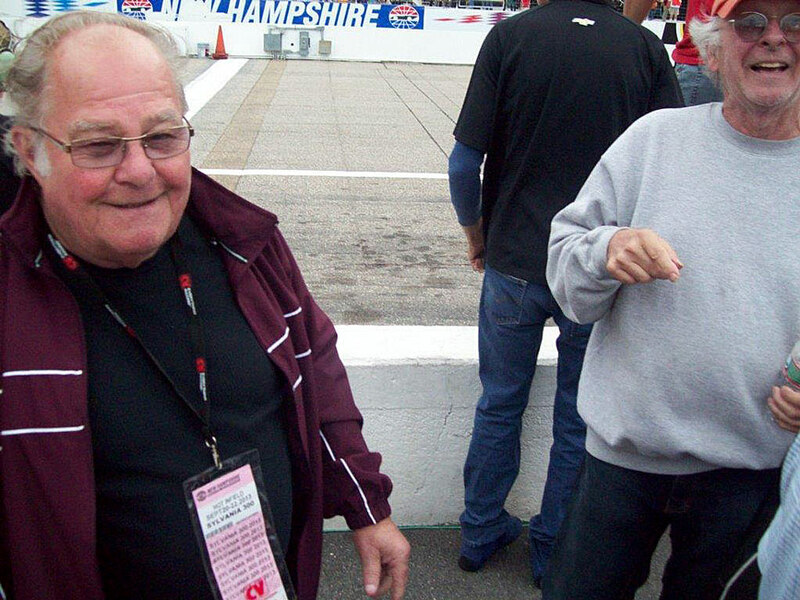 • Speedway Motorsports Inc., agreed to purchase New Hampshire International Speedway from Bob and Gary Bahre on January 11, 2008 and then renamed the track New Hampshire Motor Speedway. • The first NKNPS East stand-alone race was held on Sept. 2, 1990. 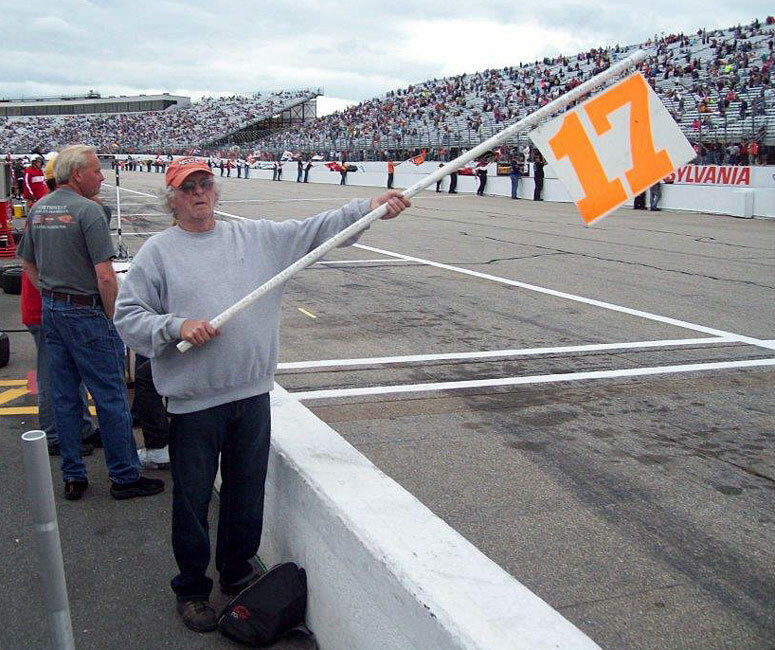 • There have been 57 stand-alone NKNPS East races at NHMS, more than any other track in series history. 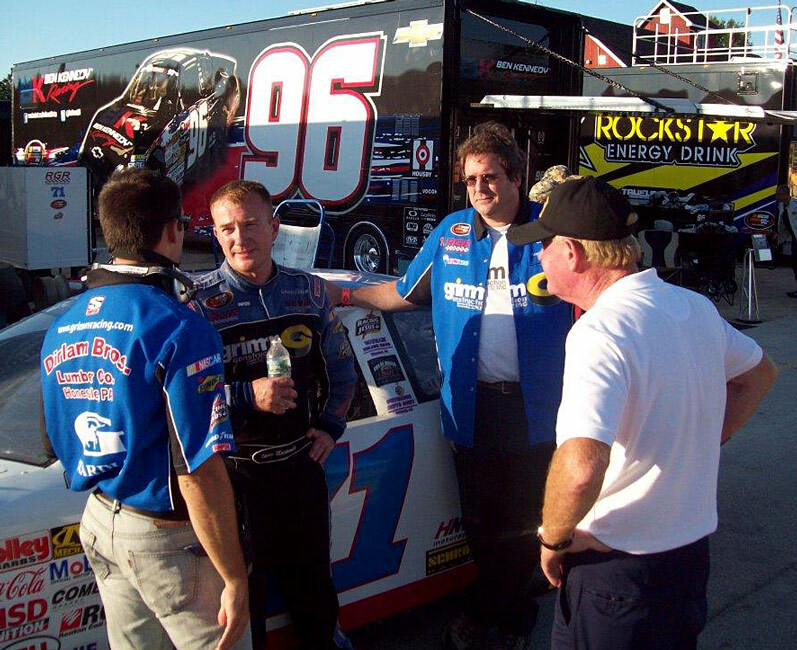 • There have been 26 different race winners, led by Brad Leighton’s eight. Eddie MacDonald is the active leader with three victories. • There have been 29 different pole winners, led by Kelly Moore’s six. Brett Moffitt is the active leader with three poles, and maintains the series’ qualifying record. • Has six wins, two poles, 31 top fives and 83 top 10s in 169 career series starts. • Ranks fourth in points with eight top 10s in 11 outings, highlighted by a runner-up finish at August Iowa. 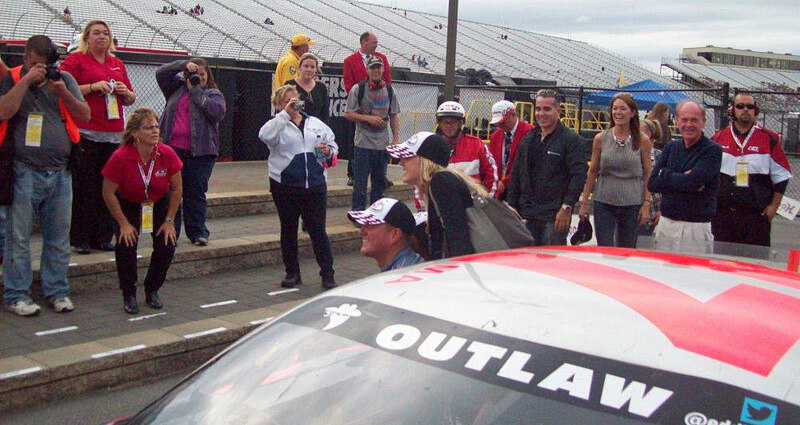 • Has three wins, 12 top 10s, an average finish of 17th and 171 laps led in 24 career starts at NHMS. 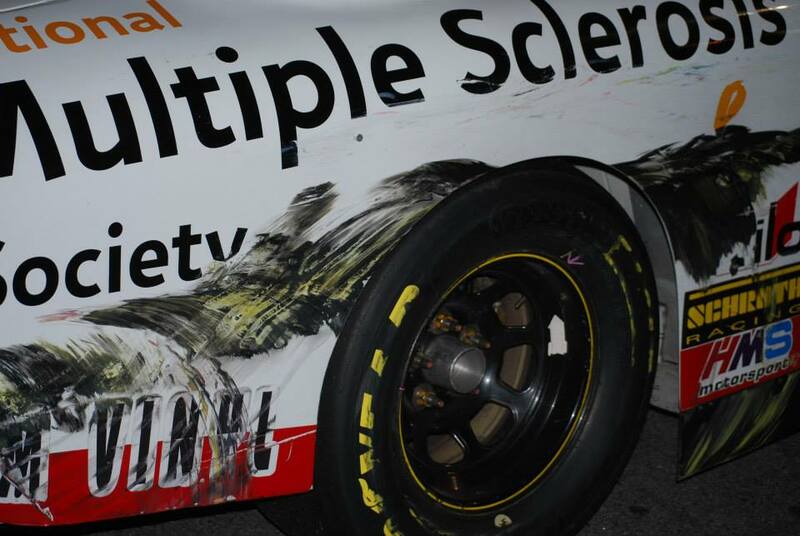 Maintains a streak of 10 top-10 finishes in a row at the track. Had an average finish of 25th in 14 starts there prior to the current top-10 streak. 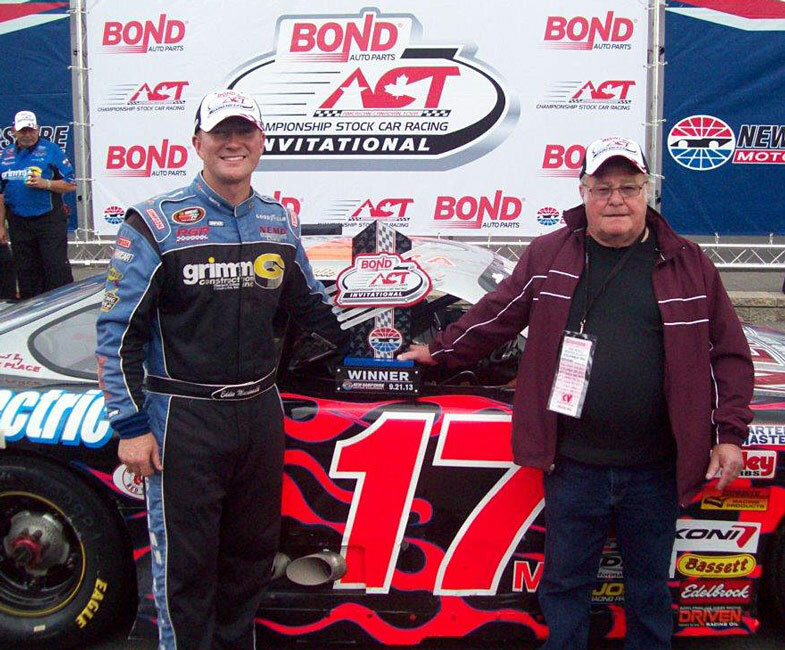 Eddie MacDonald made history when he won the inaugural ACT Invitational back in 2009. 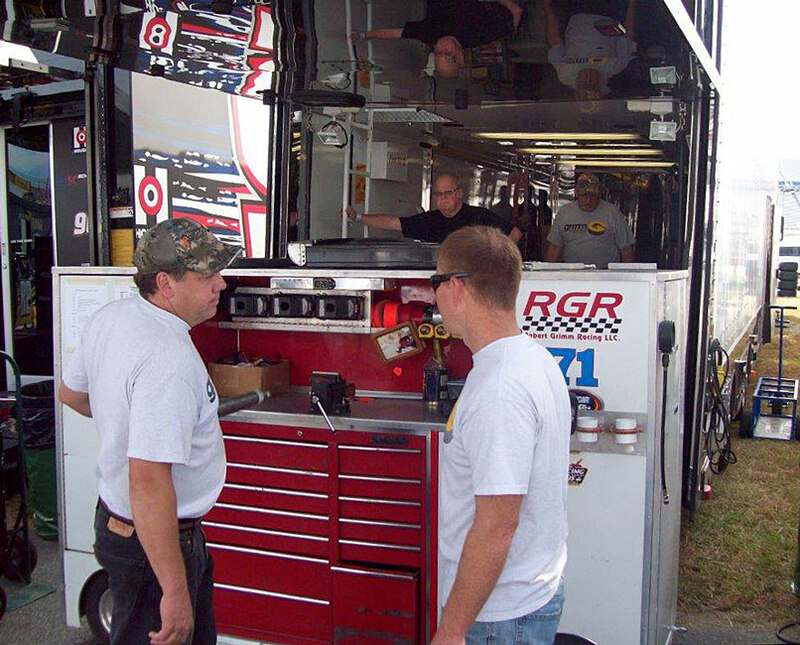 He became the first driver to win two ACT Invitationals when he took the checkers in 2011. 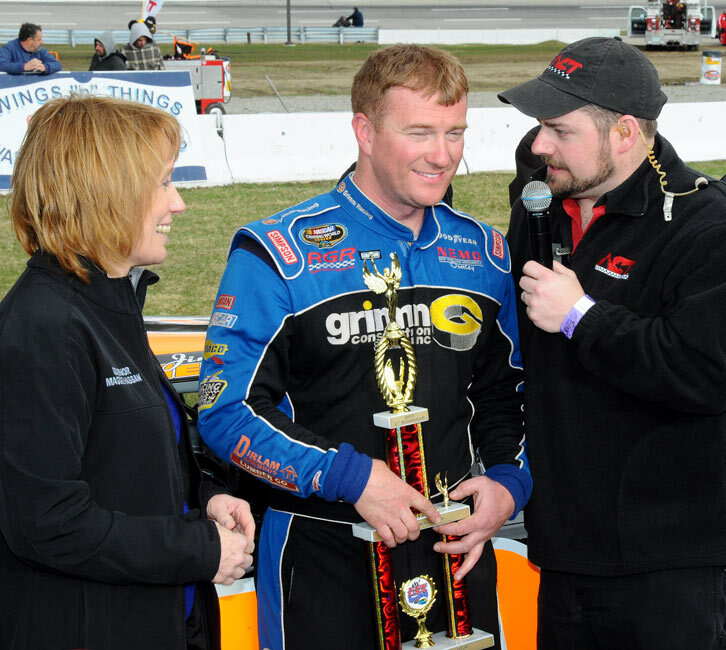 On Saturday, he became the first to win it a third time, crossing the Granite Stripe to win the American-Canadian Tour Bond Auto Parts ACT Invitational at New Hampshire Motor Speedway. MacDonald (Rowley, Mass.) drove away from the field over the final 10 laps of the 50-lap feature, capping off a great day at the 1.058-mile speedway. MacDonald joins 15-year-old Cole Custer (K&N Pro Series East) and Todd Szegedy (Whelen Modified Tour) as Saturday's winners. MacDonald ran a strong race, avoiding trouble and staying ahead of the likes of ACT points leader Wayne Helliwell Jr. and Brian Hoar. 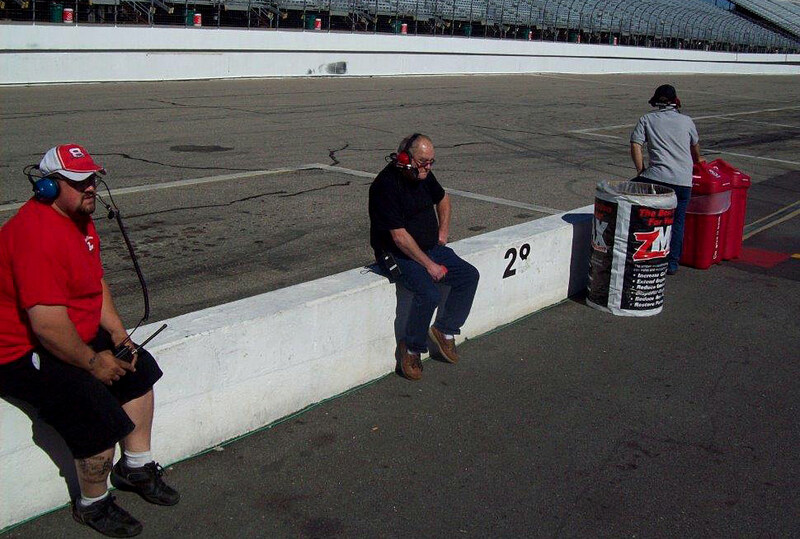 "I just love racing at NHMS," said MacDonald. "These guys are the best in the sport, it is tough to get by them. We are all pretty equal. You are not going to fool these guys too much." 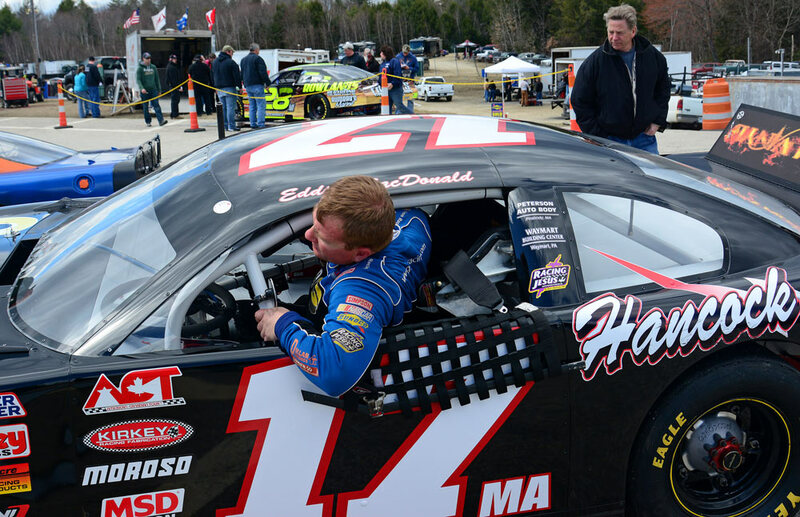 Helliwell, a native of Dover, N.H., who leads the ACT with 12 top-10s in 13 starts, ran up front for most of the second half of the race, but didn't have enough left in the tank for MacDonald at the end. "We made really good strides with this team," said Helliwell. "We definitely crossed the T and dotted the I today. I am not complaining about second." 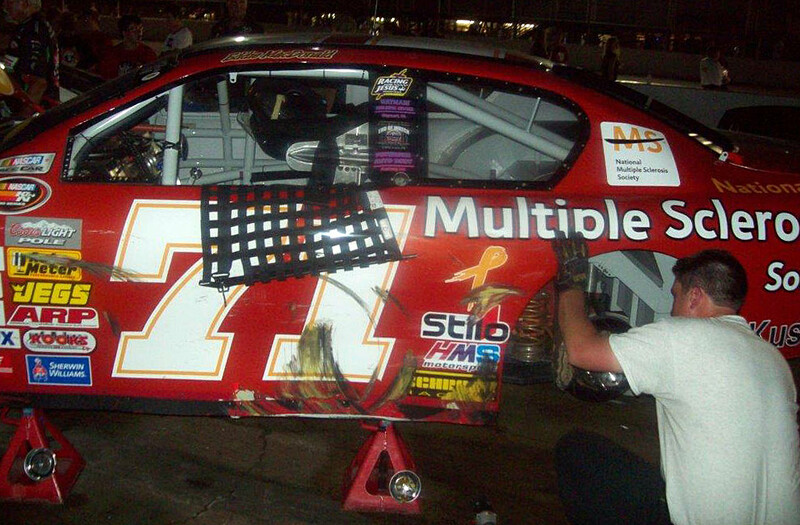 Hoar (Williston, Vt.) led twice for 13 laps, but knew he didn't have anything for MacDonald. "I got to the outside and made a pretty good move and got to the front," said Hoar. "I tried to save something. I knew with Eddie going fast it was going to be tough to chase him down." 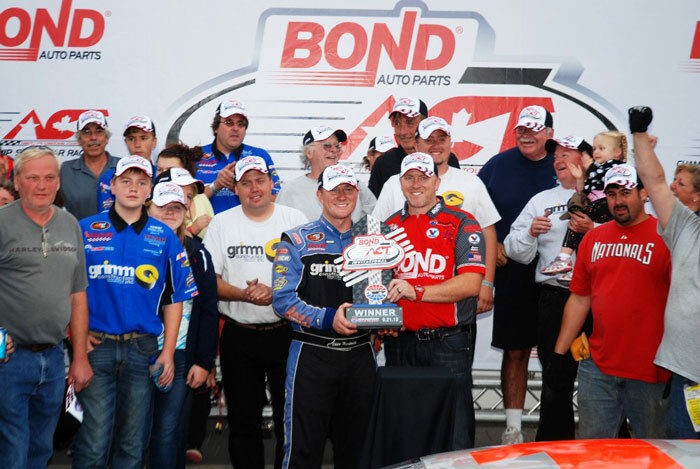 The Bond Auto ACT Invitational took place on September 21 as part of a spectacular triple header which also featured the NASCAR Whelen Modified FW Webb 100, and the NASCAR K&N Series North American Power 100. 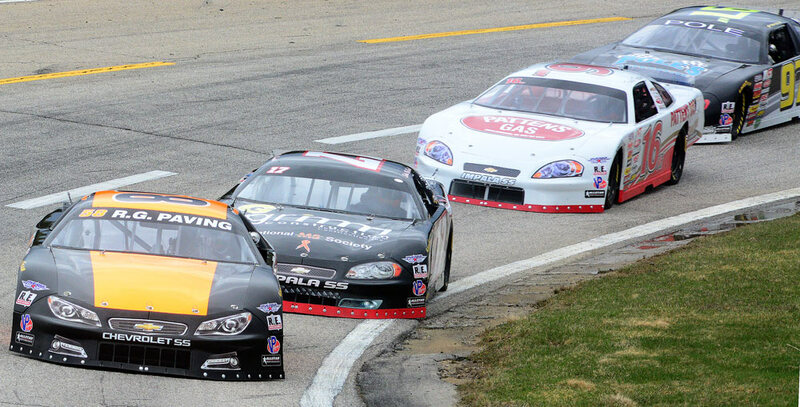 The 43-car field for the 5th Annual Bond Auto ACT Invitational at New Hampshire Motor Speedway has been announced. 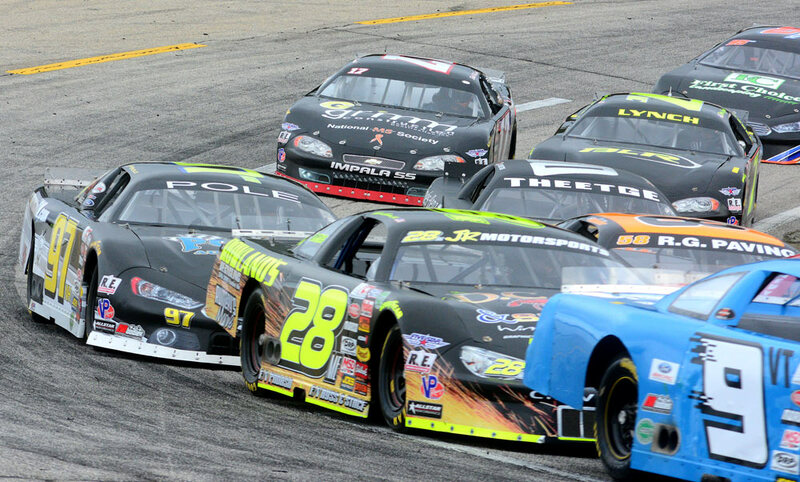 The biggest names in American Canadian Tour Late Models will be on hand for the event on Saturday, September 21. The field will be led by twelve drivers who have won an Invitational qualifier event. A strong contingent from New Hampshire includes Wayne Helliwell, Jr. and Joey Polewarczyk, Jr. Vermont drivers Brian Hoar, Jimmy Hebert, Bobby Therrien and Cody Blake claimed qualifier wins. From north of the border, Quebecer’s Jean-François Déry, Alex Labbe, Donald Theetge, Dany Trepanier have all won qualifying events. Travis Stearns of Maine and Eddie MacDonald of Massachusetts complete the 12 Invitational Qualifier winners. The remainder of the field includes American Canadian Tour regulars Ben Lynch, Glen Luce, Kyle Welch, Ray Parent, Rowland Robinson, Jr., Luke Hinkley and Todd Davis. Completing the Canadian group are Série ACT’s Jonathan Bouvrette, as well as Ontario’s Sean Kennedy and Bryan Mercer. 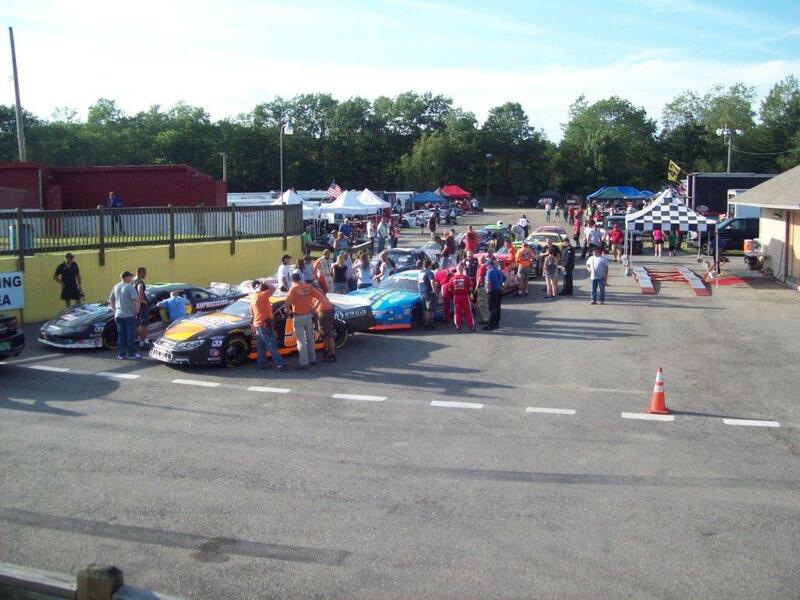 Representatives from several tracks around the Northeast will also be on hand. 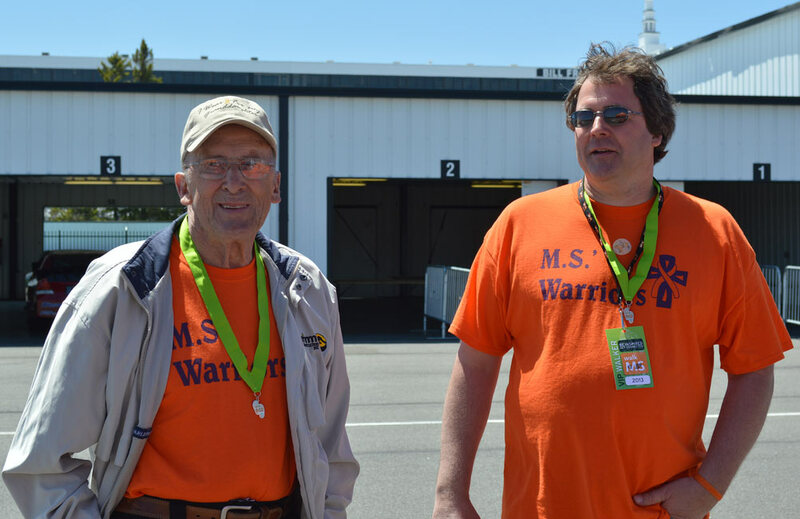 From Thunder Road, Ricky Roberts, Emily Packard, Jamie Fisher, Matt White, and the Grandfather/Grandson combo of 70-year-old Joey Laquerre and 16-year-old Joey M. Laquerre. Devil’s Bowl Speedway’s Brandon Atkins and Josh Masterson also accepted invites. DAYTONA BEACH, Fla. – NASCAR announced today, September 9th, that the NASCAR K&N Pro Series East event scheduled for Rockingham (N.C.) Speedway on Saturday, Nov. 2 has been cancelled. 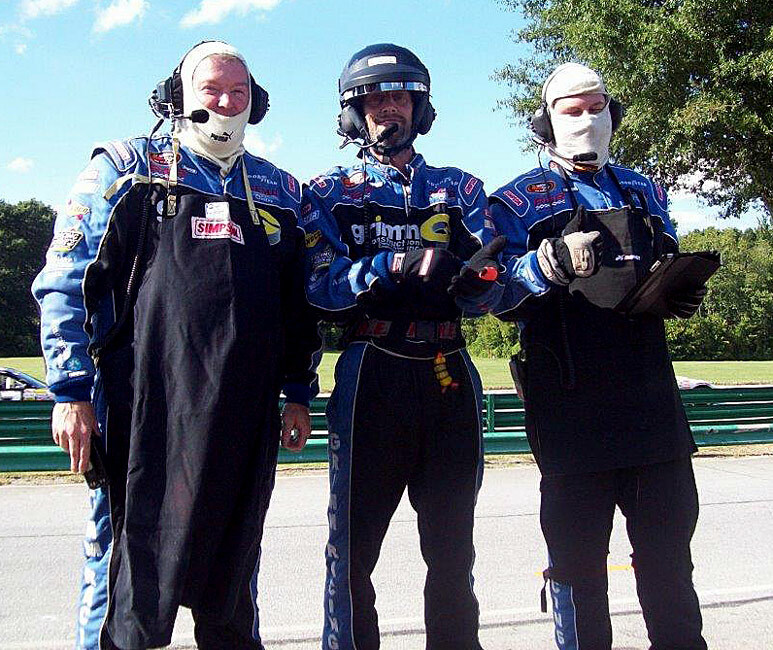 The race at Road Atlanta in Braselton, Ga., on Friday, Oct. 18 now will be the season ending points race. 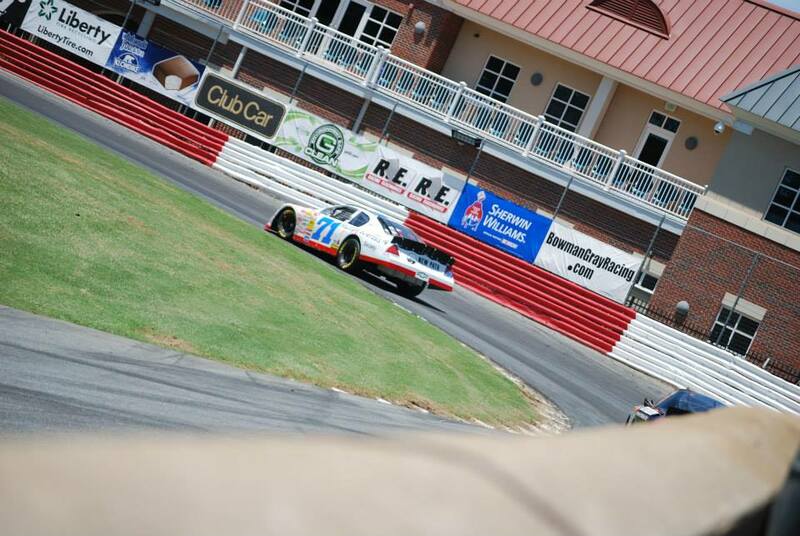 The event is part of the 16th annual Petit Le Mans weekend for American LeMans Series. 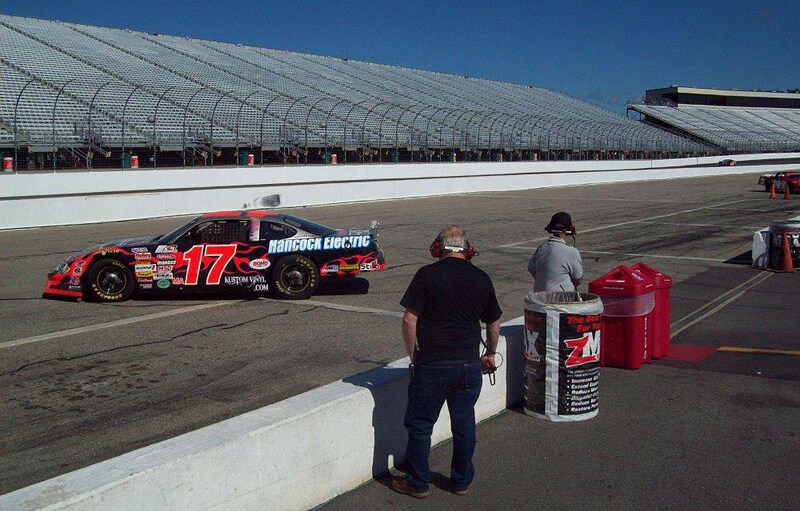 in the K&N Pro Series East race the same day. 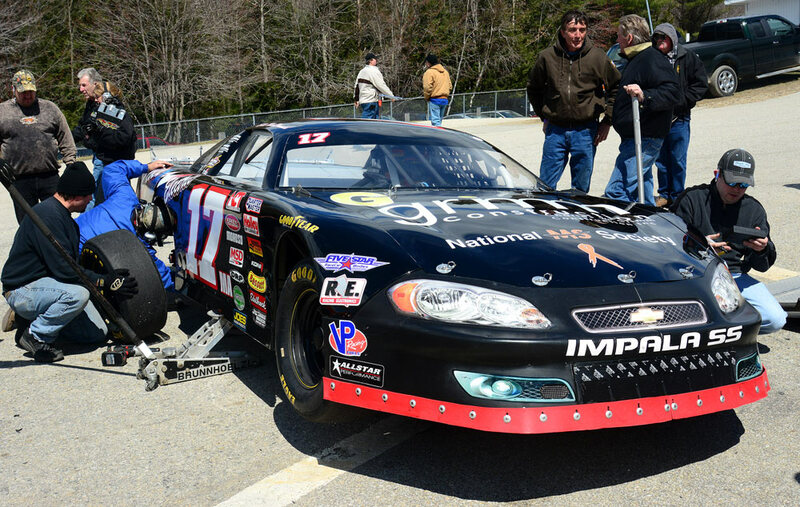 Eddie drove from his twelfth place starting position to finish fourth in the Kevin Whitaker Chevrolet 140 at Greenville Pickens Speedway in the eleventh K&N Pro Series East race this season. 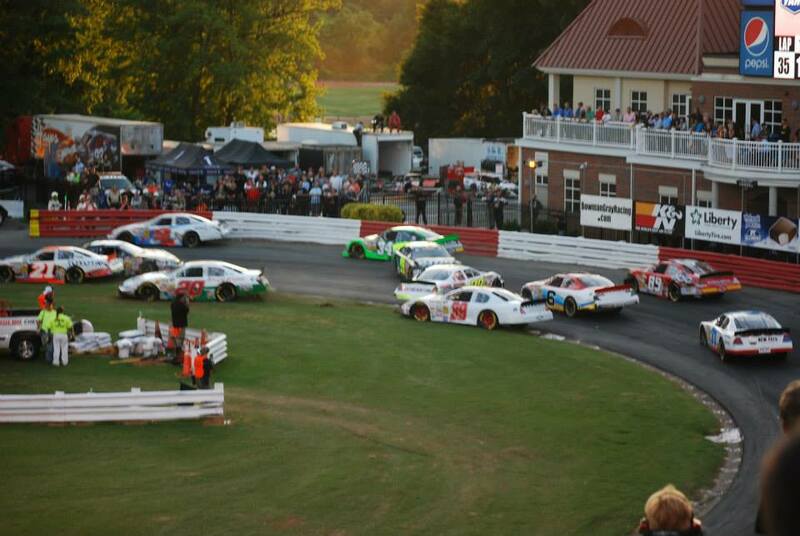 It was the second visit to the “Old House of Racing” this season with MacDonald taking the checkers in eighth place in the March race. Monday’s Labor Day finish solidifies Eddie Mac’s fourth place standing in the point’s race trailing third place by only four points with four races remaining. 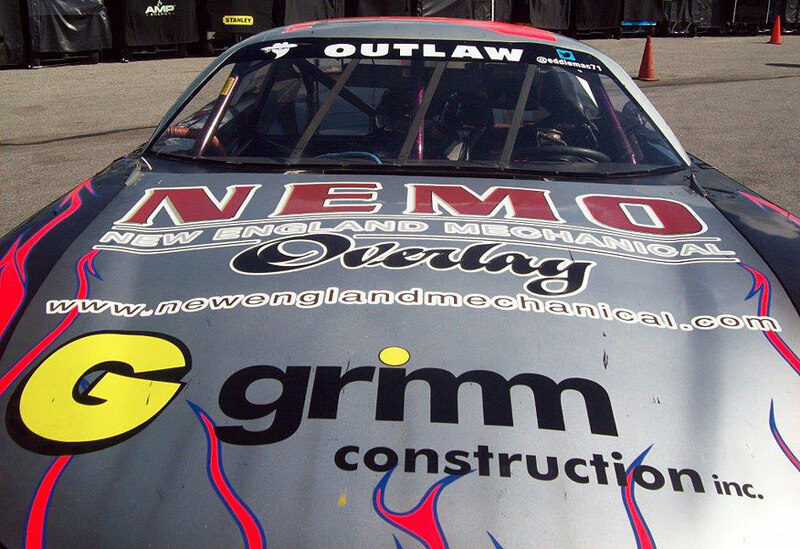 Eddie Mac and the Grimm Racing Team will pull double duty at New Hampshire Motor Speedway on Saturday, September 22, racing in the K&N Pro Series East’s North American Power 100 and the American Canadian Tour’s ACT Invitational 50 lap event as part of the big NASCAR Cup weekend. FS1 will televise the Kevin Whitaker 140 on Sunday, September 22, at noon. 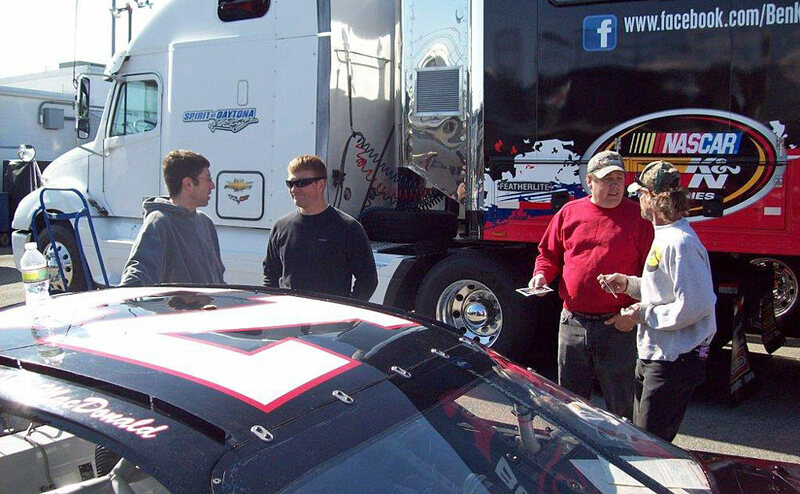 The Race: The third edition of the Kevin Whitaker Chevrolet 140 will mark the 11th all-time event for the NASCAR K&N Pro Series East at Greenville Pickens Speedway, and the second of two in 2013. The Procedure: The maximum starting field will be 28 cars, including provisionals. The first 24 starting positions will be based on two-lap time trials and the remaining four will be filled through the provisional process. The race will be 140 laps (70 miles), run straight through with no tire changes. 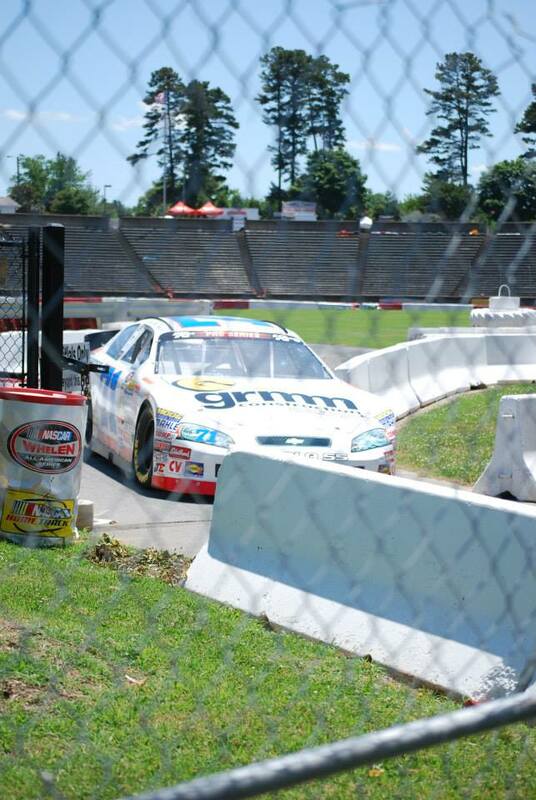 The Track: Greenville is a half-mile asphalt oval with five degrees of banking in the turns. 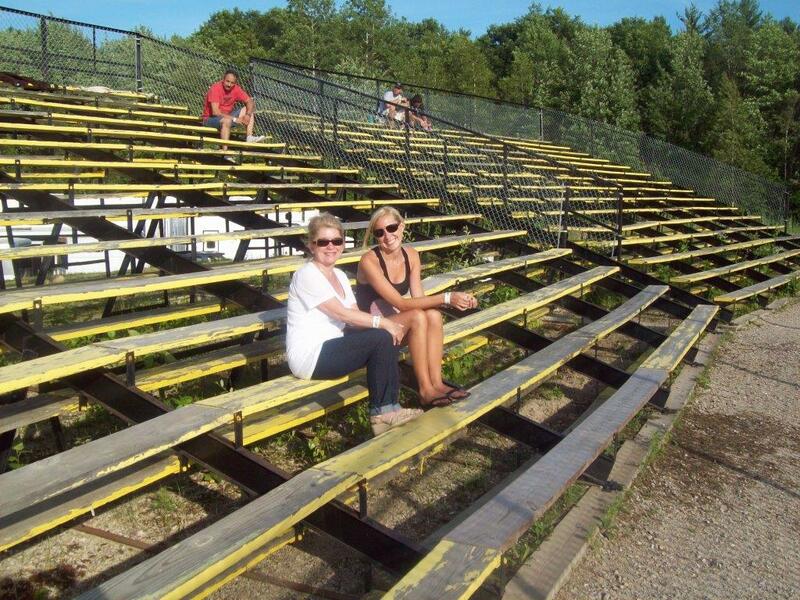 The facility opened in 1946 with a dirt racing surface and was paved in 1970. There were 29 NASCAR Sprint Cup Series races held there from 1951-71. 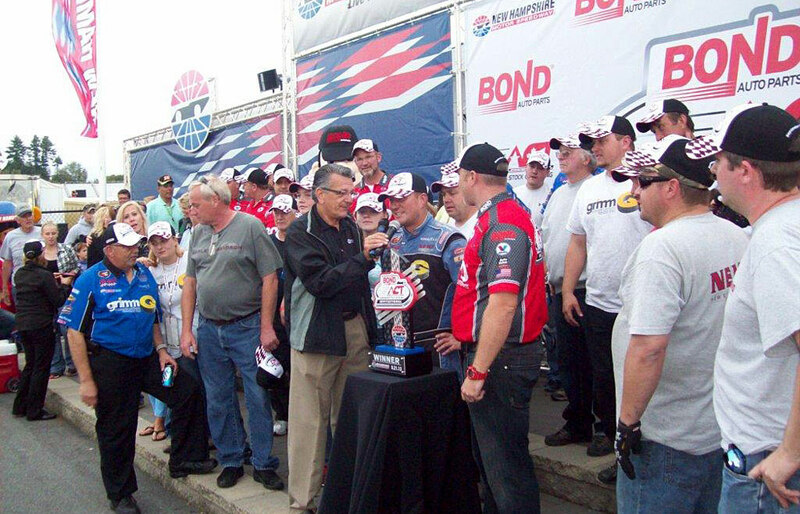 Race Winners: The 10 previous K&N Pro Series East races in Greenville have produced nine different winners. Only Darrell Wallace Jr. has won at the track twice. Brandon Gdovic captured checkers in the first 2013 race. Pole Winners: Like with race winners, there has been only one driver to earn multiple poles at GPS – Brett Moffitt – with three. 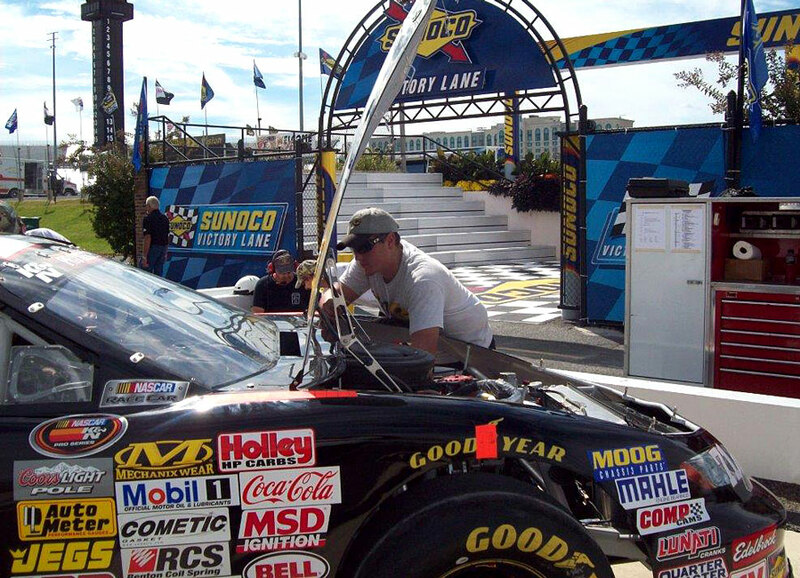 Moffitt set the qualifying record at 20.534 seconds (87.659 mph) in the 2011 season-opener, and his 2010 pole eclipsed Joey Logano’s series record as the youngest pole winner at 16 years, eight months. 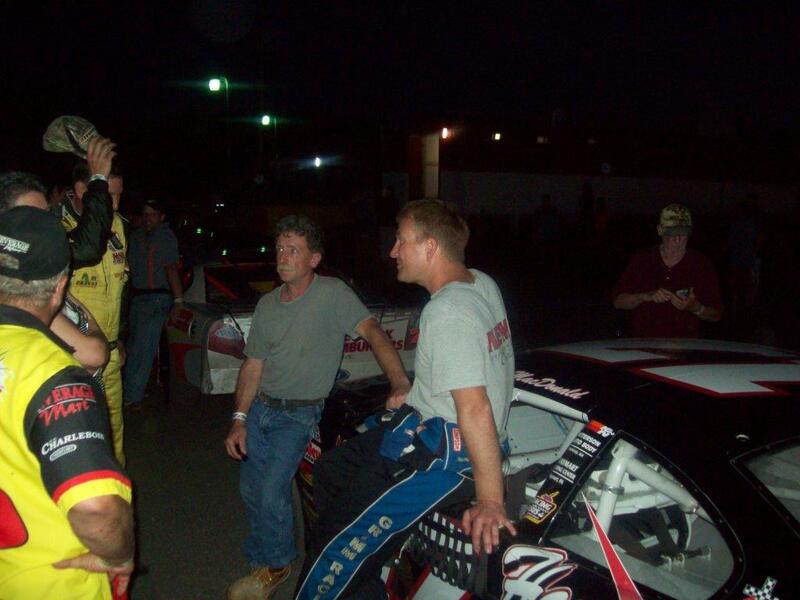 • Has six wins, two poles, 31 top fives and 82 top 10s in 168 career series starts. • Ranks fourth in points with seven top 10s in 10 outings, highlighted by a runner-up finish at August Iowa. • Has an average finish of 10th and a best result of third in nine career GPS starts. 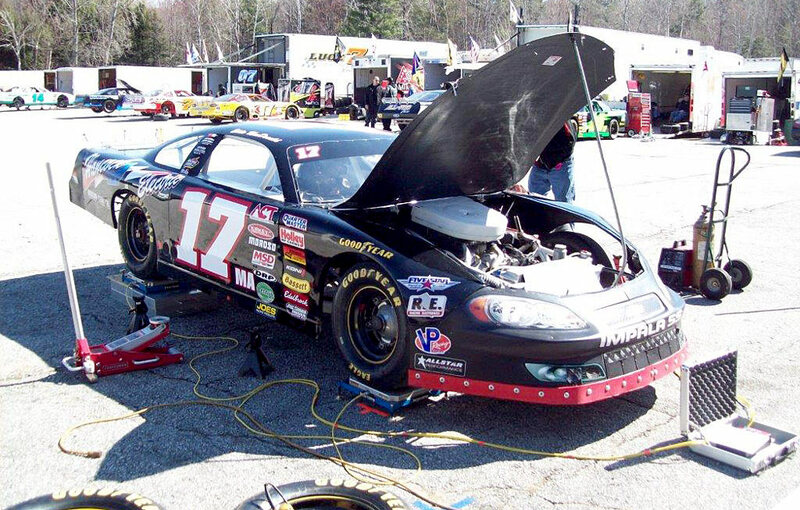 • The 10 previous NASCAR K&N Pro Series East races at Greenville Pickens Speedway have produced nine different victors and eight different pole winners. 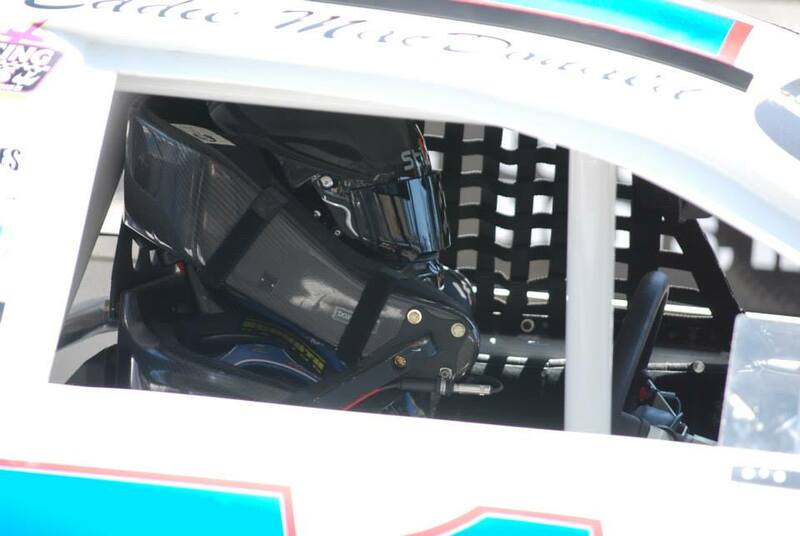 • Brett Moffitt has six track records at GPS including the best average finish, most laps led and most poles. 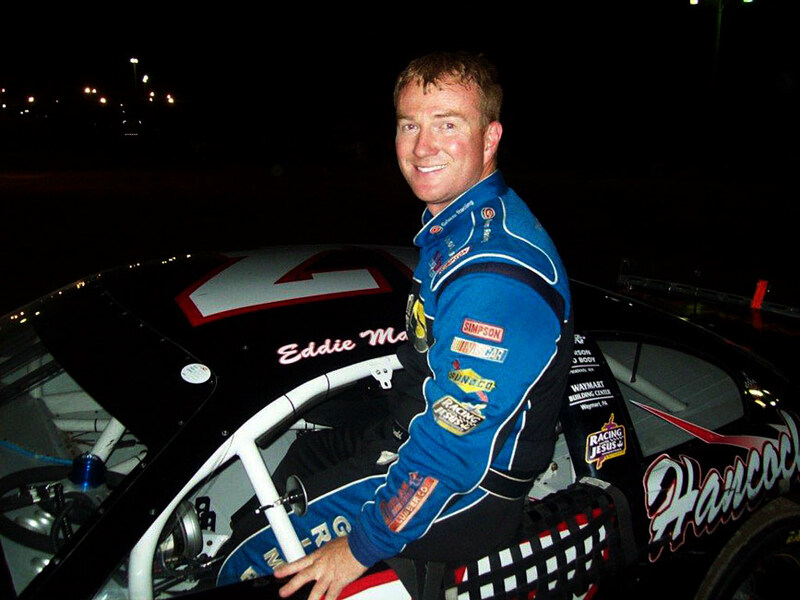 • Eddie MacDonald’s nine starts are the most in series history at GPS, and he’s tied with Moffitt for the most top-10 finishes at the track with six. 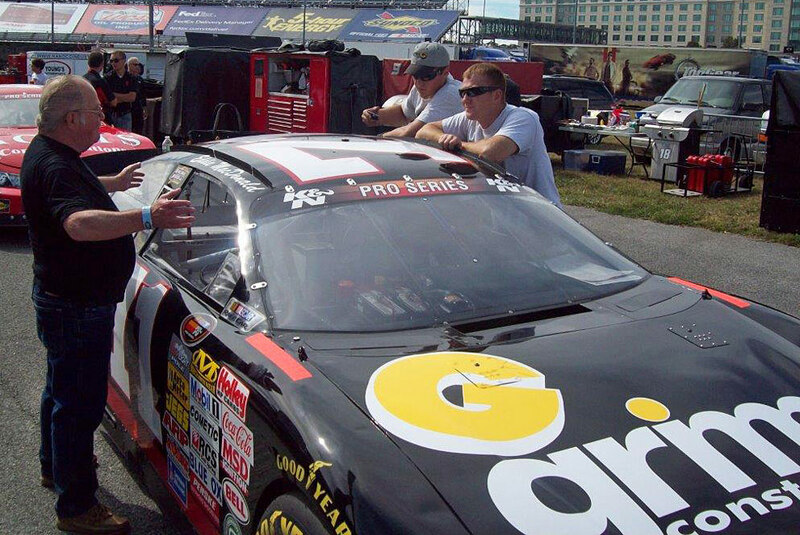 • Season points leader Dylan Kwasniewski made his NKNPS East debut at GPS in 2012 and drove from the rear to finish seventh. • Opened on July 4, 1946 as a dirt track. The race surface was converted to asphalt in April, 1970. 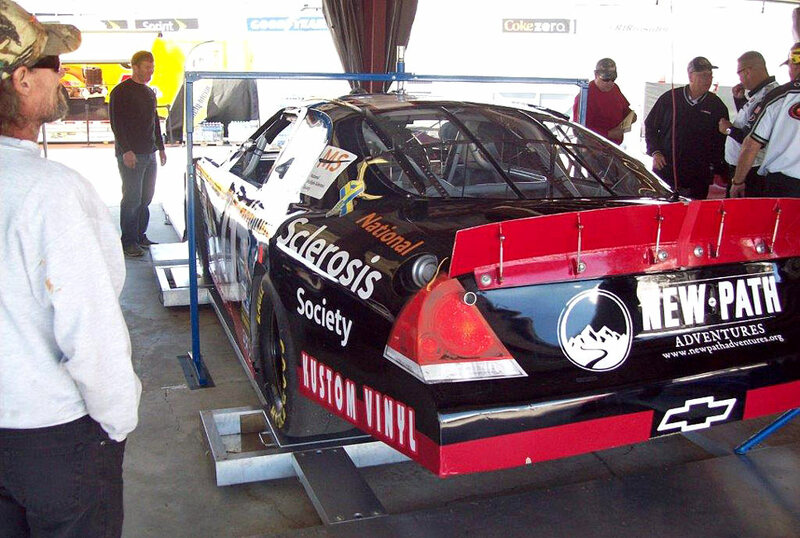 • The NASCAR K&N Pro Series East held its inaugural Greenville Pickens Speedway race on June 6, 2006 and has returned every year since. This is the third season in a row that the track has held two events. • Corey LaJoie took the checkered flag in this event last year while Brandon Gdovic won this season’s first event there. Darrell Wallace Jr. is the only driver in the first 10 races at GPS to earn two victories. • Brett Moffitt is the only driver to capture more than one pole at GPS. He has three, including the first event there this year. • In the first 10 NKNPS East events there have been two drivers that have won from the pole: Joey Logano (2007) and Moffitt (2011). Moffitt also set the track qualifying record in 2011. 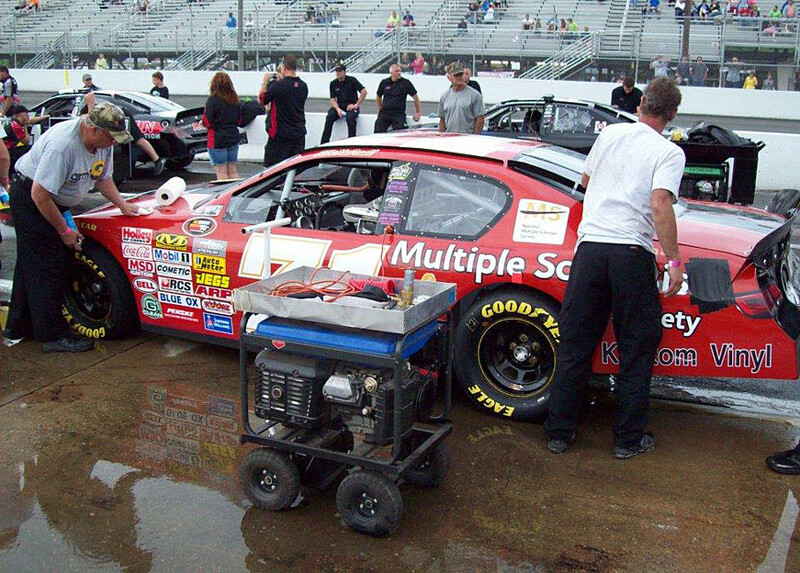 • Logano, Austin Dillon (2008), Gdovic (2013) and Wallace (2010) earned their first career NKNPS East wins in events at Greenville. 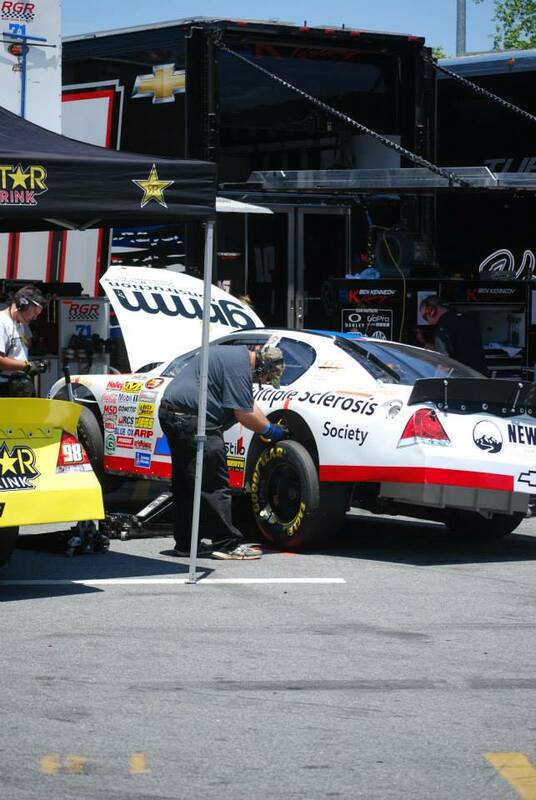 The K&N Pro Series East’s inaugural visit to Virginia International Raceway in Alton, Virginia in the Biscuitville 125 on Saturday marked the first appearance for the series on a road course since Lime Rock Park in 2010. Eddie MacDonald struggled in practice and qualifying on the 2.25 mile, 17 turn track yet posted a satisfying ninth place finish. 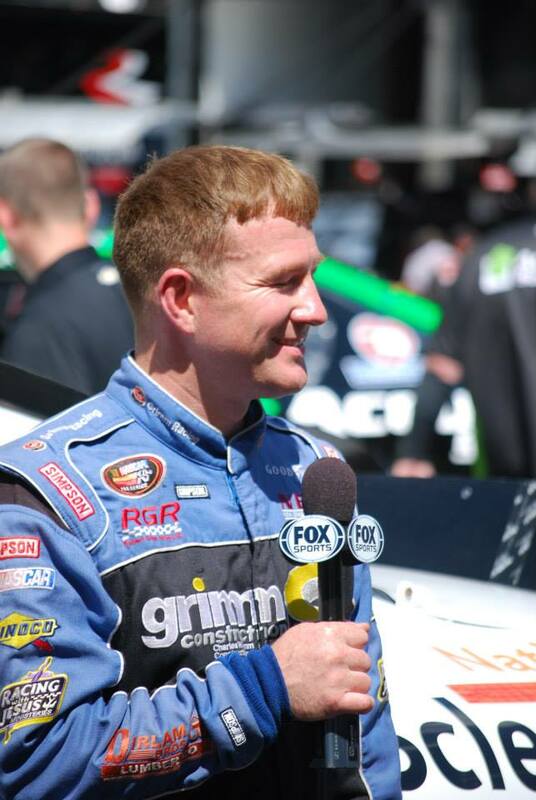 With his seventh top ten finish this season in ten races, both driver and team owner, Rob Grimm, improved to fourth place in the all-important point’s race. 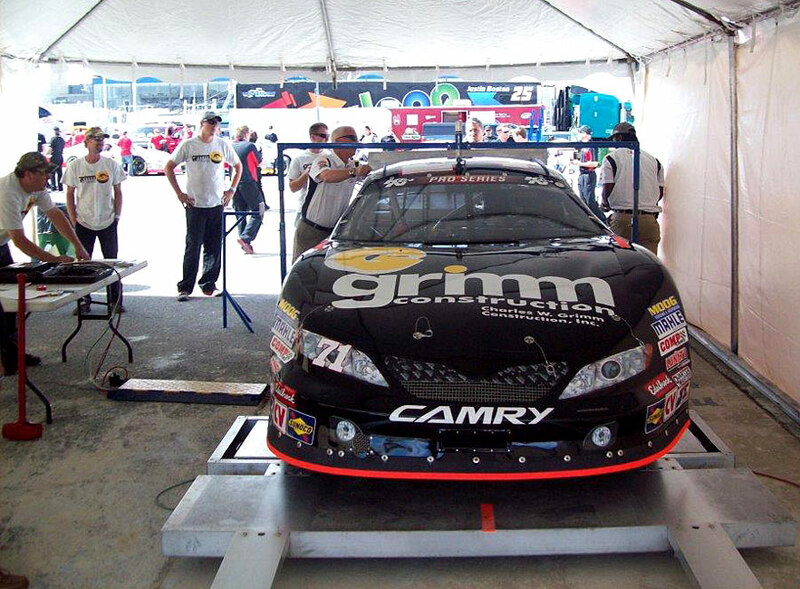 The Grimm Racing Team arrived at VIR for a full day of practice on Friday and it became clearly evident the Grimm Construction/ Multiple Sclerosis Chevy was down in horsepower to deal with the long straightaways and uphill configuration of the track. When the series ran at Lime Rock many teams suffered the loss of the spec engines that were clearly designed to run oval tracks and not designed for the rigors of right and left hand turns. 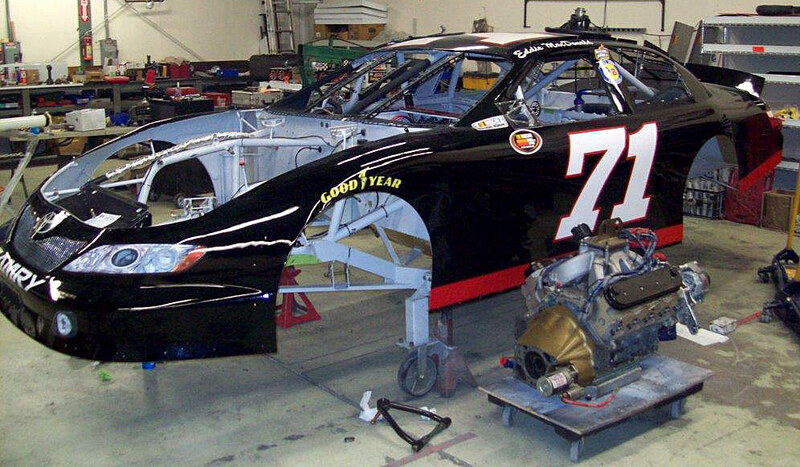 The #71 ran a “built” engine for durability then and ran the same engine at VIR this past weekend. “We knew we would be down in power but we felt if we could stay on the track until the finish, we would have a decent run,” said MacDonald. “Even with the fixes to the spec engines a number of them did blow up over the two days as did a number of transmissions. There were a lot of turns (17) with only three left handers so the track is really hard on equipment. The top guys had it figured out with speed ant handling but we are happy with the run we had. The car was not real fast but it was steady all through the race. We gained a spot in the point’s race (fourth) so overall it was a good day for us. 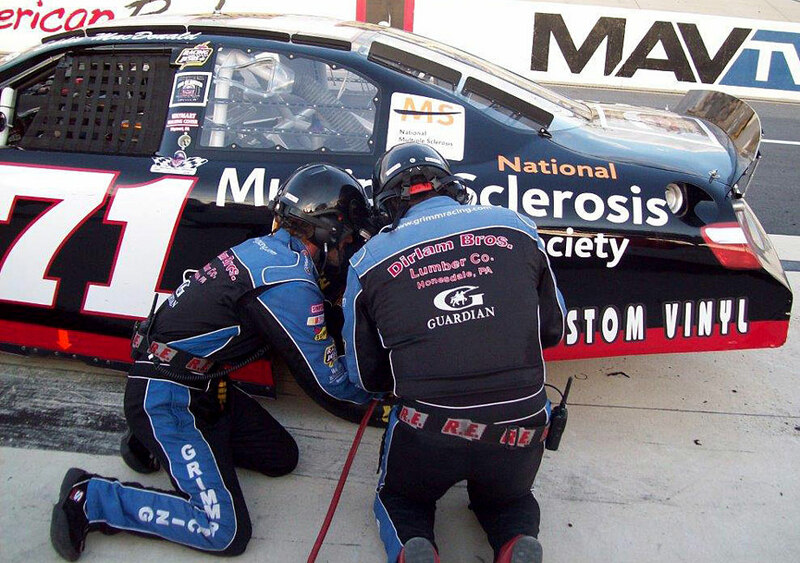 The Grimm Construction Multiple Sclerosis Chevy was 18th (133.888sec.) fastest in the 26 car field and slipped to 23rd in qualifying. Road Corse Qualifying is different from oval racing in that cars are sent out in seven second staggered groups depending on practice speed. Eddie Mac ran with the second group for eight minutes with the best lap scored for the starting grid for the 55 lap event. Only three caution flags for 13 laps made for long green flag runs with teams employing different pit strategy for fuel. No tire changes were allowed unless a tire went down on the track. Crew chief Rollie LaChance called Eddie Mac to the pits for fuel and minor adjustments on lap 36 while running fifth after most of the leaders pitted laps before the #71. MacDonald returned to the track in the 12th position then taking the 11th spot on the grid as the caution flag flew on lap 50 when the engine on the #6 car of Daniel Suarez erupted on the front straight right in front of Eddie Mac’s pit sending oil everywhere. 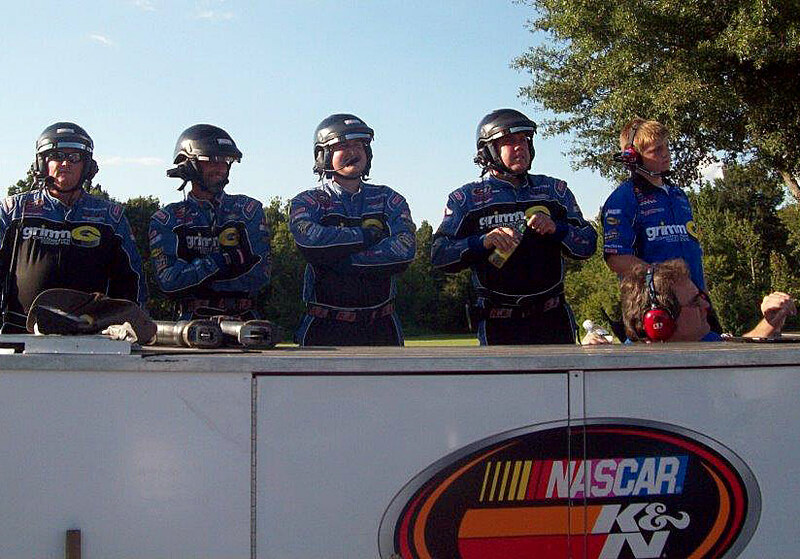 On Monday, September 2 the K&N Pro Series East will take the green flag in the Kevin Whitaker Chevrolet 140 at the famed half mile at Greenville Pickens Speedway (SC). 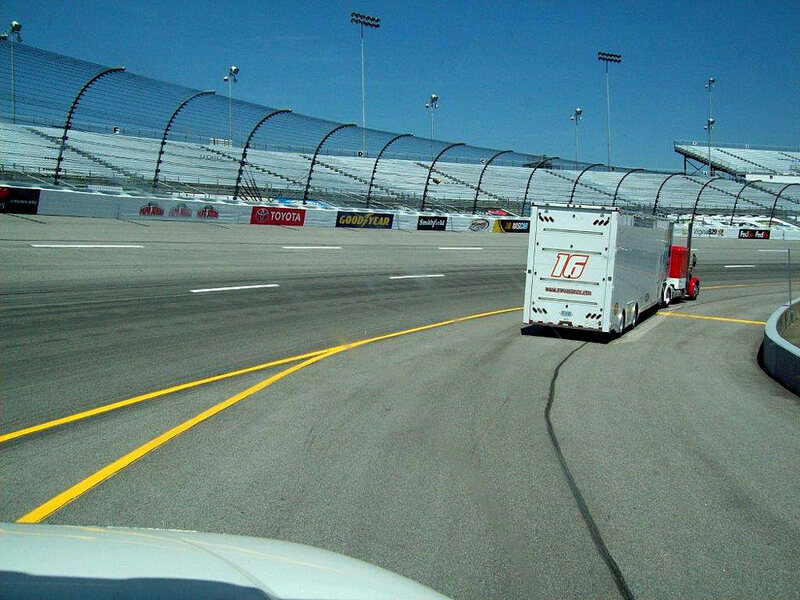 The Race: The Biscuitville 125 will be the 10th of 15 races on the 2013 NASCAR K&N Pro Series East schedule. 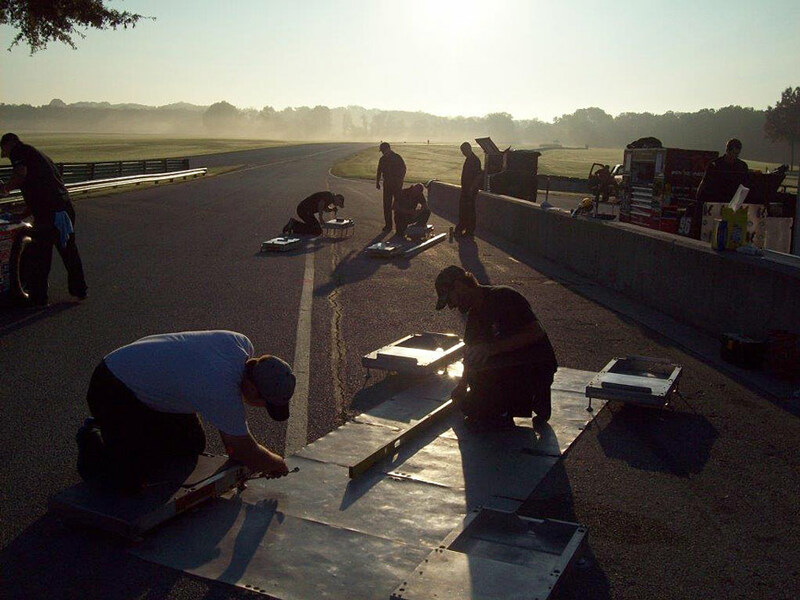 It’s the first time the series has visited the Virginia track and the first road course event for the series since July 2010 at Lime Rock Park in Lakeville, Conn. 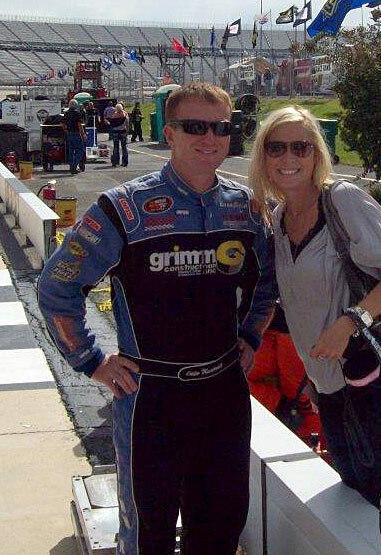 It is also the third of three visits to the Commonwealth of Virginia for the series having already competed at Richmond International Raceway in April and Langley Speedway in Hampton in June. The Procedure: The starting field is 30 cars, including provisionals. The first 26 cars will qualify through NASCAR road race style group qualifying. The remaining four spots will be awarded through the provisional process. The race will be 55 laps (123.75 miles). The Track: VIRginia International Raceway originally opened in 1957 and was closed from 1974 to 2000 when it was reopened by Harvey Siegel. VIR offers five track configurations. The Full Course is 3.27 miles in length while the Patriot Course stretches for 1.1 miles entirely inside the Full Course. The North Course measures 2.25 miles in length and the South Course covers a distance of 1.65 miles. The Grand East course is the longest configuration at 4.2 miles and is made up from the Full and Patriot courses. Overall, the facility includes three separate paddocks with timing towers, separate skid pads, covered tech bays in the North Paddock, classrooms, full service restaurants, pro shop, restrooms with showers and several lodging options. 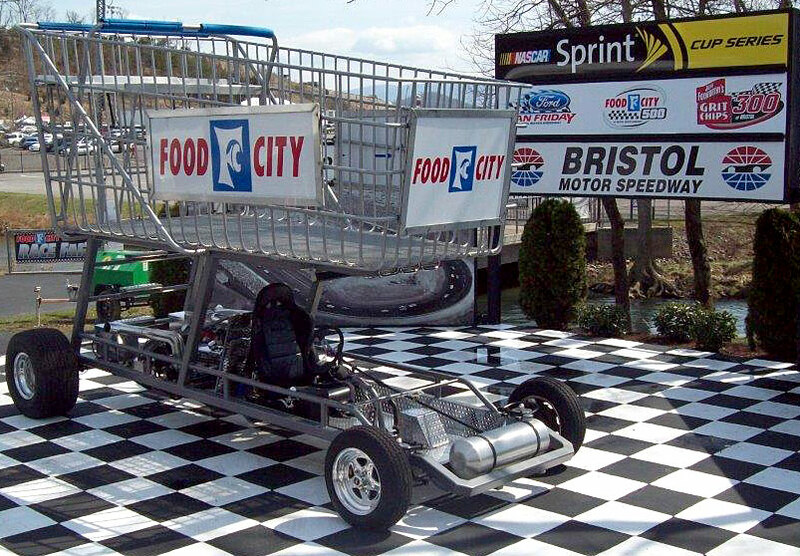 The Biscuitville 125 will be contested on the North Course. 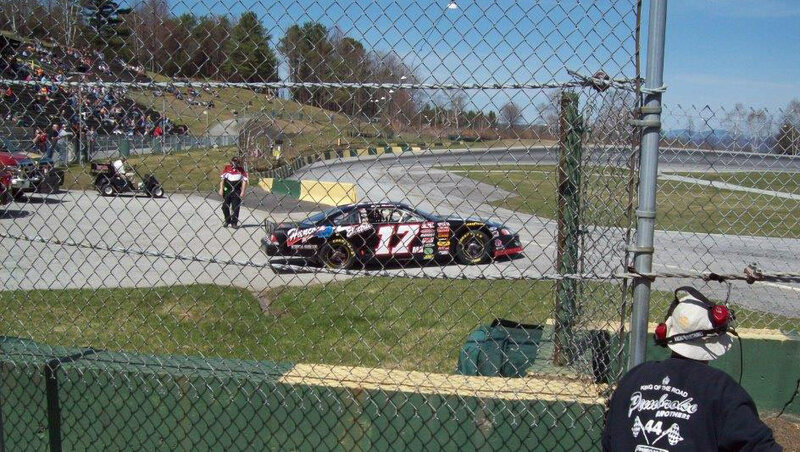 • The K&N Pro Series East has not competed on a road course since a July 2010 date at Lime Rock Park in Lakeville, Conn.
• Twelve of the expected 25 entrants in the Biscuitville 125 have no appreciable road-course experience in a stock car. 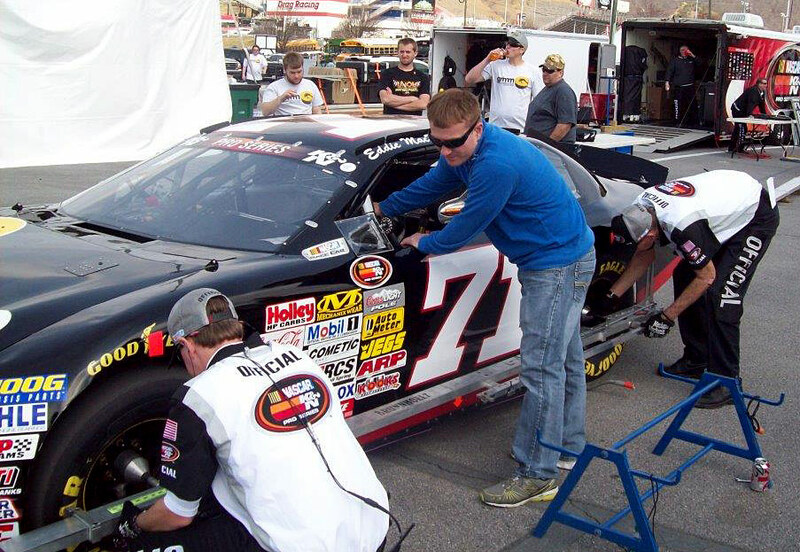 • Series point leader Dylan Kwasniewski made seven road-course starts while competing in the NASCAR K&N Pro Series West with an average finish of 13.57; average finish of 3.75 in four road course starts last season. 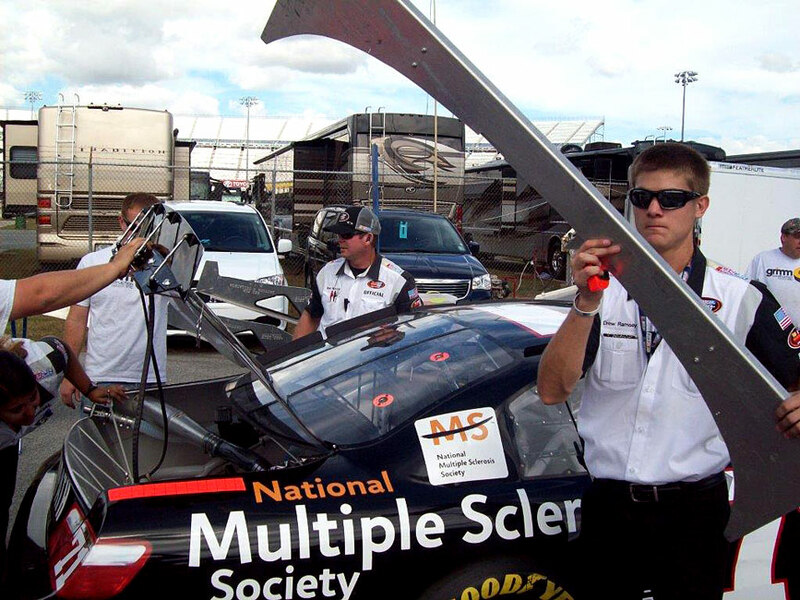 • Andrew Ranger and Daniel Suárez have road course wins this season in NASCAR series. • Opened in 1957 and was closed from 1974 to 2000 when it was reopened by Harvey Siegel. • Offers five track configurations. The Full Course is 3.27 miles in length while the Patriot Course stretches for 1.1 miles entirely inside the Full Course. The North Course measures 2.25 miles in length and the South Course covers a distance of 1.65 miles. The Grand East course is the longest configuration at 4.2 miles and is made up from the Full and Patriot courses. 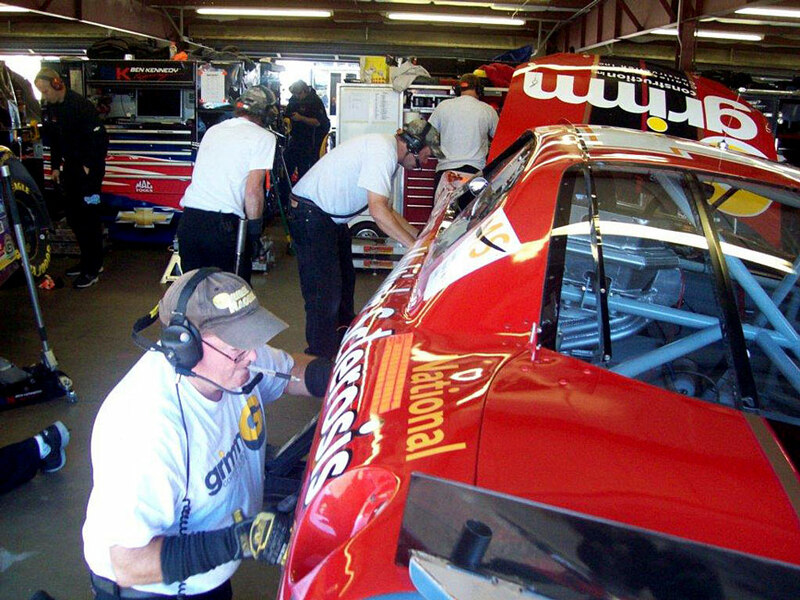 • Has hosted numerous test sessions for NASCAR’s top-three national series. 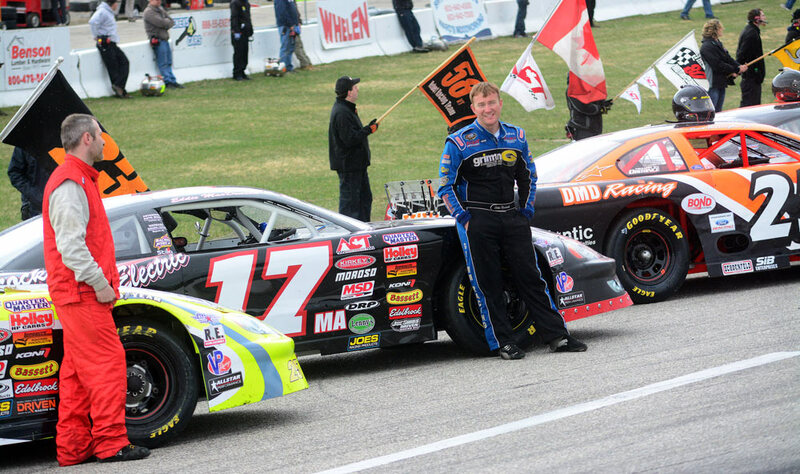 Eddie Mac’s fantastic run in the American Canadian Tour 150 at Beech Ridge Motor Speedway on Saturday night went right down to the final two laps before pulling out the crowd-pleasing finish. 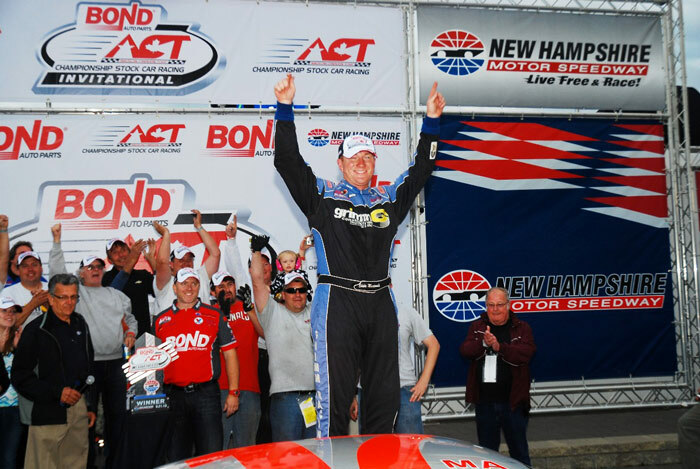 The Rowley, Mass veteran racer battled Joey Polewarczyk then Bobby Therrien in the final thirteen circuits to post his first ACT win of the season to guarantee a starting position in the 5th Annual Bond Auto Act Invitational at New Hampshire Motor Speedway on Sept. 21. 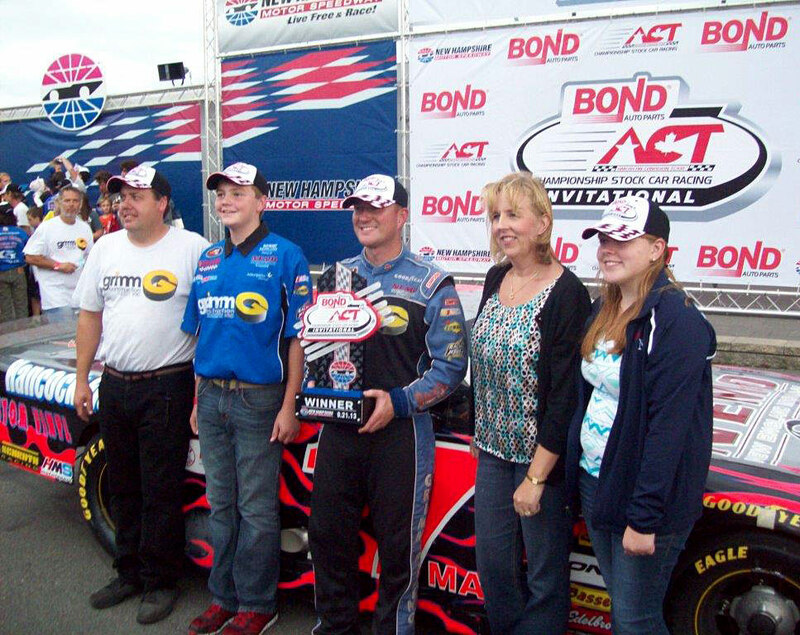 MacDonald has two NHMS wins to his credit, including the first ACT race there in 2009. The Hancock Electric sponsored Chevy posted the fastest time in the second of three practices (15.809 sec.) and easily won the heat from the pole position. 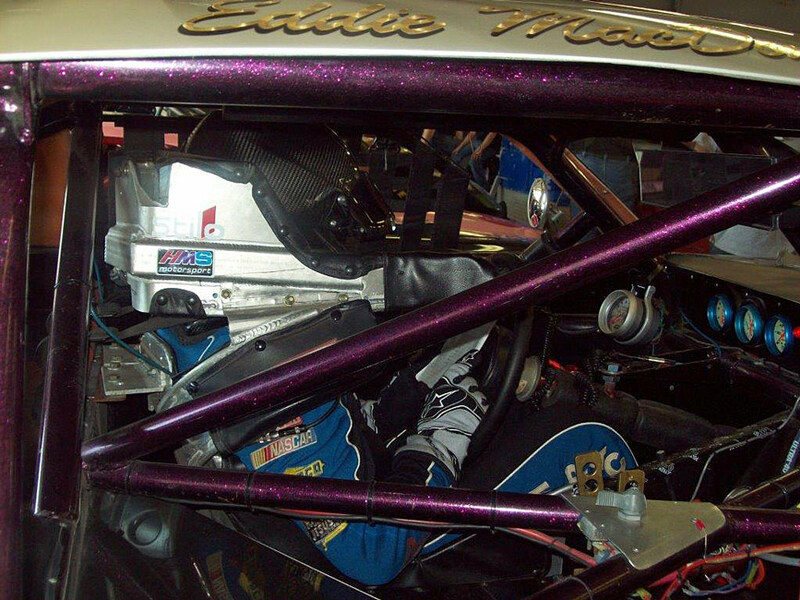 With the starting grid established using a plus/minus system, Eddie Mac placed 11th on the grid for the 150 lap event based on a “flat” finish in the heat. Twenty-five cars took the green flag that was only slowed with four caution flags. 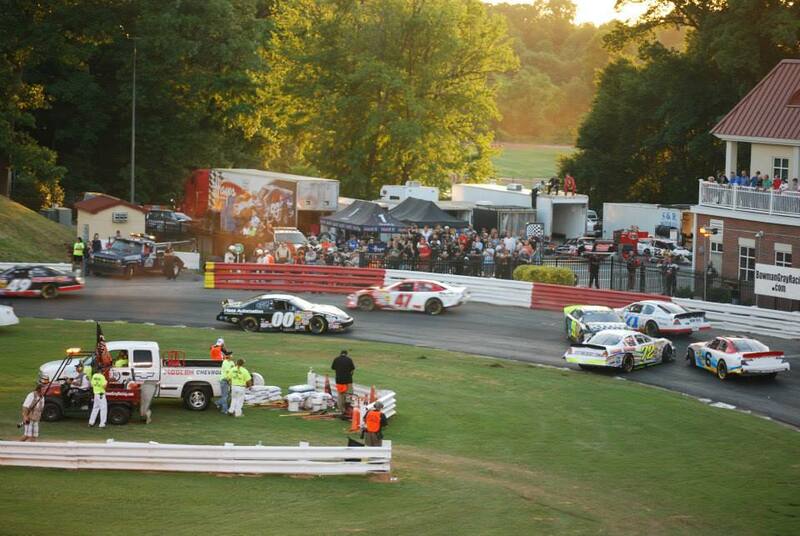 After an early caution on lap 6, the action was not slowed until the next yellow flew on lap 124. Pole took the lead on lap 112 with MacDonald powering past the second place Farrington on lap 126 after a lap 124 restart. A power move by MacDonald from the outside on a lap 131 restart pushed the Hancock Electric Chevy past Pole for the lead that would be relinquished for only two laps (138-139) with the furious challenge of Bobby Therrien. On the restart after the final caution flag on lap 137, Eddie Mac was busy holding off Pole on the outside when Therrien made a spectacular move to the inside to give MacDonald a race to the finish. The race was not settled until the final two laps when Eddie Mac was able to pull away for the win. “The finish was a lot of fun,” said the winner. 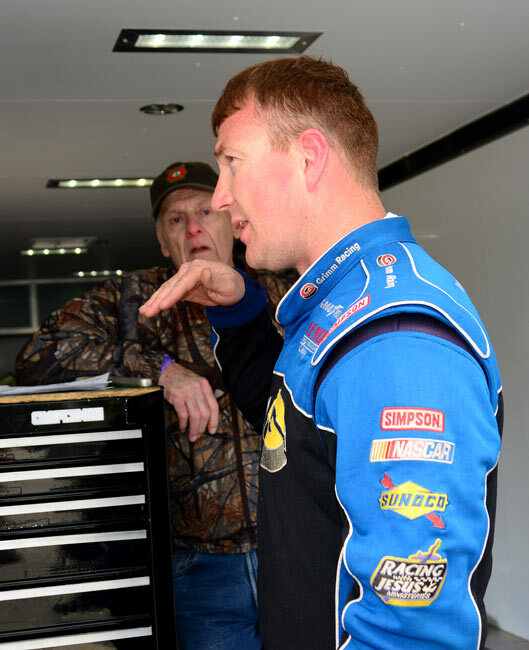 “I had a great battle with Joey and all of a sudden I heard Logger (spotter) say “inside.” I said “Who the heck is that?” Then the battle was on with Bobby and I was lucky enough to pull away for the win. 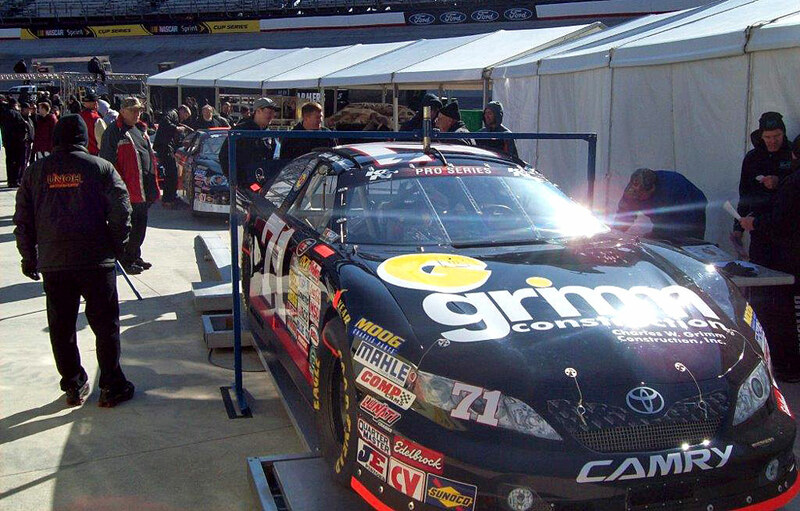 Eddie, Rollie, and the Grimm Racing Team will race in the K&N Pro Series East inaugural event on the road course at Virginia International Raceway on Saturday, August 24. 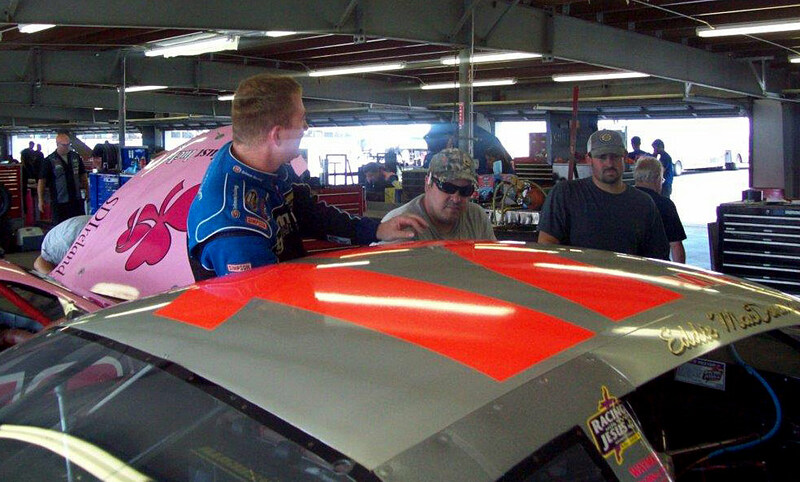 From the first practice Eddie MacDonald battled his car then thirty-nine other opponents to post a hard-earned second place finish in the NASCAR K&N Pro Series’ Pork Be Inspired 150 at Iowa Speedway. 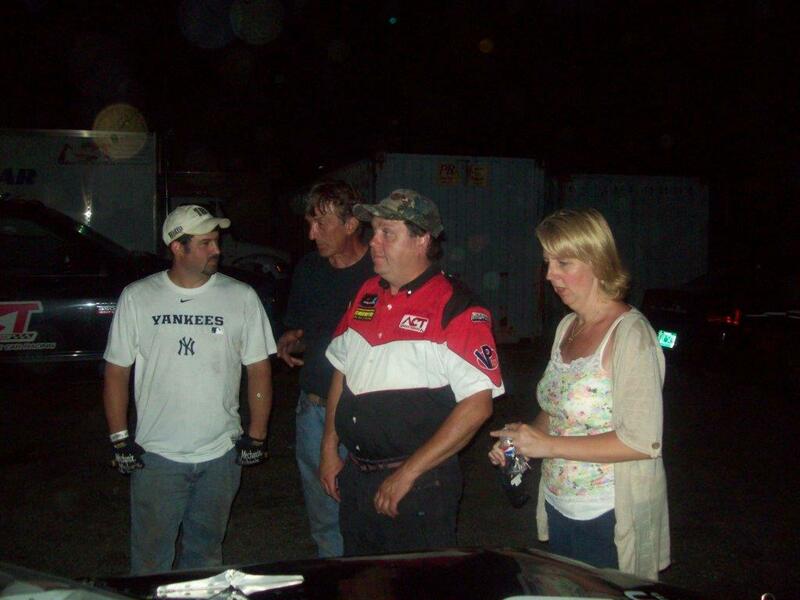 The race was the second of two combination East/West Series events held on the fast 7/8 of a mile speedway. 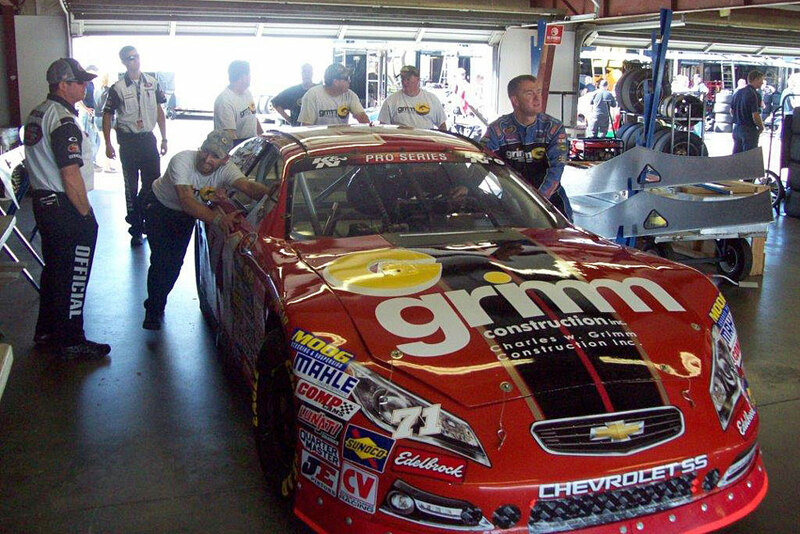 The new Grimm Construction/MS Society Chevy gave the crew fits in the first practice but really came on at the end of the race while the competition faded. The second practice saw some improvement with new tires (22nd) along with a qualifying run of 18th with MacDonald saying, “I probably could have driven it in a lot harder in qualifying but the car was still tight and I didn’t want to push it. Starting 18th was tough so we decided to take what we could in the first segment then make adjustments at the halfway break. 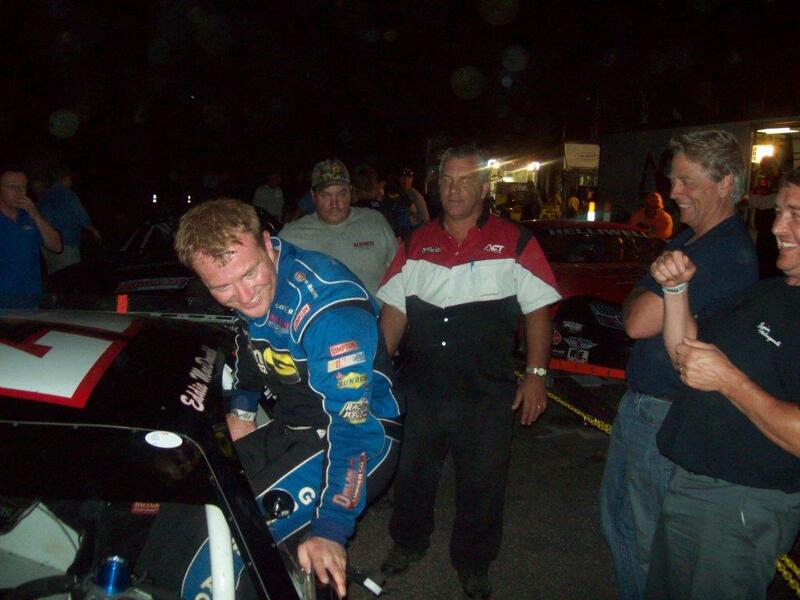 With the second place run, both driver and car owner, Rob Grimm, moved in to the fifth position in the point’s race after nine races. 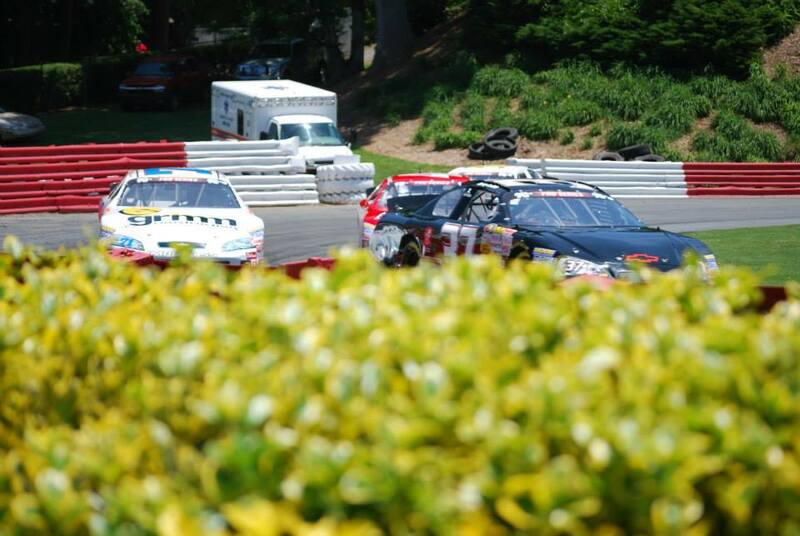 The K&N East Series returns to action on the road course of Virginia International Raceway on August 24. It will be the first visit for the East Series on the challenging road course with another road event scheduled for October 18 on Road Atlanta. 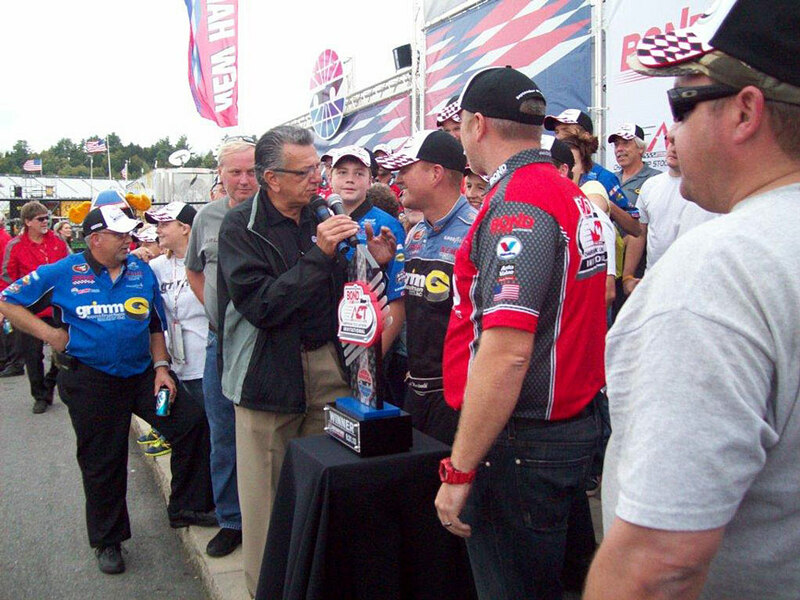 The Pork Be Inspired 150 will be televised on August 25 at 1 p.m. on Fox Sports1. 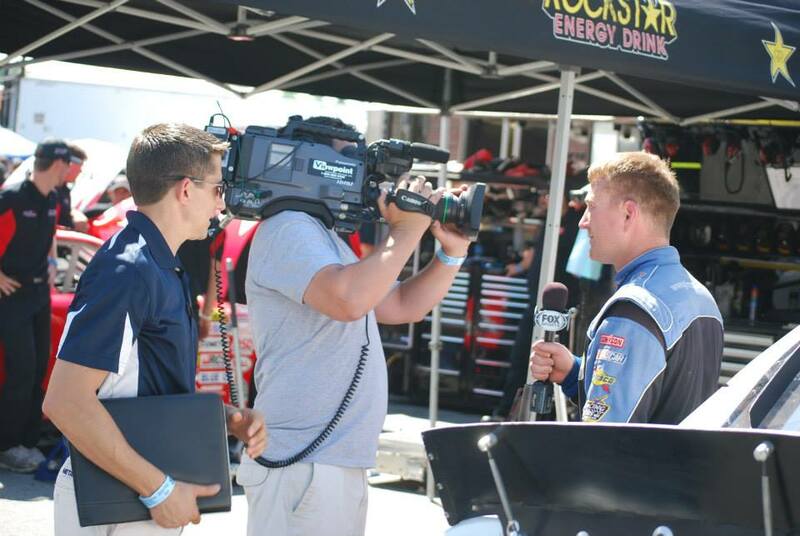 It is the first NASCAR touring series to air on the network, which will carry the touring series through the year. 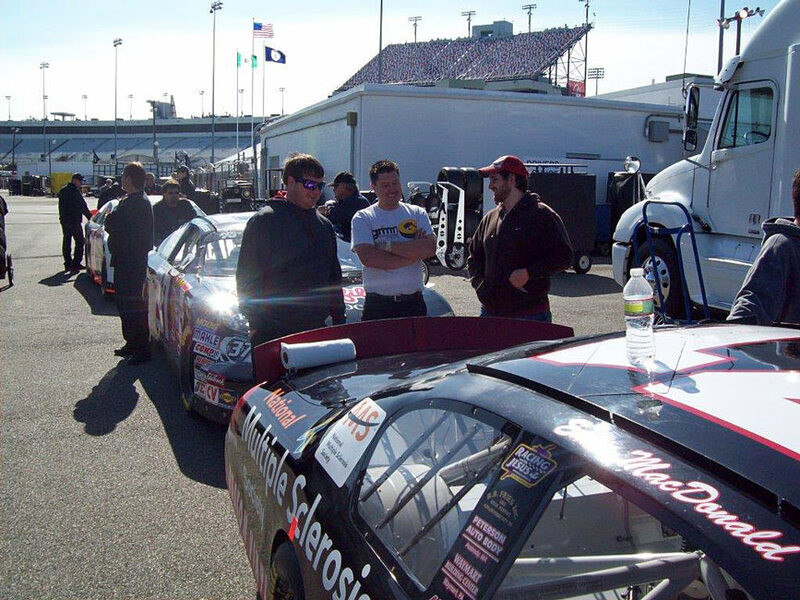 The Race: The Pork Be Inspired 150 will be the ninth all-time NASCAR K&N Pro Series East-West combination race at Iowa Speedway, and the second of two at the track in 2013. The Procedure: The starting field is 36 cars, including provisionals. The first 28 cars will qualify through two-lap time trials. The remaining eight spots will be awarded through the provisional process. The race will be 150 laps (131.25 miles) and will be run in two segments with a midway break at or near the conclusion of Lap 75. The Track: Iowa Speedway is a .875-mile paved oval with the turns banked 12-14 degrees, four degrees of banking in the backstretch and 10 degrees in the frontstretch. 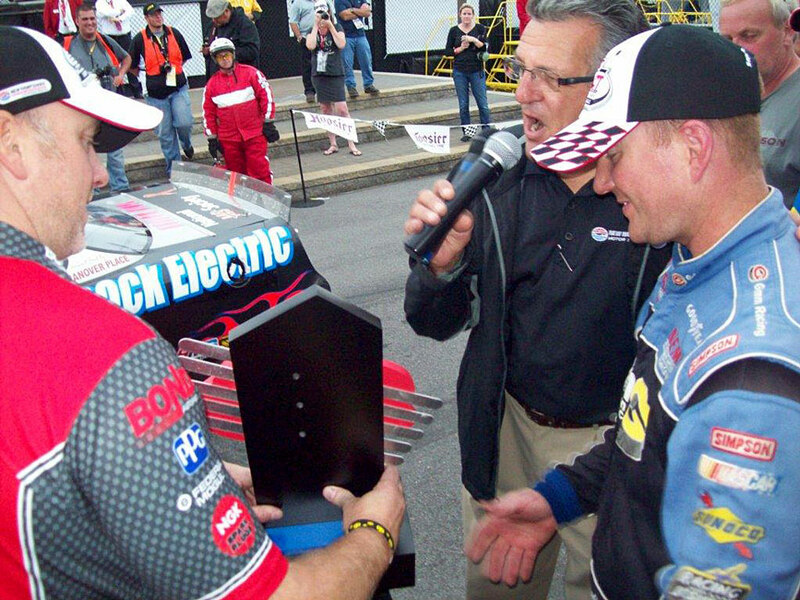 Race Winners: The eight previous editions of the NASCAR K&N Pro Series East-West combination race have each produced a different overall winner. Cale Conley won this event last year as a representative of the East while West driver Michael Self took the checkered in this season’s first Iowa event. Pole Winners: As with race winners, each of the first eight Iowa combo races has also produced different overall pole winners. Cale Conley earned the pole for this race last year while the best qualifier in this season’s first Iowa event was Anderson Bowen. Records: Qualifying: Kyle Busch, May 17, 2009, 135.484 mph, 23.250 sec. ; 150-Lap Race: Corey LaJoie, Aug. 3, 2012, 88.883 mph, 1 hour 28 minutes 36 seconds. • There have been eight previous East-West combination races at Iowa Speedway – one each year from 2007-2011, two in 2012 and one earlier this year. 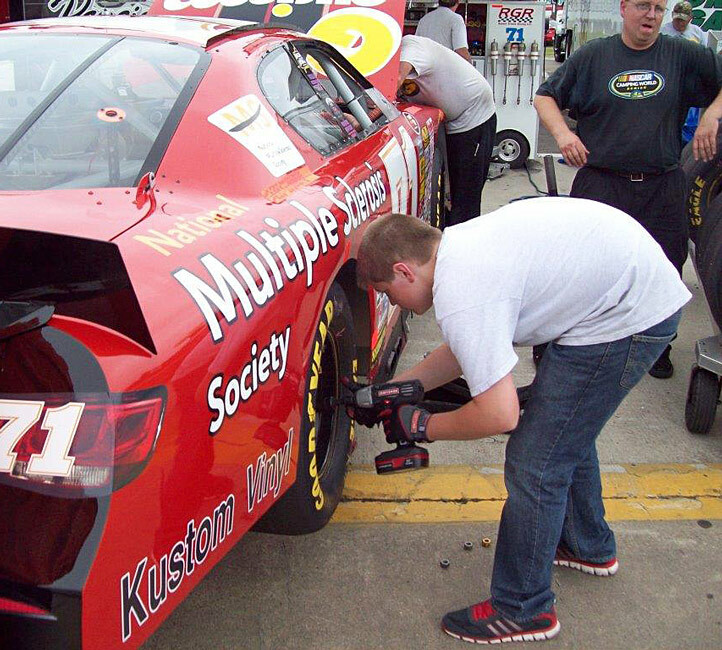 • Iowa Speedway is located about 30 miles east of Des Moines. 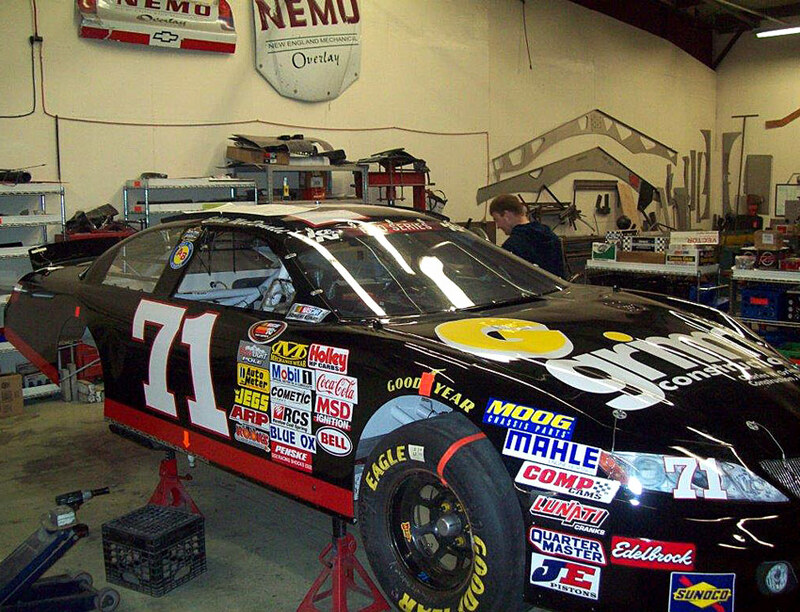 It was designed by NASCAR Hall of Fame driver Rusty Wallace. The track opened in September of 2006. • The eight East-West combination events have resulted in eight different winners – Joey Logano (2007), Brian Ickler (2008), Kyle Busch (2009), Max Gresham (2010), Brett Moffitt (2011), Chase Elliott (May 2012), Corey LaJoie (Aug. 2012) and Michael Self (June 2013). • The eight events have also produced eight different Coors Light Pole winners – Kevin Harvick (2007), Austin Dillon (2008), Kyle Busch (2009), David Mayhew (2010), Matt DiBenedetto (2011), Brett Moffitt (May 2012), Cale Conley (Aug. 2012) and Anderson Bowen (June 2013). • Kyle Busch was the only driver to win the E-W race at Iowa from the pole. Chase Elliott started the furthest back and won, coming from 15th on the grid last year. • Brett Moffitt has the most top-five finishes in E-W action at Iowa, with four, and the most top 10 finishes, with five. • With an average of 5.33, Elliott and Jesus Hernandez have the best average finish among drivers with at least three starts in E-W competition at Iowa. • Moffitt has led the most laps of competition in E-W action at Iowa, leading the way for 387 circuits. • Eric Holmes is the only driver to start all eight E-W combination races at Iowa. • Three of the eight East-West combination races at Iowa were extended by a late-race caution for a green-white-checkered finish, including the one earlier this year. 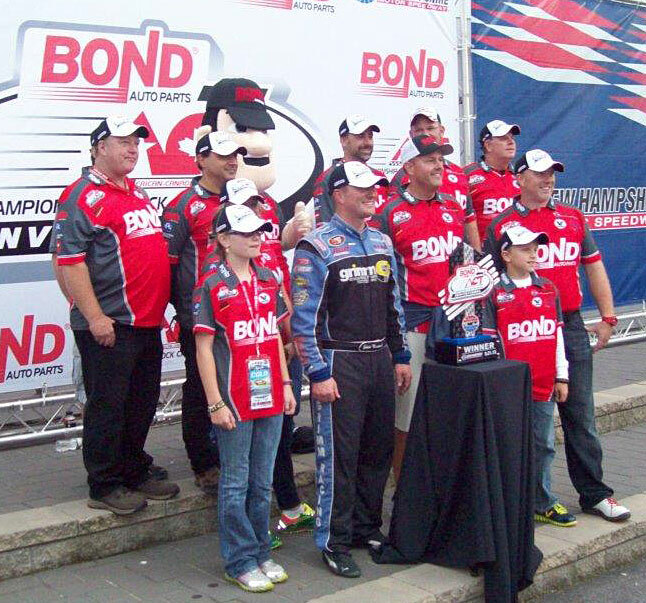 • Chevrolet has gone to Victory Lane in four E-W events at Iowa, while Toyota has three wins and Ford has one. • 158 different drivers have competed in the eight E-W combination events at Iowa. 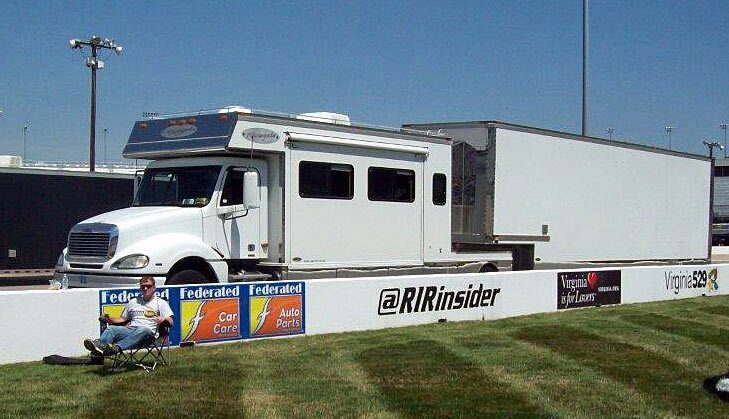 Eddie MacDonald survived the grueling ACT International 500 in Plattsburgh, N.Y. in the American Canadian Tour’s inaugural event nosing out Booby Therrien at the line on the final lap for fourth place in the final segment to vault the veteran racer into a third place overall finish. The two day event on the half mile oval in upstate New York culminated with three segments on Sunday for 100 laps each with 40 cars taking the first green flag. 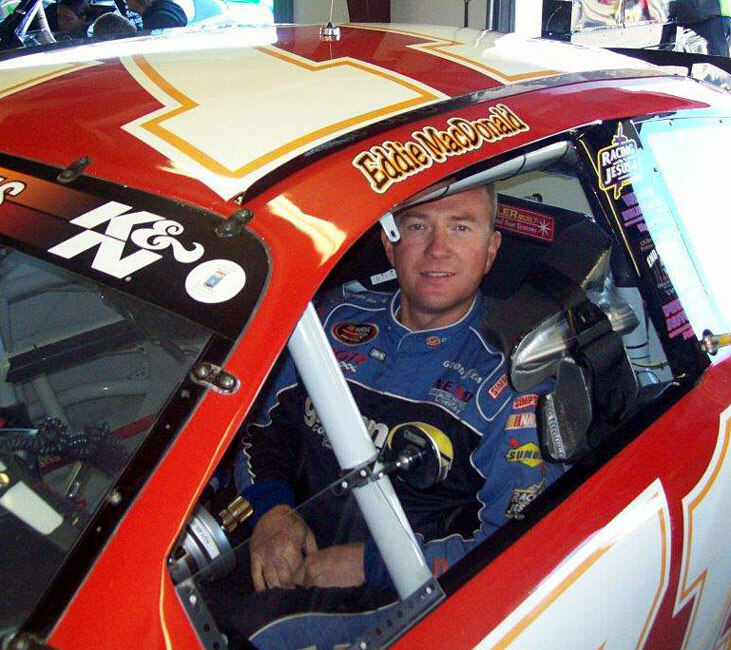 Eddie Mac ran fourth, fifth, and fourth in the Hancock Electric sponsored Chevy in the three segments for a combined score of 13, good enough for third place behind ACT‘s dominant performers in winner Joey Pole and runner-up Brian Hoar. The Freddie Peterson owned Chevy came from a tenth starting position in the heat to nip Brent Dragon at the line to advance to the feature with a +4 rating. The long time K&N Pro Series East and part-time ACT driver took the green flag in the fifth spot in the first 100 lap segment. The field would be inverted in each of the final two segments. 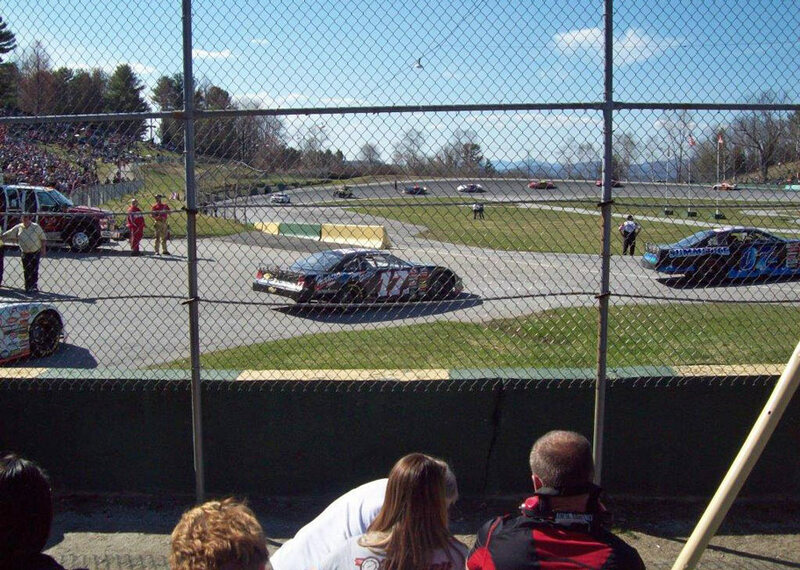 The #17 scored a fourth place finish in the first segment and with the field inverted took the green flag for the second 100 lap segment in 30th place. A huge wreck in turn one started with the two lead cars on the first lap sent ten cars to the pits with substantial damage. 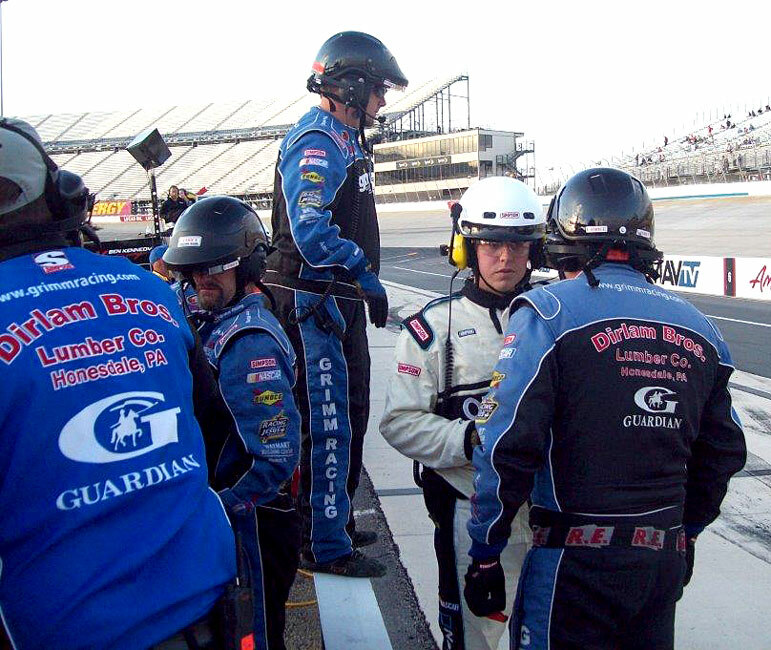 Eddie Mac restarted in the 11th position then quickly moved into fifth on the 22nd circuit. The Rowley, Mass. driver was content to ride in the top five for the remainder of the race to save the car for the third and final 100 lap segment. With the fifth place finish, Eddie Mac was third in the points with a total of nine. 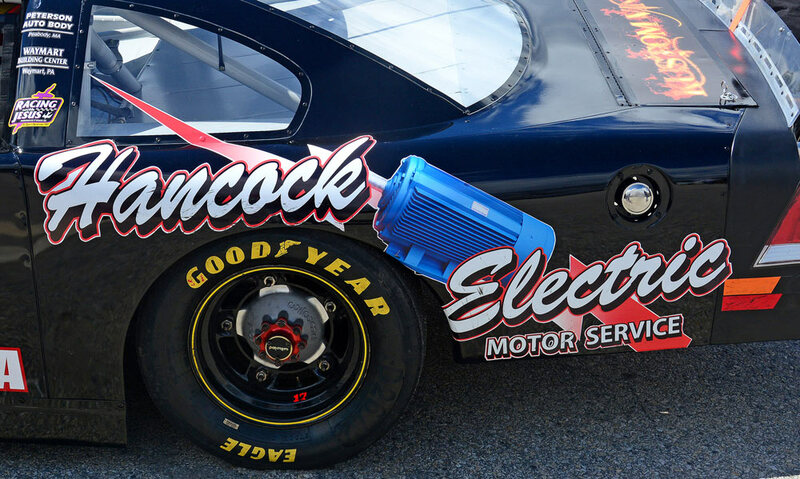 With the field inverted again for the final 100 laps, the Hancock Electric Chevy started 29th in the scheduled field of 36 cars. Attrition took its toll in the first two segments with only 20 cars left standing to take the green flag for the conclusion of the highly successful Airborne 500. 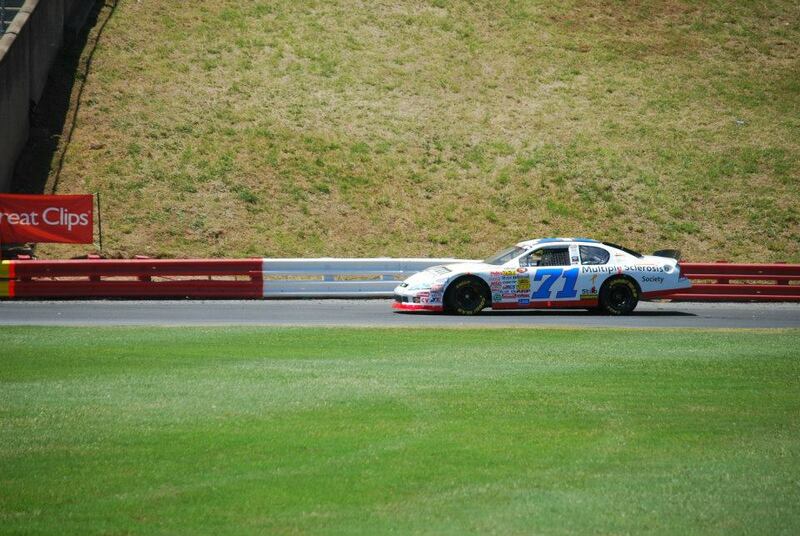 By lap 22, the #17 rode comfortably in the sixth spot and into fifth with only 17 laps remaining. Eddie Mac had to get by Bobby Therrien for fourth place to win the tiebreaker with Scott Payea for the coveted third place podium finish. On the final lap, MacDonald ran on the outside and drove it in hard in turns three and four to pull ahead by a bumper at the checkered flag. 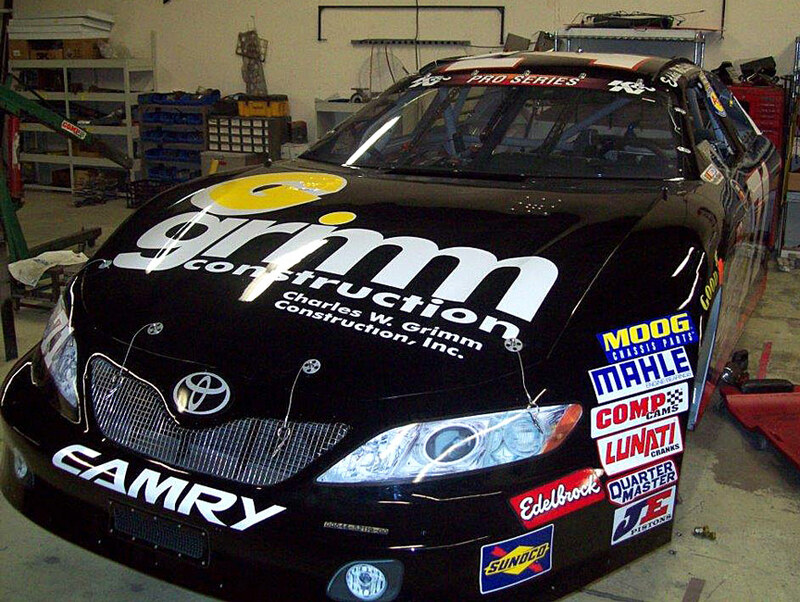 Eddie Mac will drive the Grimm Construction/MS Society Chevy in the NASCAR K&N Pro Series East race at Iowa Speedway on Friday, August 2 in the second combination race against its West Series rivals. 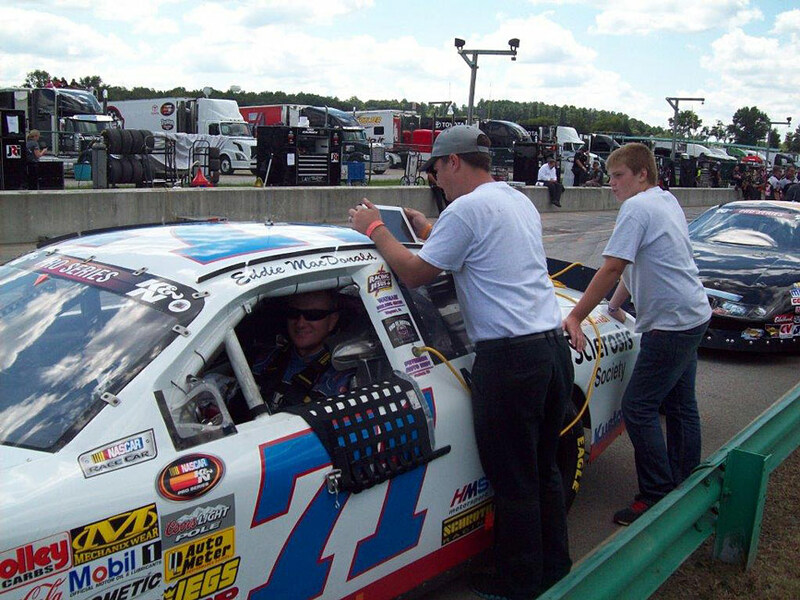 "17ma – Eddie MacDonald – This K&N regular takes time out once in a while to race the American Canadian Tour. Recently, he brought the Petersen Chevrolet to an ‘Eddie Mac’ type top finish at Star Speedway. Steady and super competitive, the “Outlaw” moved quietly through the field and was challenging the leader when the checkers flew. This race is his kind of methodical move ahead; take what you can get race. 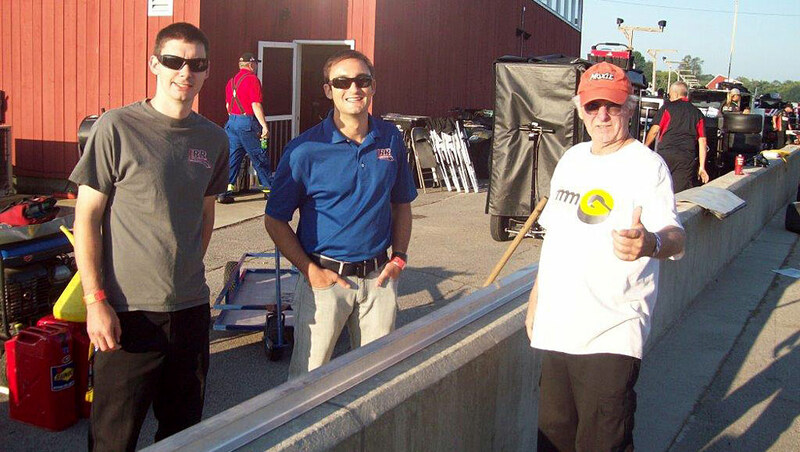 His crew, led by Rollie Lachance, is one of the best in preparation, and that is what wins the ‘Milk Bowl style’ events…give your driver the best car possible each segment…watch out for the 17ma….ODDS 2-1"
Eddie MacDonald posted a sixth place finish in the NASCAR K&N Pro Series East race at Columbus (Ohio) Motor Speedway Saturday night in the NAPA 150. It was the sixth top ten run in the eight scheduled events for the Grimm Racing Team driver this season, tying him for the lead. 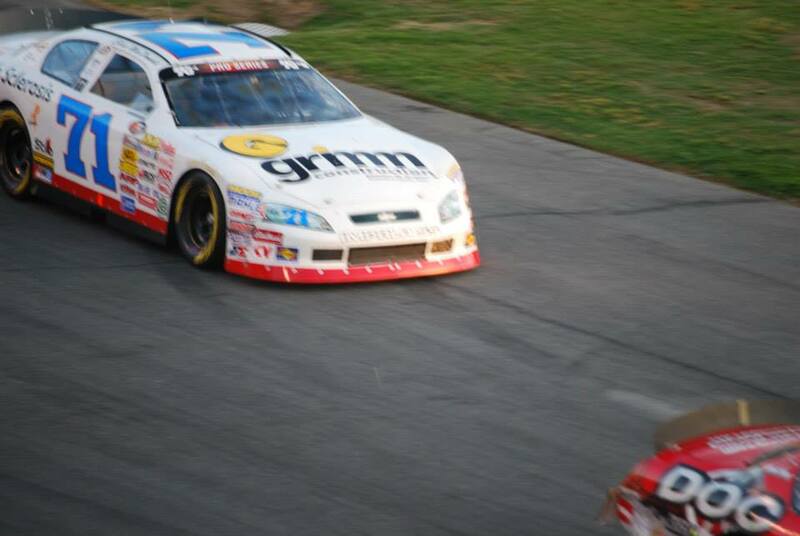 Both driver and team owner, Rob Grimm, are currently sixth in the point’s race. By lap 40, the #71 ran comfortably in ninth, then into seventh by lap 112 with the rest of the field jockeying for position. Eddie Mac raced the #46 (Gdovic) hard over much of the final 40 laps for the fifth position before losing the spot with 13 laps to go. 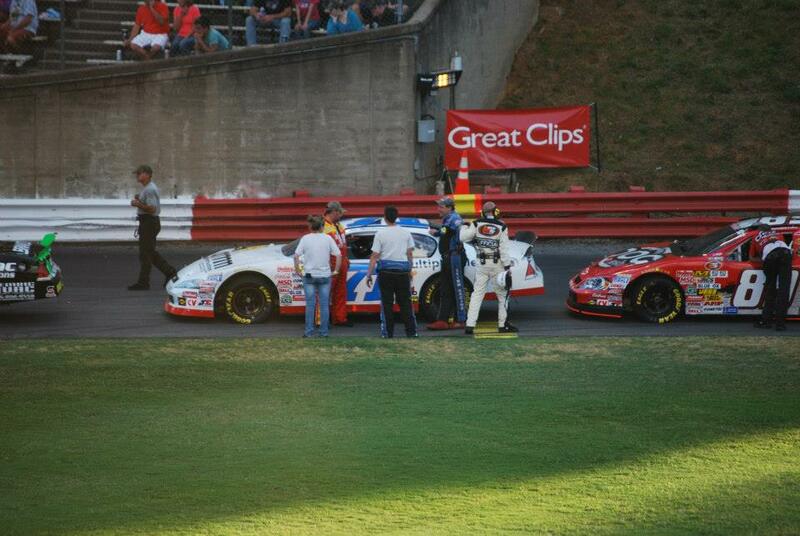 The third and final caution was thrown on lap 143 for a three car wreck leading to a green/white/checker finish. 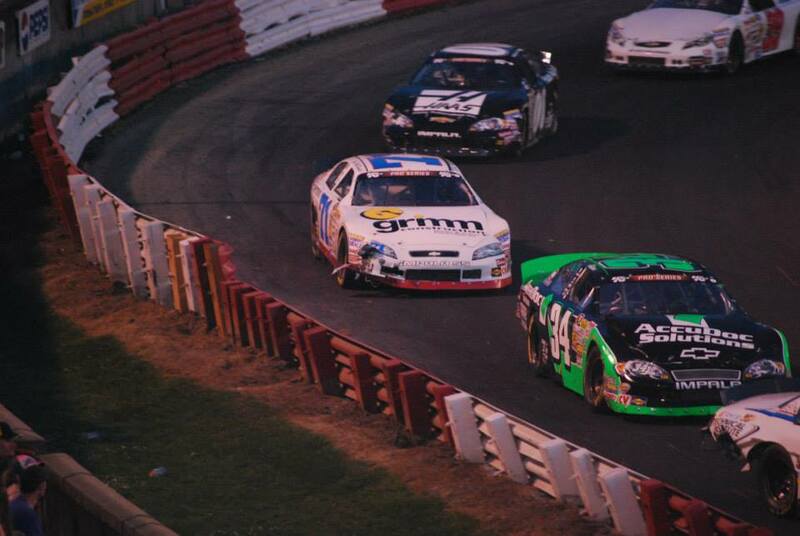 MacDonald restarted sixth on the outside for the G/W/C finish holding on to the spot for the checkered flag on lap 152. The NASCAR K&N Pro Series East will return for the second combination race with its West counterparts at Iowa Speedway on Friday, August 2. 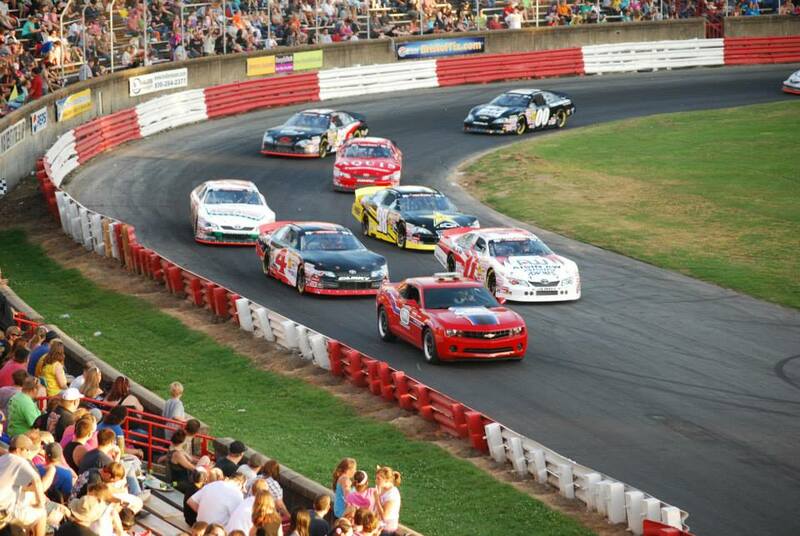 Speed will televise the NAPA 150 on Thursday, July 25, at 3 PM. 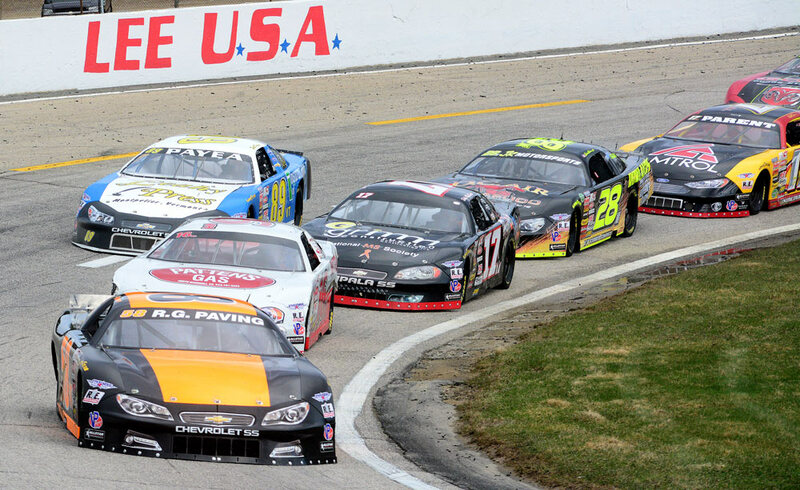 The Race: The NAPA 150 will be the eighth of 15 races on the 2013 NASCAR K&N Pro Series East schedule. It will mark the third year in a row the series has visited Columbus Motor Speedway and the lone trip to the state of Ohio. The Procedure: The starting field is 28 cars, including provisionals. The first 24 cars will qualify through two-lap time trials. The remaining four spots will be awarded through the provisional process. The race will be 150 laps (50 miles). 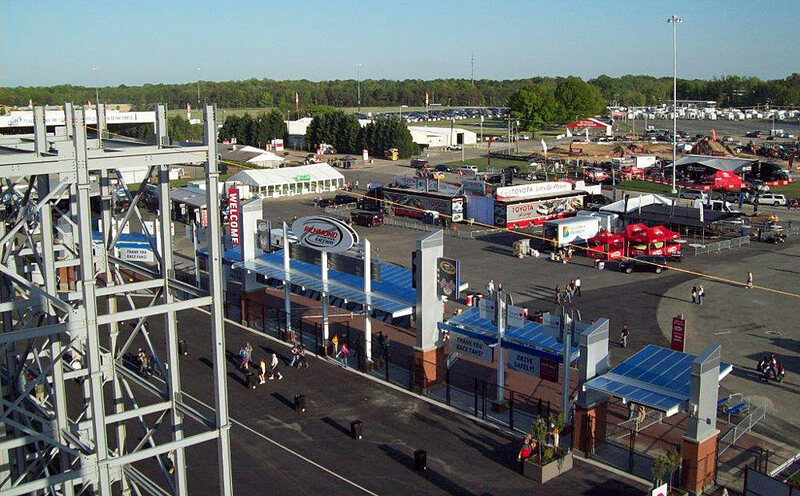 The Track: A charter member of the NASCAR Whelen All-American Series, Columbus is a .333-mile asphalt oval that began as a motorcycle racing track in 1946 and first played host to stock cars in 1950. 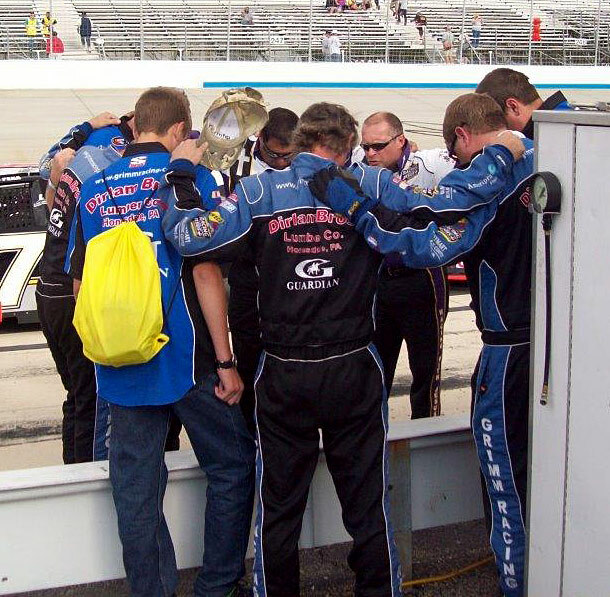 Race Winners: Darrell Wallace Jr. was victorious in the K&N Pro Series East’s first trip to Columbus in 2011 and Cale Conley found Victory Lane there a year ago. Pole Winners: Max Gresham was the inaugural pole winner at Columbus and established the qualifying record at 14.176 seconds (84.565 mph). 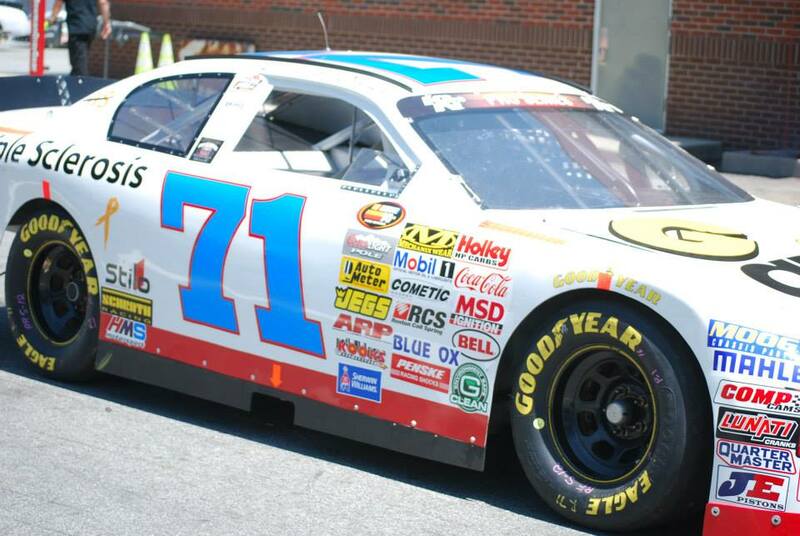 Ben Kennedy captured his first career pole last year at Columbus. • Has six wins, two poles and 79 top 10s in 165 career starts. • Ranks sixth in points entering Columbus on the strength of four top 10s in seven races. • Has finished in the top 10 in 21 of his last 26 starts dating back to the 2011 season. • Has finished 10th in both of the previous series races at Columbus. • Dylan Kwasniewski brings the NASCAR K&N Pro Series East season points lead to Columbus Motor Speedway following wins in his last two series outings. • Brett Moffitt has finished third and second in the two previous races at Columbus. He is looking for his first victory of the season, and to end the longest winless drought of his career. • Aside from Moffitt, the driver with the best average finish through the series’ first two events at Columbus is Daniel Suárez, who has crossed the line in fifth place both times. • Began as a motorcycle racing track in 1946 and first played host to stock cars in 1950. 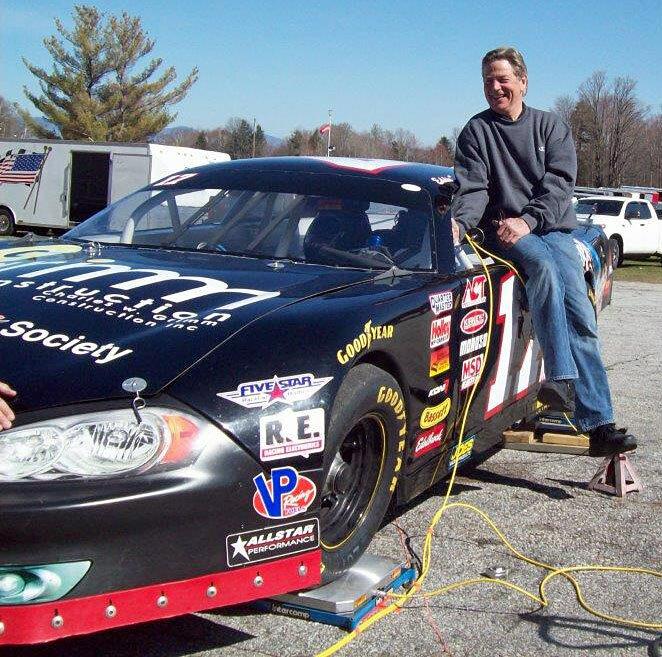 • A charter member of the NASCAR Whelen All-American Series, now in its 32nd season. 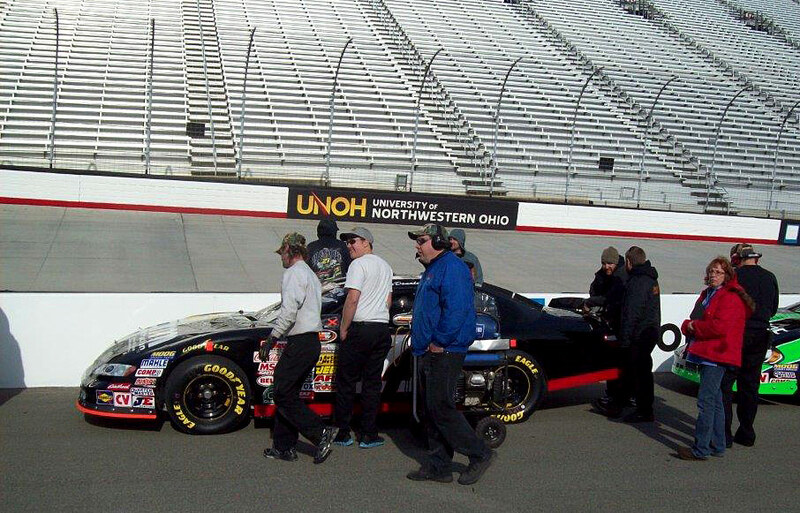 • Is the second track in the state of Ohio in which the NASCAR K&N Pro Series East has competed, along with Mansfield Motorsports Park. 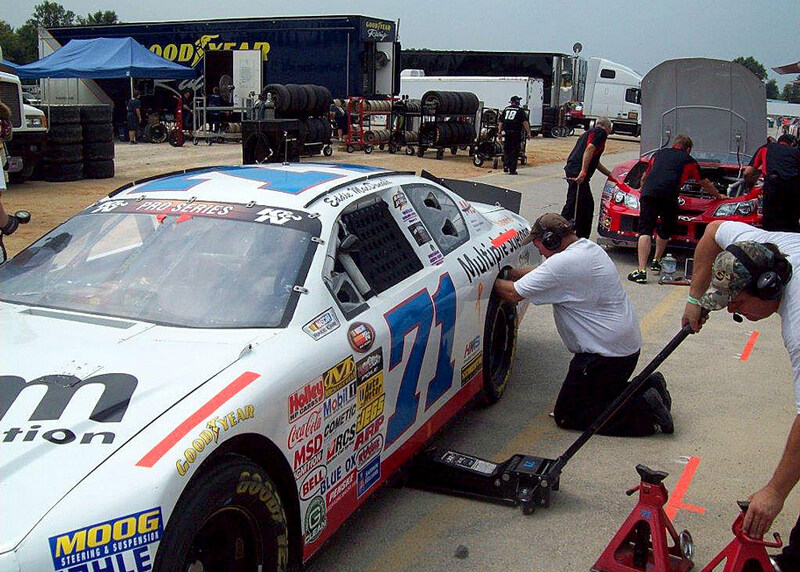 • The NKNPS East is the only NASCAR touring series to have visited Columbus. The inaugural event was July 23, 2011. • Each of the first two events have produced different race winners: Darrell Wallace Jr. in 2011 and Cale Conley in 2012. • As with race wins, each of the first two event have featured different pole winners: Max Gresham in 2011 and Ben Kennedy in 2012. 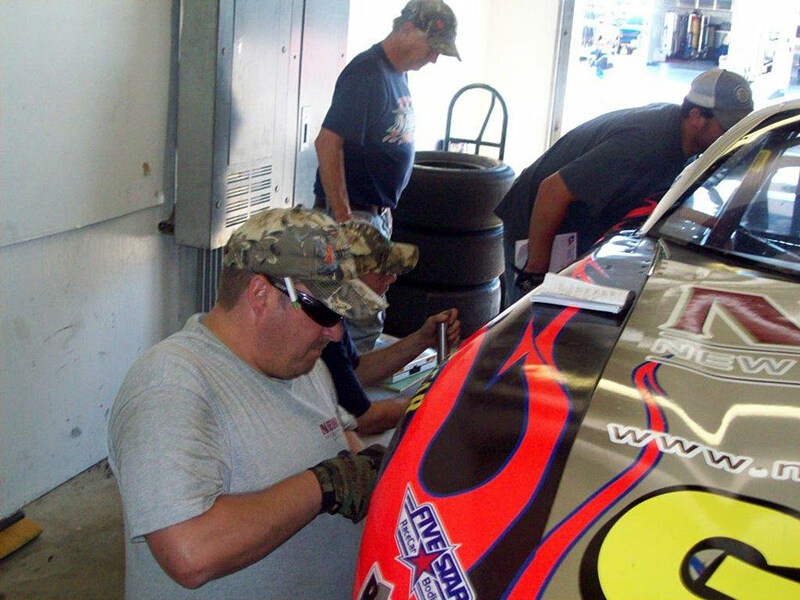 “We were so bad in practice earlier today, I thought about loading up and going home,” laughed Eddie MacDonald in the pits after posting a second place finish in the American Canadian Tour’s Firecracker 150 at Star Speedway Saturday night. The Freddie Peterson owned Hancock Electric Chevy rallied from a 14th starting position in the 19 car field to stage a dramatic run to the front in typical Eddie Mac fashion on the quarter-mile bullring for 150 laps. By the lap 60 caution, Eddie Mac ran in the fifth spot comfortably while saving tires for the end of the race. MacDonald moved into the fourth position on lap 81 and was closing on the #34’s bumper driven by Todd Davis as the top four cars pulled away from the field. While leader Wayne Helliwell fought off the hard challenge of eventual winner Joey Polewarczyk, Eddie Mac and Davis staged and epic duel with the Hancock Electric sponsored ride eventually taking the third spot on lap 101. But Davis was not done and continued to race hard to regain the position. 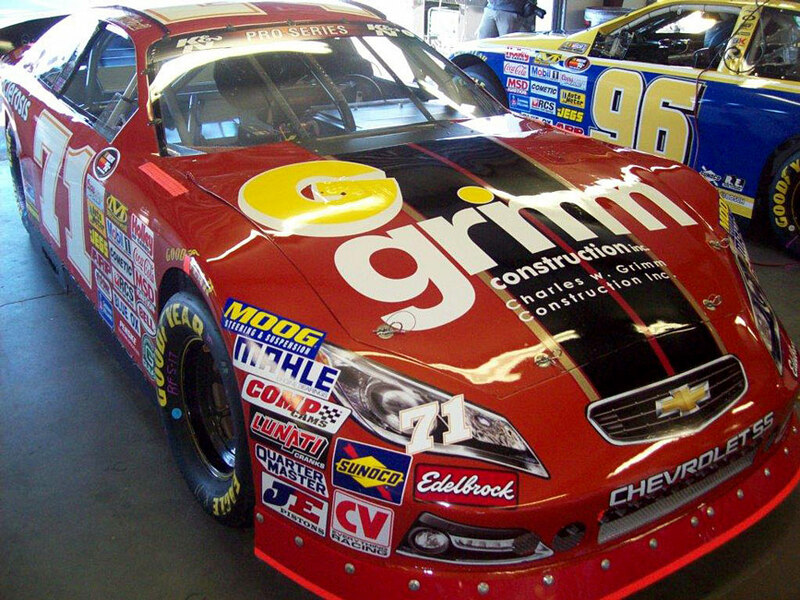 The Grimm Racing Team will take the green flag in the NASCAR K&N Pro Series East race at Columbus (Ohio) Motor Speedway this Saturday July 13. 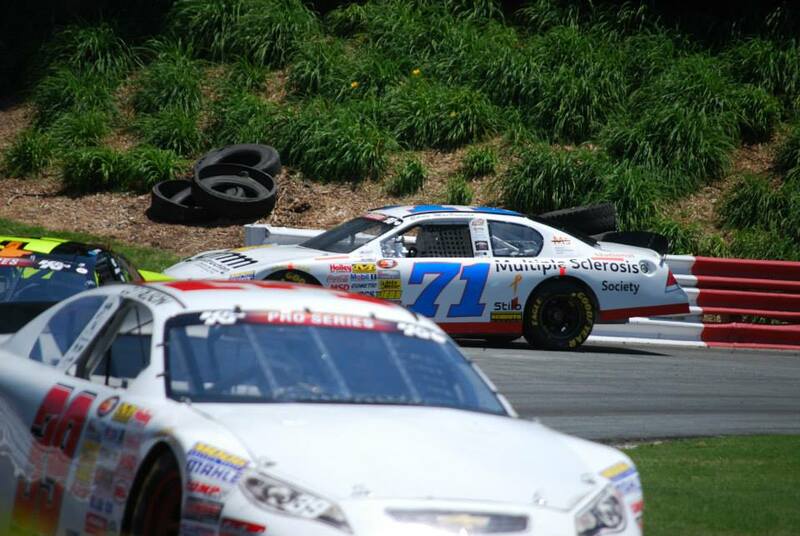 The debut of the new #71 Grimm Racing Chevy in the NASCAR K&N Pro Series East Visit Hampton Va. 175 at Langley Speedway showed great promise until transmission trouble struck on a lap 52 restart. The 23 car field was set by points when rain wiped out qualifying on the .4 of a mile oval with Eddie MacDonald starting seventh then riding comfortably in the fifth position before problems arose. 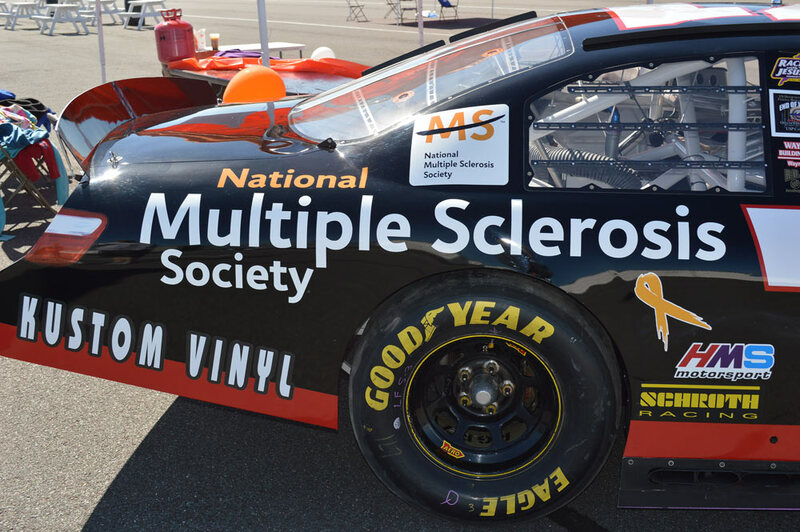 The Grimm Construction/National Multiple Sclerosis Society entry finished in ninth place after a green/white/checker extended the race to 177 laps. Speed will televise the Visit Hampton Va. 175 on Thursday, June 27 at 3pm. 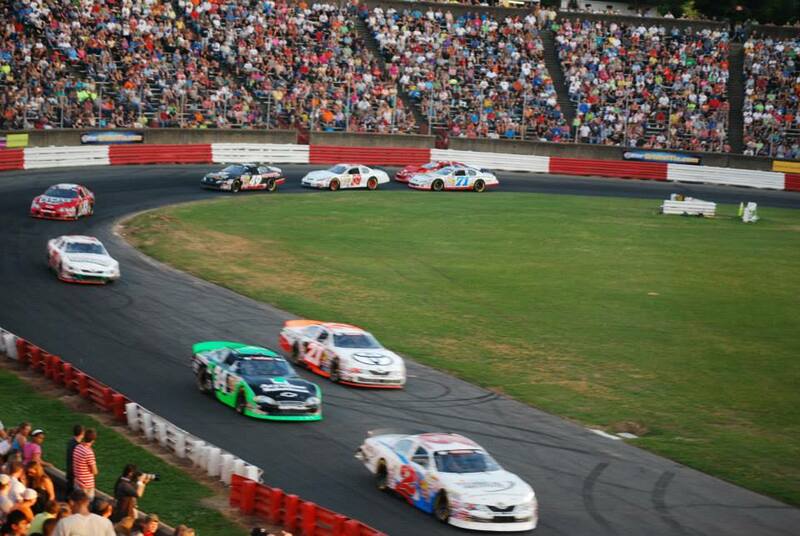 The eighth of the scheduled fifteen races for the NASCAR K&N Pro Series East will take the green flag in the NAPA Auto Parts 150 at Columbus Motor Speedway on Saturday, July 13. 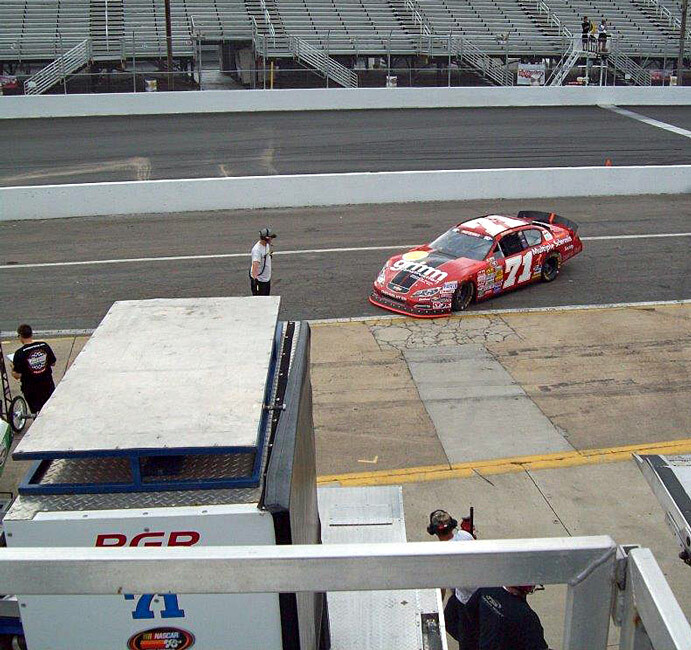 The Race: The seventh of 15 races on the 2013 schedule, the Visit Hampton VA 175 will mark the third year in a row the NASCAR K&N Pro Series East has contested an event at Langley Speedway. It will be the second of three races on the series’ calendar in the state of Virginia. The Procedure: The starting field is 30 cars, including provisionals. The first 26 cars will qualify through two-lap time trials. The remaining four spots will be awarded through the provisional process. 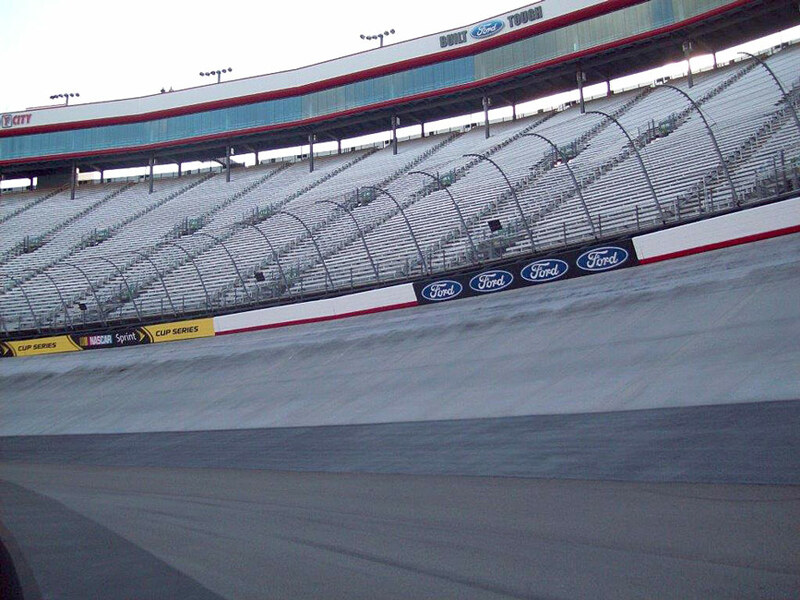 The race will be 175 laps (70 miles). The Track: On property that was originally a .8-mile horse track, the racing distance was cut in half and made exclusively an auto racing facility in 1950. The track, which played host to the NASCAR Sprint Cup Series from 1964-70, was converted to asphalt in 1968 and currently runs as a slightly-banked .396-mile oval. 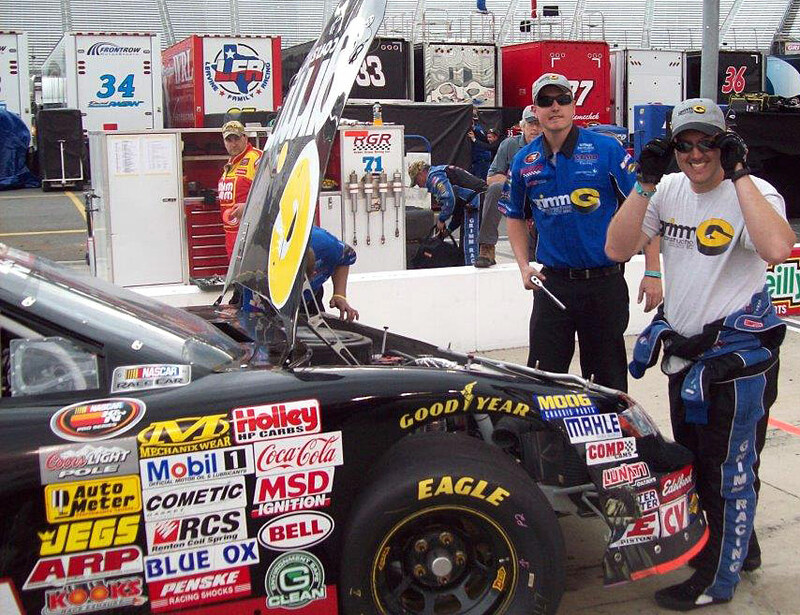 Race Winners: Sergio Peña was the inaugural Visit Hampton VA 175 winner on June 18, 2011 while Corey LaJoie was last year’s victory. Pole Winners: Coleman Pressley turned the fast lap to take the inaugural pole at Langley in 2011 and Chase Elliott became the youngest pole winner in series history – at the time – when he captured last year’s top qualifying honors with a track record lap of 16.400 seconds (86.927 mph). 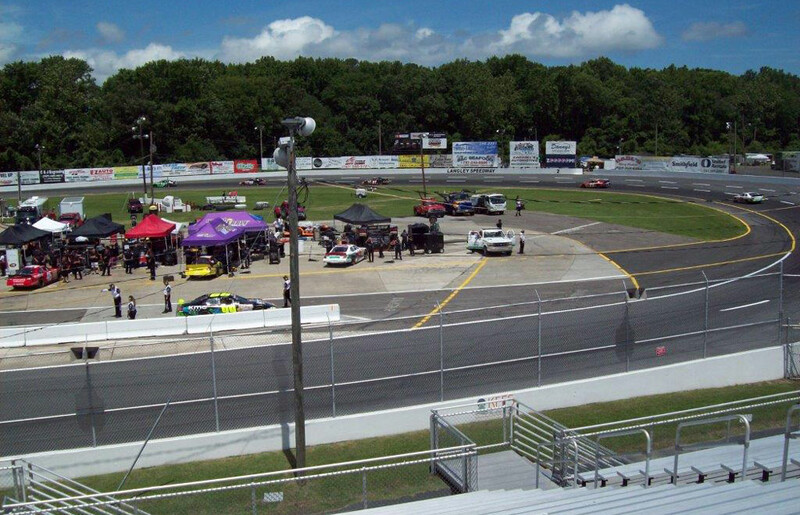 Langley Resurfaced: Prior to the start of the 2013 racing season, Langley Speedway’s .396-mile asphalt oval was resurfaced. 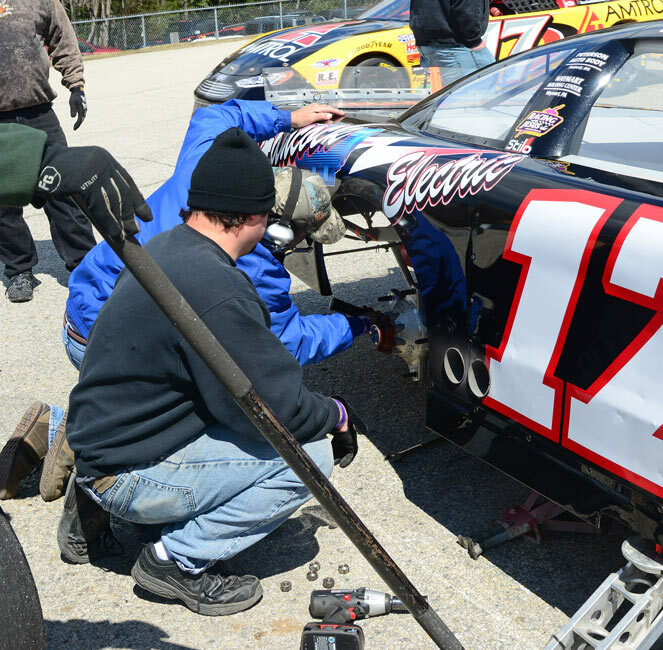 Due to the track’s racing surface update, NASCAR has waived its standard regional touring series testing policy and will allow teams to participate in an open practice at Langley on Friday, June 21, the day before the Visit Hampton VA 175. 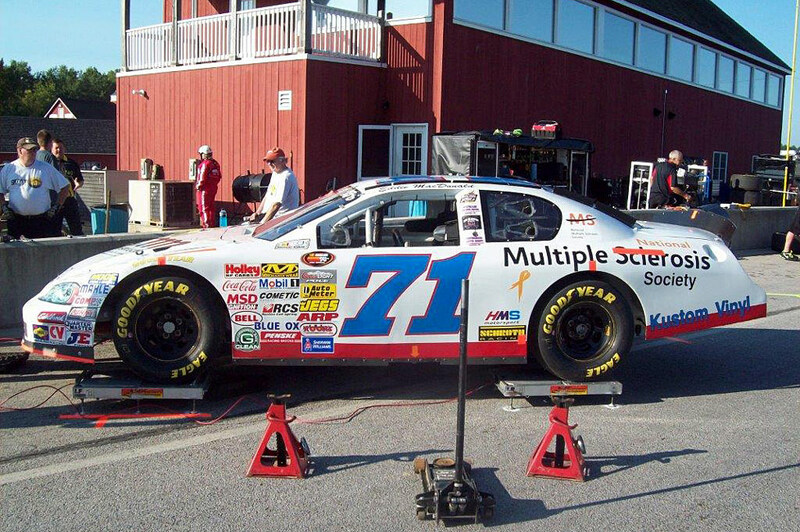 Teams are generally not allowed to test at a track in the seven days preceding a race weekend at that same facility. • Has six wins, two poles and 78 top 10s in 164 career starts. • Ranks seventh in points entering Langley on the strength of three top 10s in six races. • Has finished in the top 10 in 20 of his last 25 starts dating back to the 2011 season. 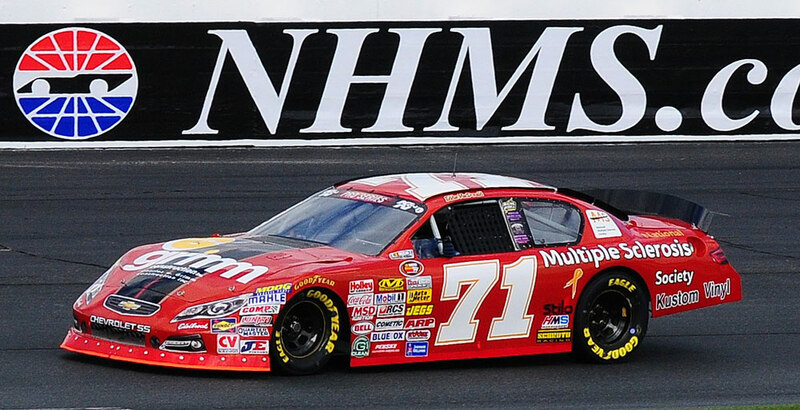 • Has an average finish of 11th with a best result of ninth (2012) in the two previous NKNPS East races at Langley. • Brett Moffitt brings the NASCAR K&N Pro Series East season points lead to Langley Speedway looking for his first victory of the season, and to end the longest winless drought of his career. He has finished second in both of his previous Langley starts. • There are three Virginia natives on the entry list, all looking for their first home state win. Gray Gaulding hails from Colonial Heights, Brandon Gdovic from Yorktown and Sam Hunt from Midlothian. • Neither of the previous NKNPS East winners at Langley are entered this year, opening it up for three-different winners in three all-time series visits. 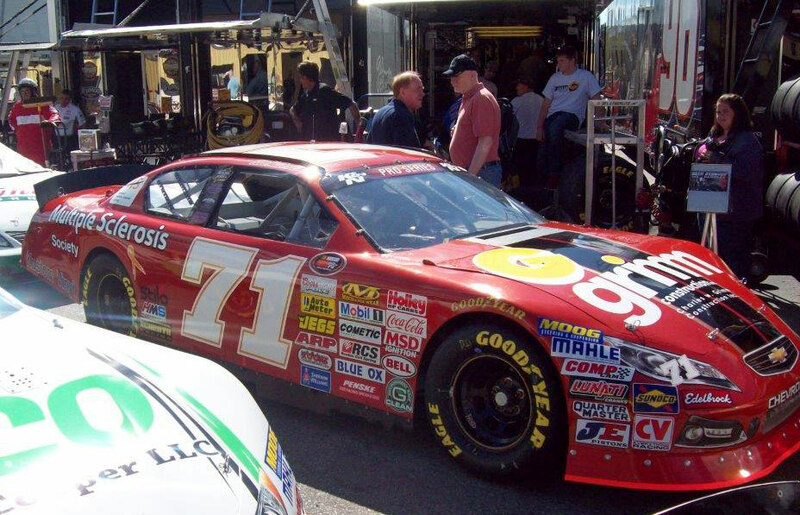 Eddie MacDonald and the Grimm Racing Team posted three consecutive top ten finishes at Iowa Speedway but this time the #71 struggled to 15th place in the Casey’s General Store 150. 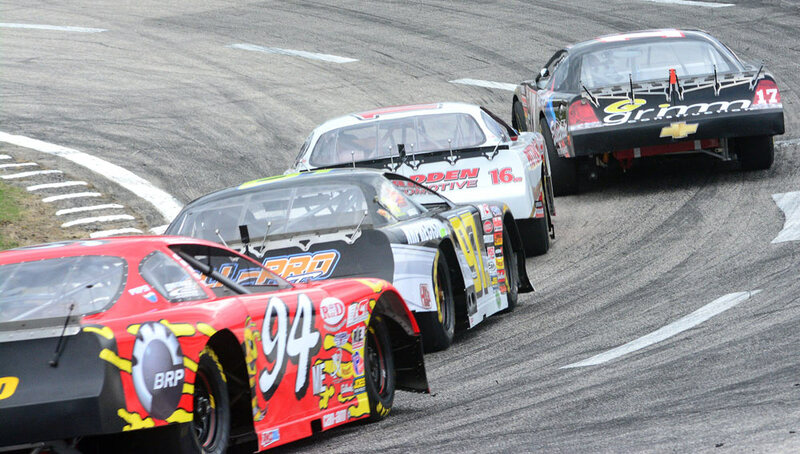 The combination race was the first of two this season on the 7/8 mile oval pitting the NASCAR K&N Pro Series East and West teams for series bragging rights. 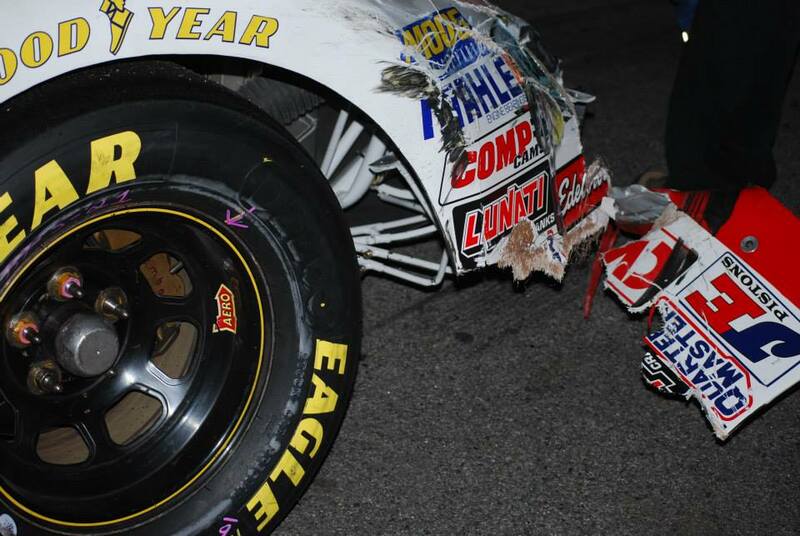 The first seven combo races were won by the East until Michael self finally scored a win for the West on Friday night. MacDonald’s best finish in the previous events was a third in 2011. Both driver and team owner remained in seventh place in the points race with Eddie Mac only four points out of fourth place. 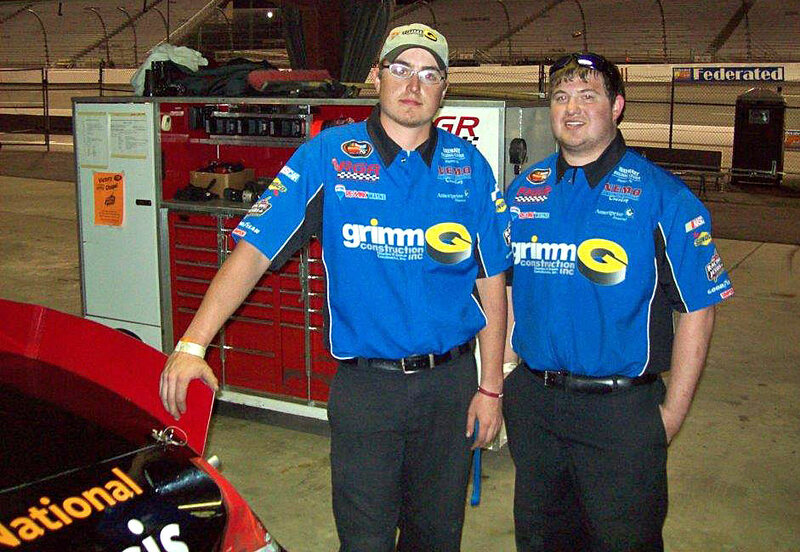 The Grimm Racing Team will have the opportunity to improve their position on Saturday, June 22 when the K&N Series returns to Langley Speedway in Hampton, VA. 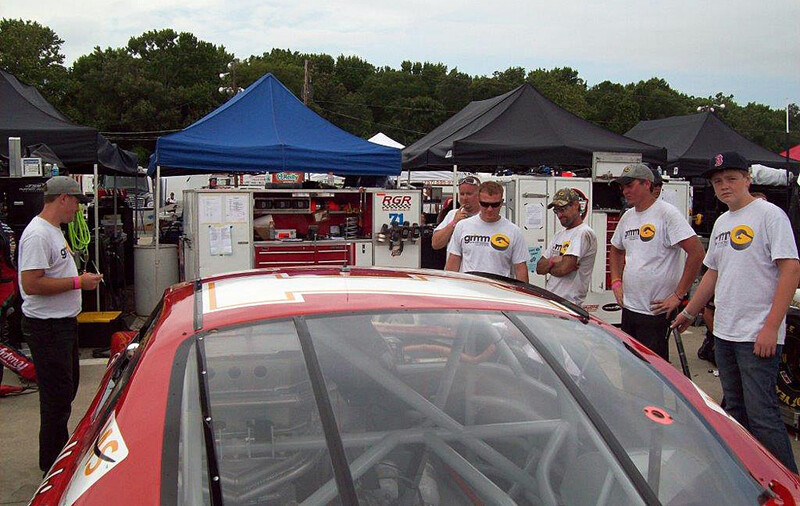 Speed will televise the Casey’s General Store 150 from Iowa on Thursday, June 13 @ 3 PM. 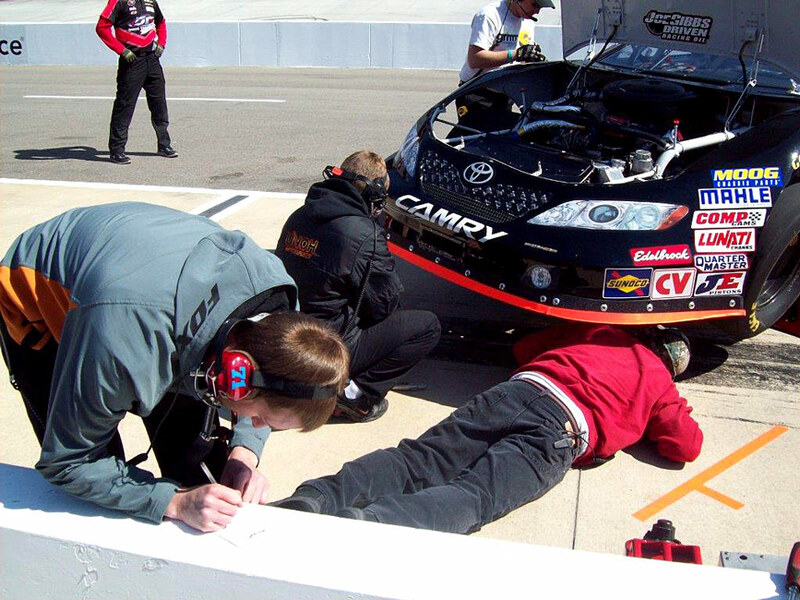 The Race: The Casey’s General Stores 150 will be the eighth all-time NASCAR K&N Pro Series East-West combination race at Iowa Speedway, and the first of two at the track in 2013. 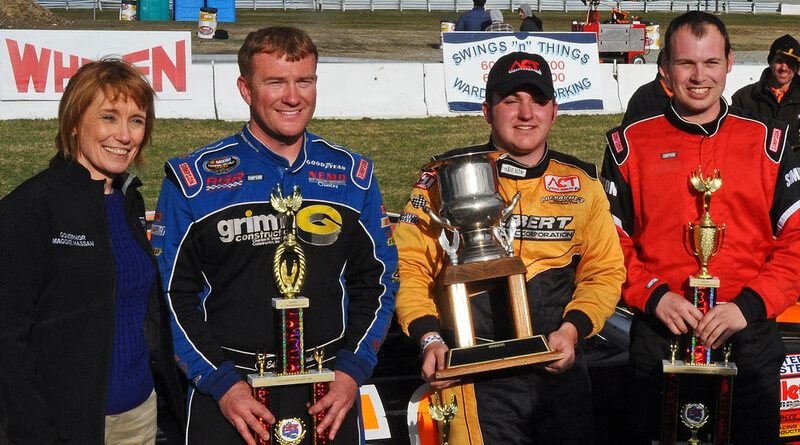 Race Winners: The seven previous editions of the NASCAR K&N Pro Series East-West combination race have each produced a different overall winner. Chase Elliott won this event last year as a representative of the East while the highest finisher from the West was Dylan Kwasniewski, eighth overall. Pole Winners: As with race winners, each of the first seven Iowa combo races has also produced different overall pole winners. Iowa native Brett Moffitt earned the pole for this race last year as an East representative while the best qualifier from the West was David Mayhew, ninth overall. • Brett Moffitt of Grimes, Iowa, has a four-point lead in the championship standings of the NASCAR K&N Pro Series East after five races. 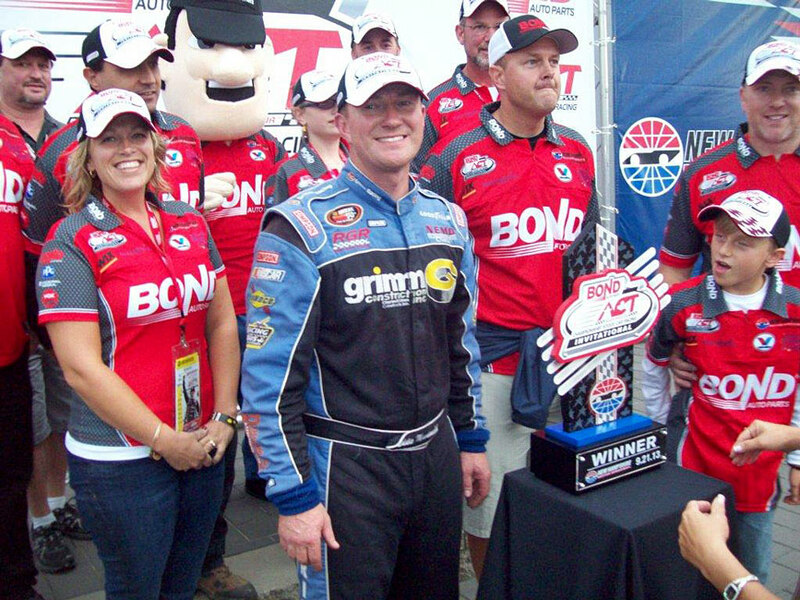 Moffitt, who won the East-West combination race at Iowa in 2011, is the only driver in the top five in series points without a win so far this year. 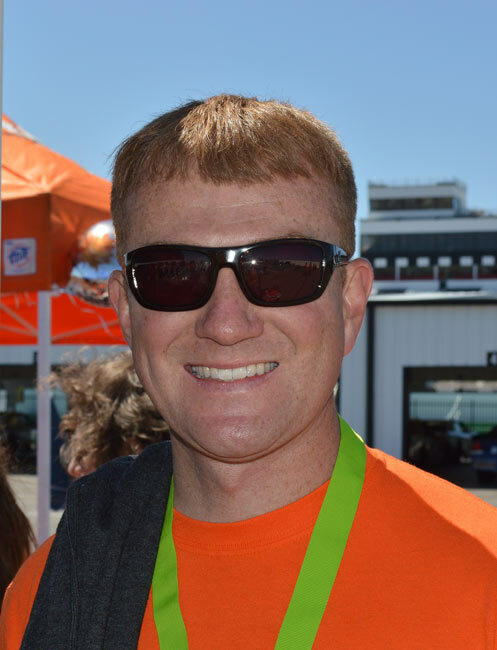 • Derek Thorn has an eight-point lead in the championship standings of the NASCAR K&N Pro Series West, with three races complete in that division. Thorn of Lakeport, Calif., is one of three different series winners this year. 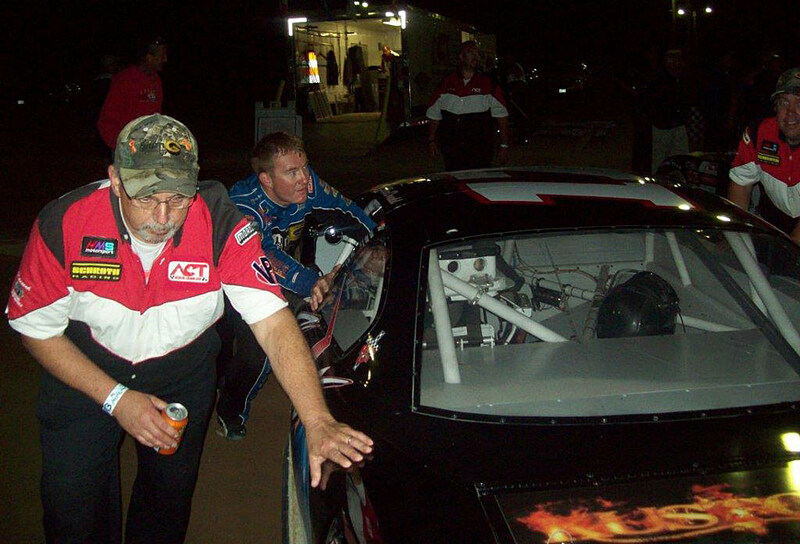 With only ten laps to go in the K&N Pro Series East race at historic Bowman Gray Stadium in Winston- Salem, N.C., Eddie MacDonald appeared headed for another top ten finish. 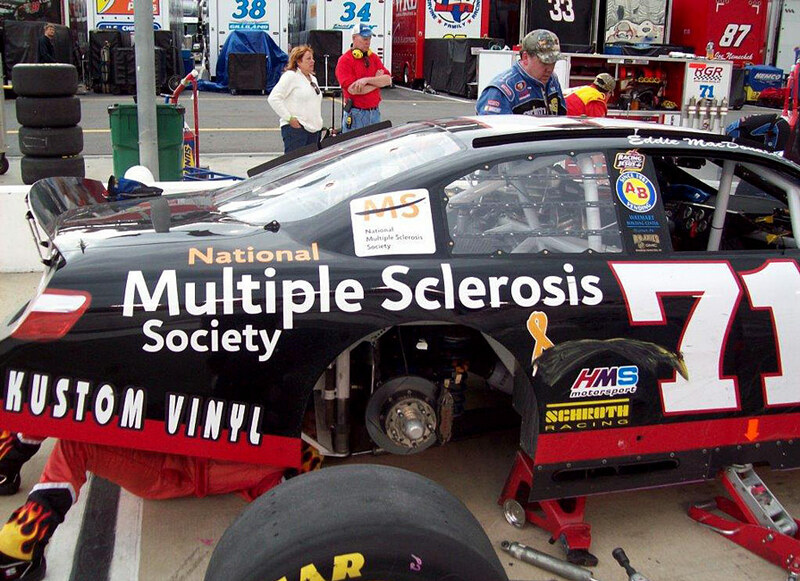 Instead, the Grimm Construction/Multiple Sclerosis Society Chevy suffered a flat tire forcing the Rowley Mass. 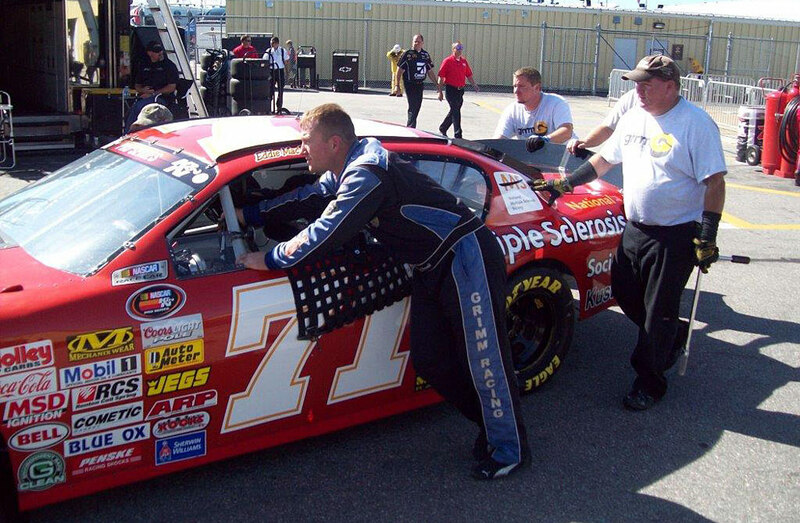 veteran to the pits to go a lap down to finish twelfth in the NASCAR Hall of Fame 150. The sixth race of the season will be the first of two combination races with the K&N Pro Series East/West teams at Iowa Speedway. The Casey’s General Store 150 will get the green flag on Friday, June 7 on the 7/8 of a mile oval designed by Rusty Wallace. It will be the eighth combo race at the Newton, Iowa facility. 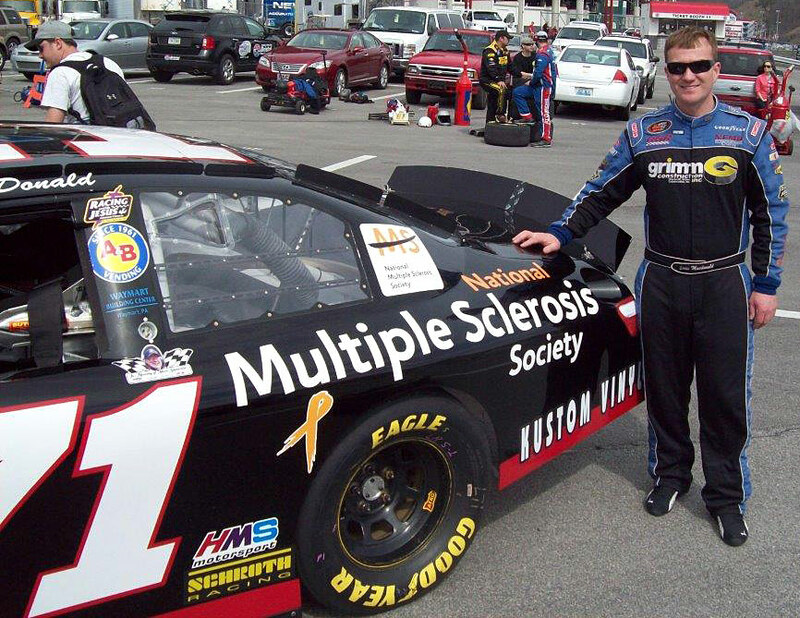 Eddie Mac is tied with Brett Moffitt for the most top ten finishes in the previous seven races with four each. NASCAR Home Tracks will cover the practice, qualifying, and the 150 lap event on its website. Speed will televise the Hall of Fame 150 on Thursday, June 6 at 3pm. 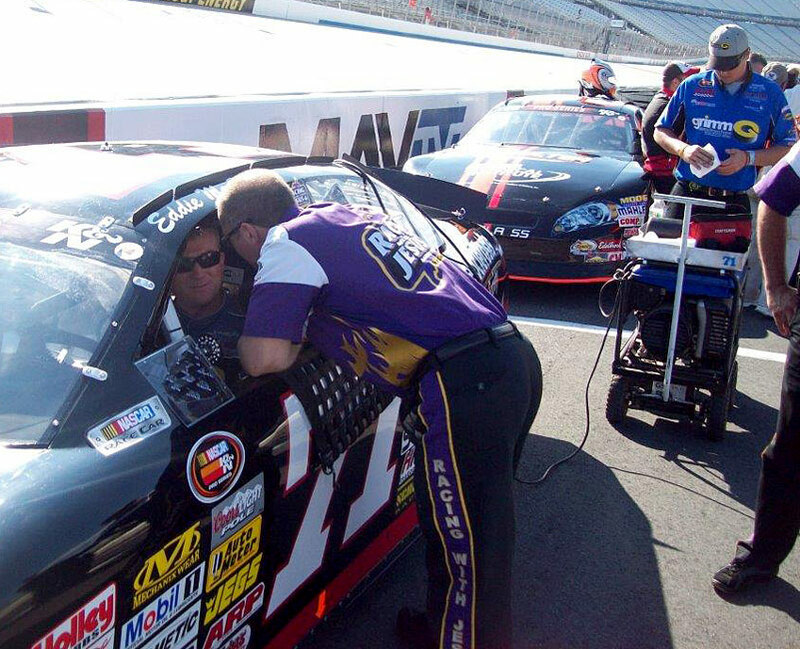 The Race: The fifth of 15 races on the 2013 schedule, the NASCAR Hall of Fame 150 will mark the third year in a row the NASCAR K&N Pro Series East has contested an event historic Bowman Gray Stadium. 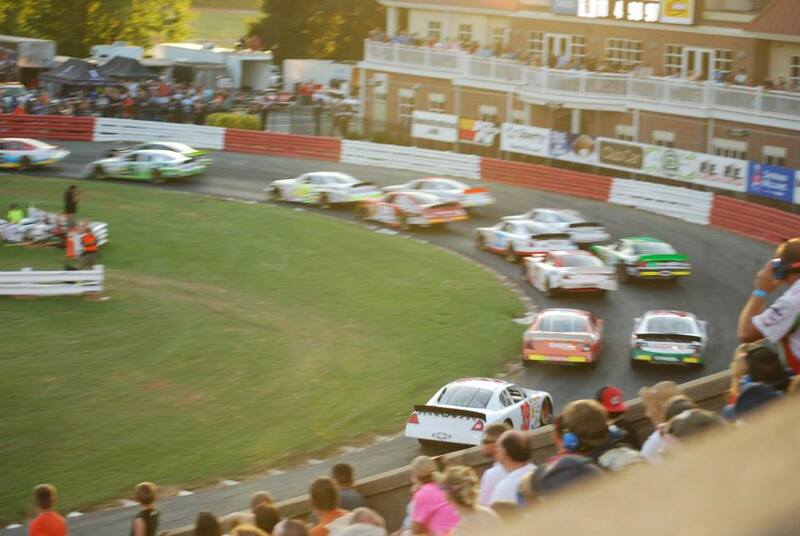 The Track: Nicknamed “The Stadium” and “The Madhouse,” Bowman Gray is a flat quarter-mile asphalt oval. 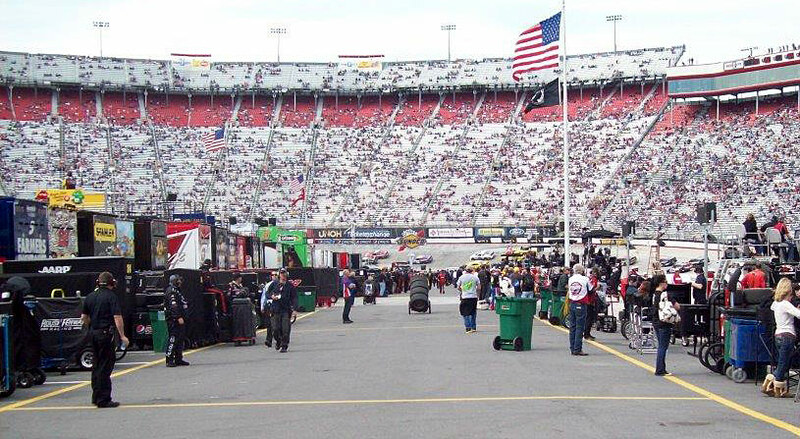 The track opened in 1946 and held 29 races from 1958-71 for what is now known as the NASCAR Sprint Cup Series. 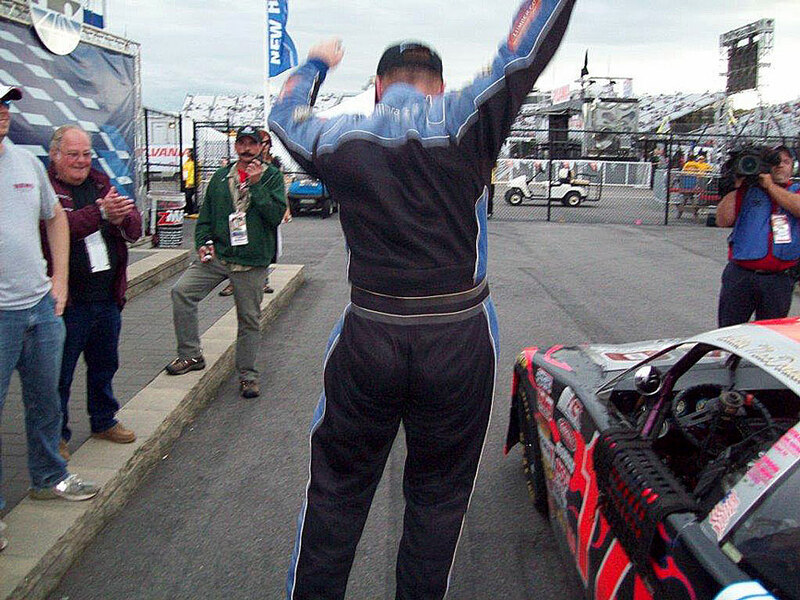 Race Winners: Matt DiBenedetto won the inaugural NASCAR Hall of Fame 150 on June 4, 2011 while Corey LaJoie earned his first career victory in the event a year ago. Pole Winners: Coleman Pressley took the first series pole at Bowman Gray in 2011 while Kyle Larson established the track record last year with a fast lap of 14.696 seconds (61.241 mph). 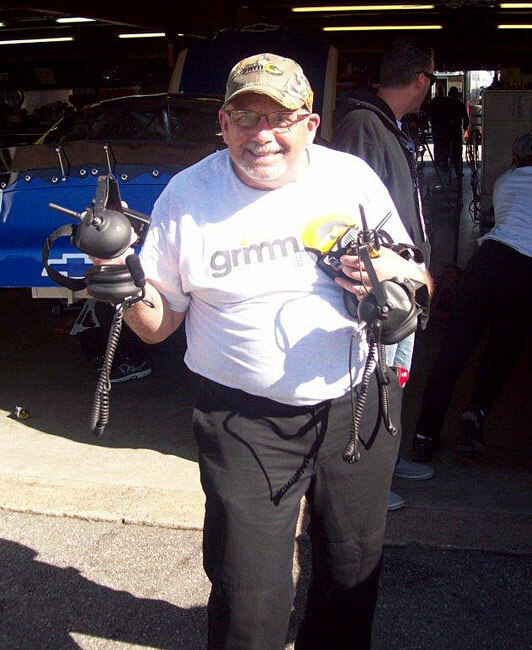 Ingram to Serve as Grand Marshal: For the second year in a row the NASCAR Hall of Fame 150 will have a recent selectee serve as grand marshal. 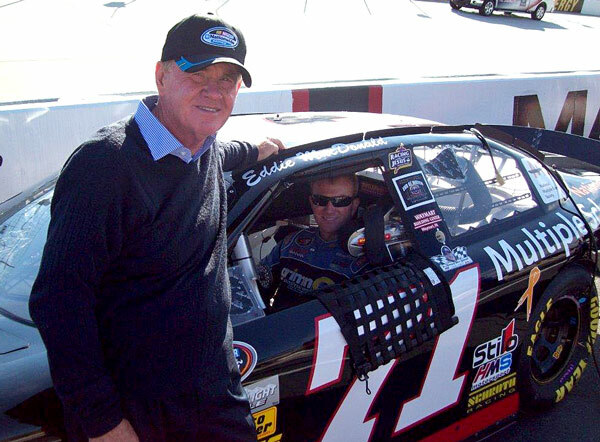 Jack Ingram, one of five selected on May 22 for the NASCAR Hall of Fame’s fifth induction class, will be in attendance Saturday for the festivities at Bowman Gray Stadium. 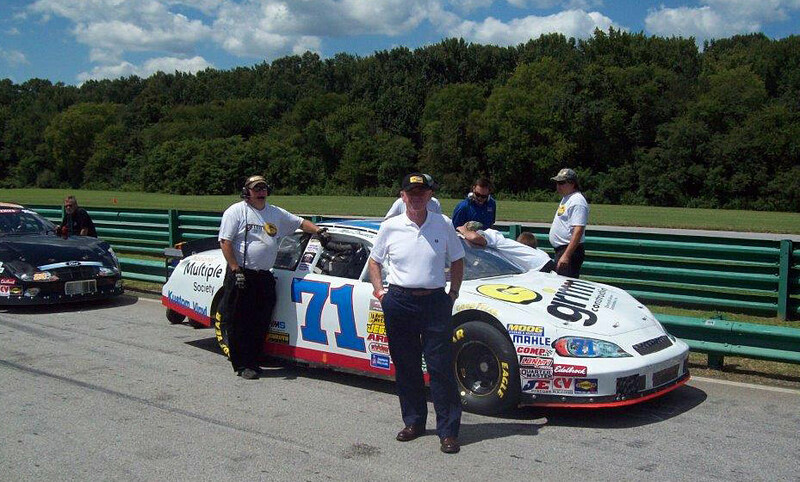 In last year’s event NASCAR Hall of Fame Class of 2012 inductee Glen Wood served as grand marshal. 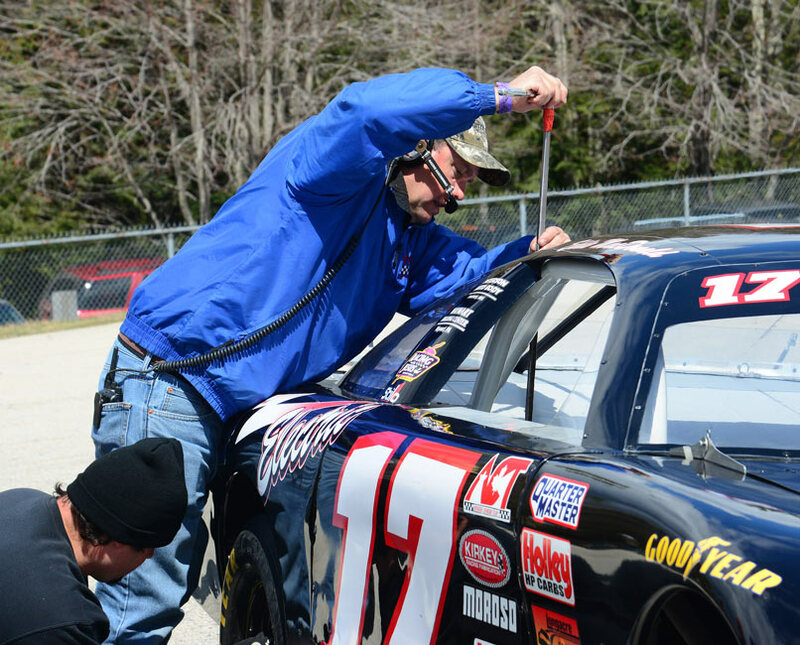 Getting Back in the Groove: The last NASCAR K&N Pro Series East race took place on April 25 at Richmond International Raceway, which will result in a span of 37 days before the return to action on June 1 at Bowman Gray. That will be the longest drought of inactivity for the series during its 15-race 2013 schedule. • Has six wins, two poles and 78 top 10s in 162 career starts. 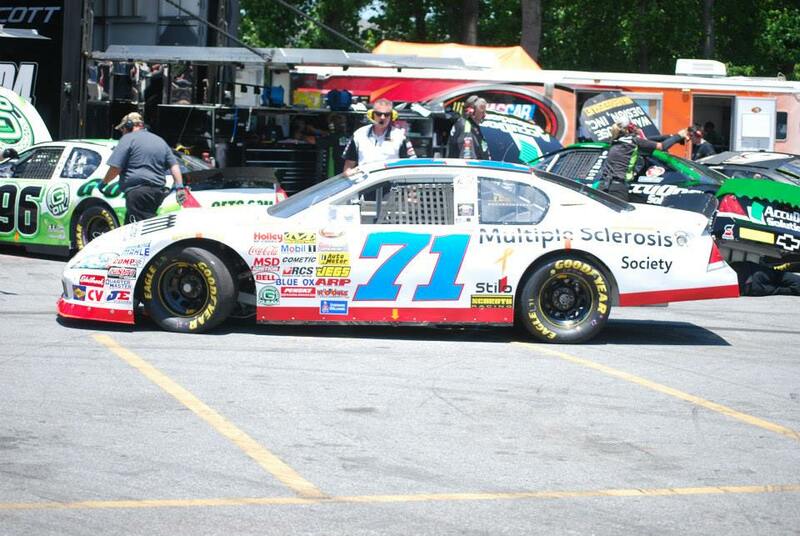 • Ranks fifth in points entering Bowman Gray on the strength of three top 10s in four races. • Has finished in the top 10 in 20 of his last 23 starts dating back to the 2011 season. 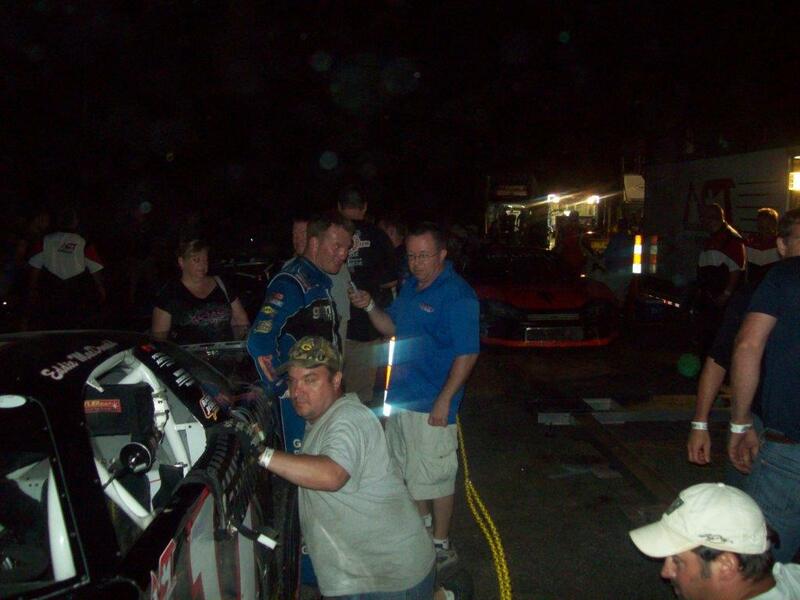 • Has finishes of 13th and 10th in his two career starts at Bowman Gray. • This week will mark his 163rd career start, which will put him in 10th on the series’ all-time list. 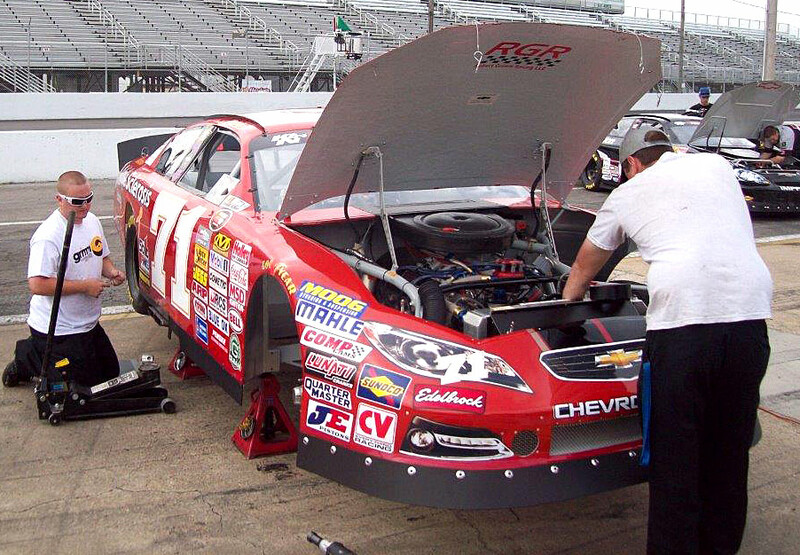 • Each of the first four races of the 2013 NASCAR K&N Pro Series East season have produced different winners, all of which were first-time victors. 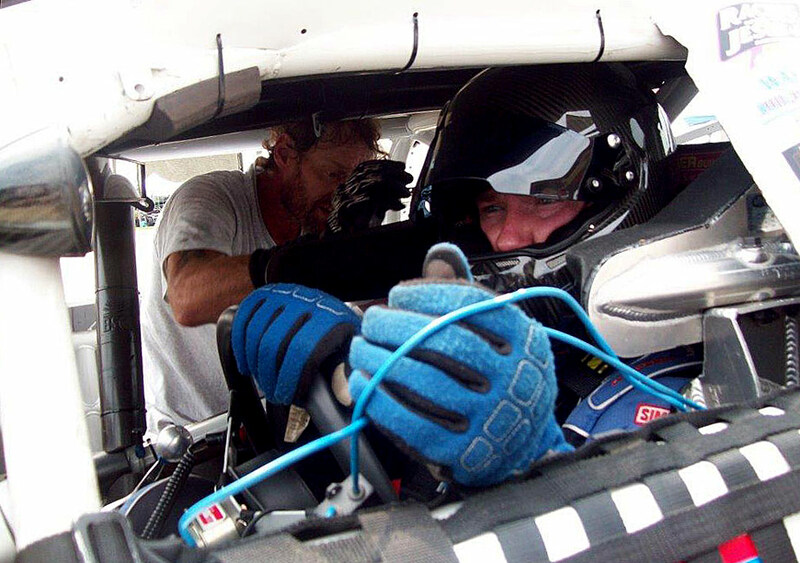 • Just eight drivers on the NASCAR Hall of Fame 150 entry list have previous series experience at Bowman Gray Stadium, including five that have participated in both events. 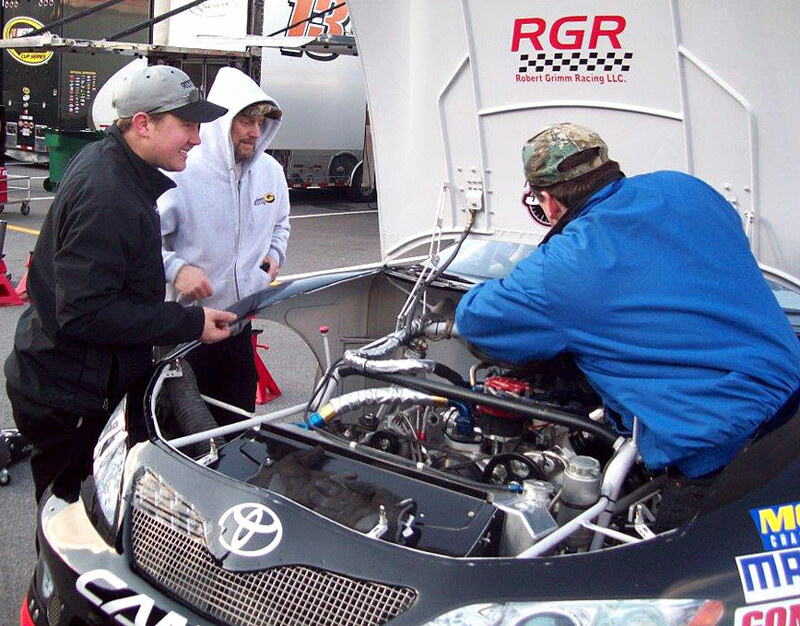 • Points leader Brett Moffitt will look to break a career-long winless streak of 10 races. Should Moffitt end his drought at Bowman Gray, the tight quarter-mile would be the ninth-different track he’s earned a checkered flag at. 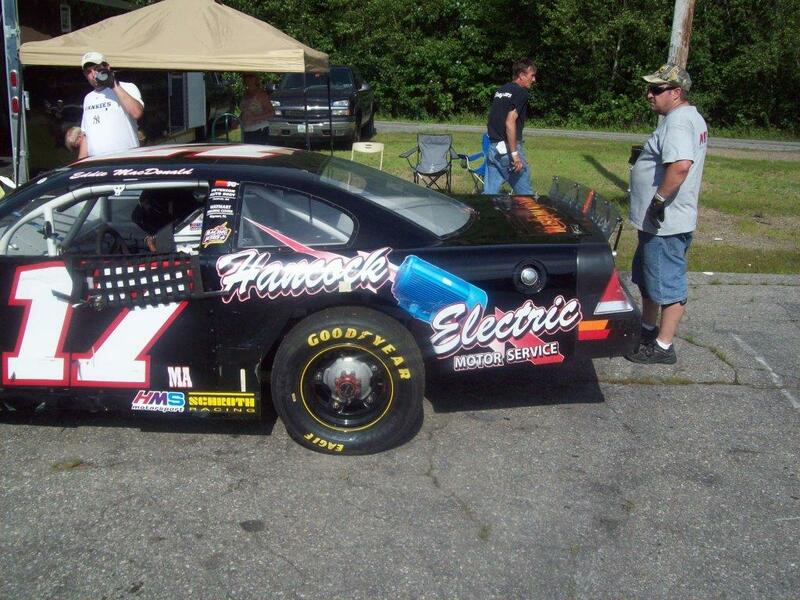 Eddie MacDonald’ Hancock Electric/Grimm Construction Chevy suffered a disappointing 16th place finish in the ACT Late Model Tour’s Airborne 100 in Plattsburgh New York. The Freddie Peterson owned #17 was making a move to the front when the #9 (Chip Grenier) spun the Rowley, Mass. veteran on a lap 55 restart. 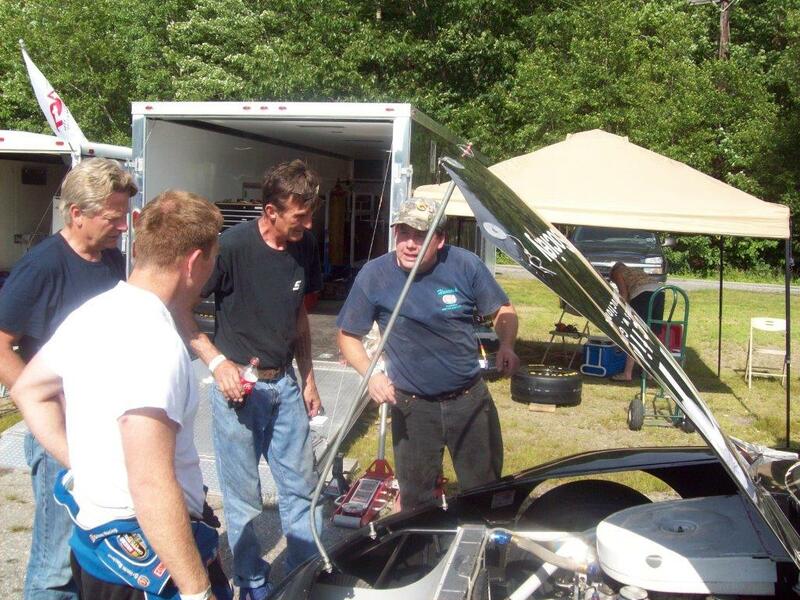 Eddie Mac and crew chief Rollie LaChance are scheduled to race the ACT Tour’s return to Star Speedway in Epping, N.H. on July 6. 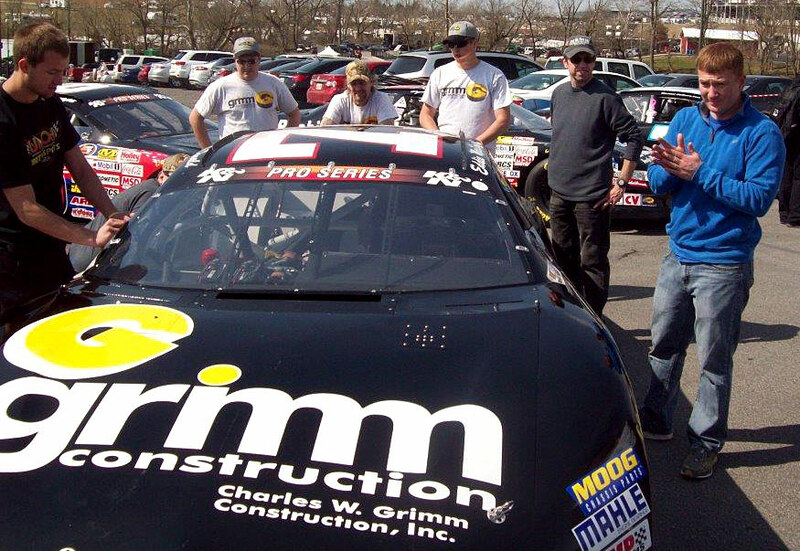 The Grimm Racing team will compete in the K&N Pro Series East Series on the “bullring” known as Bowman Gray Stadium on June 1.
the “MS Warriors” in the May 5th MS Walk at Pocono Speedway. 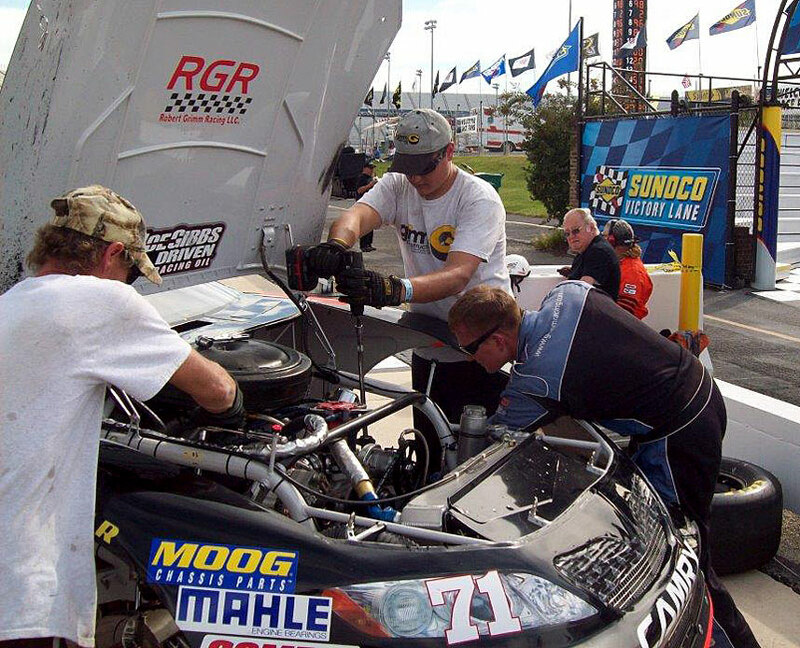 There are usually one or two things that define a race team whether it is a huge win or a race changing pit stop but for Grimm Racing its defining event occurred on a race track yet had nothing to do with racecars flying around an oval at incredible speed. 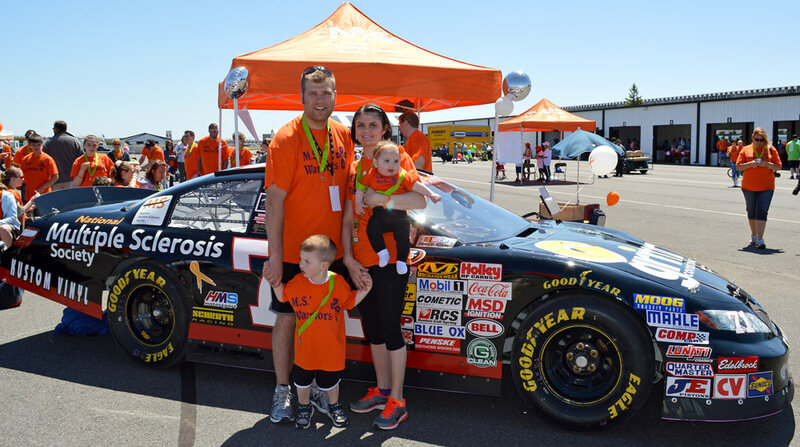 The Grimm Racing Team was at Pocono Raceway on Sunday, May 5 for the third annual National Multiple Sclerosis Society Walk as part of Grimm Nation’s “MS Warriors” team in support of Megan Spaulding, the daughter of team owners Karla and Rob Grimm. 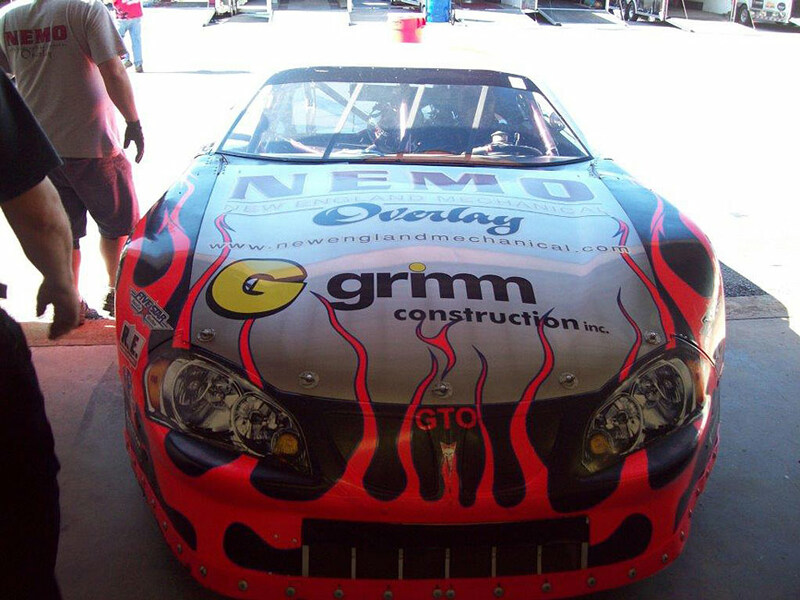 Photos of the day’s events are displayed on Grimmracing.com as well as the Grimm Racing Facebook page. Ralph Smith took many beautiful pictures that are posted and can be seen on his Facebook page as well. So many people were responsible for making this a life-changing day. 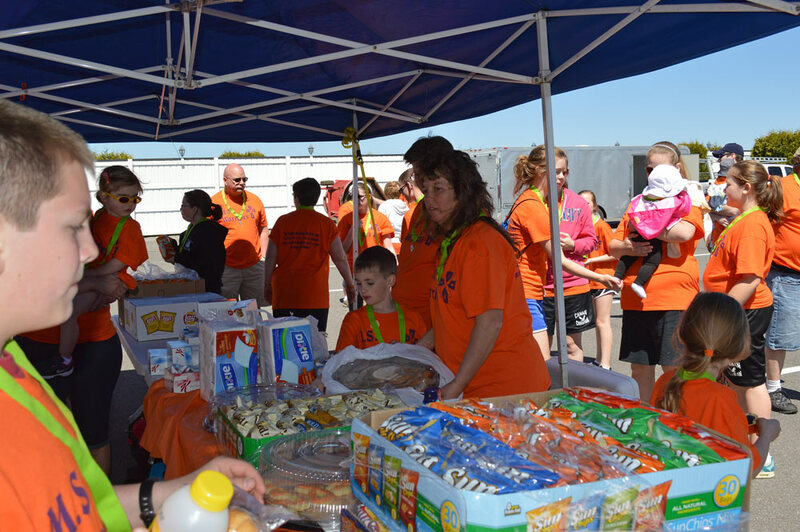 Jolene Drandson was actively involved with all of the preparation from the beginning to help make this MS Walk a huge success. 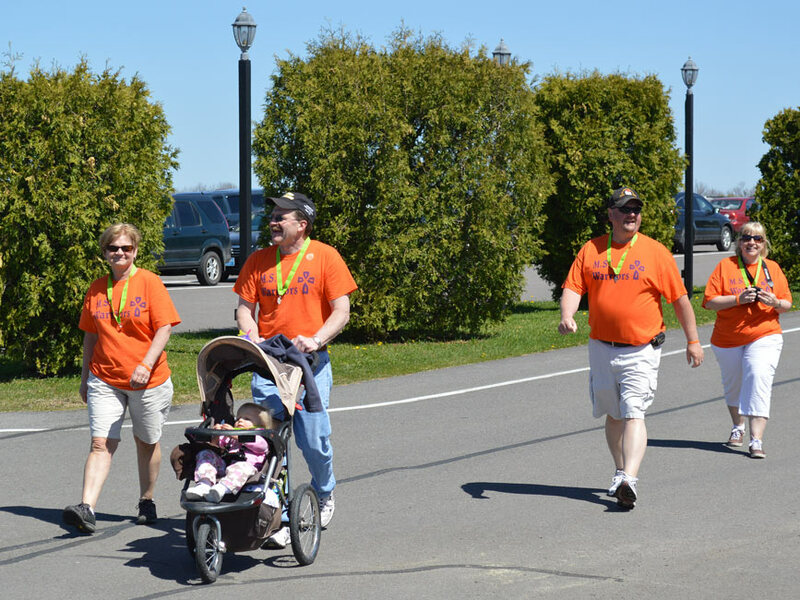 Since 1988 the MS walk has raised over $10,000,000 dollars to support research to find a cure and donations are always welcome. 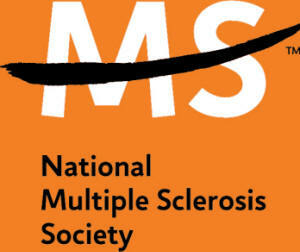 Simply contact the Nationalmssociey.org for more information. 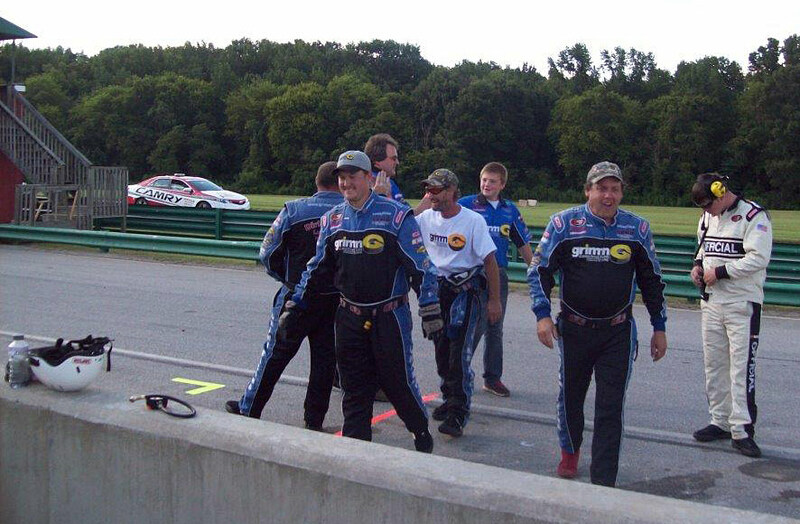 DAYTONA BEACH, Fla. – The NASCAR K&N Pro Series East will make its inaugural visit to Virginia International Raceway in Alton, Va., on Aug. 24, 2013. 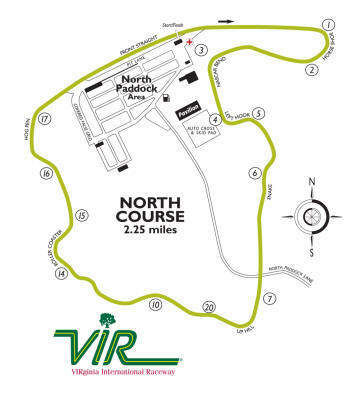 The event will replace the race previously announced for CNB Bank Raceway Park on July 20 in Clearfield, Pa.
With Virginia International Raceway joining the NASCAR K&N Pro Series East calendar, NASCAR’s top development series will now have two road course dates in 2013. 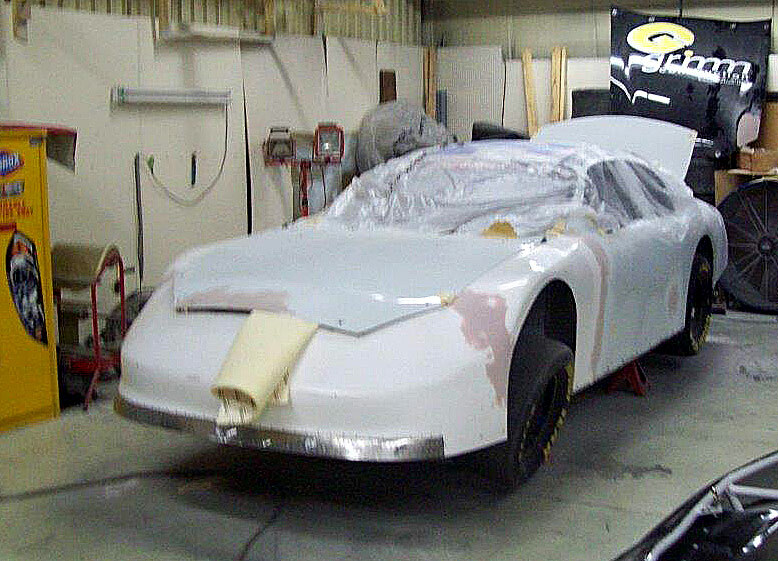 The series was already scheduled for its inaugural event at Road Atlanta on Oct. 18 in Braselton, Ga.
After posting a third place run in Freddie Peterson’s ACT Late Model in the Governor’s Cup 150 season opener at Lee USA Speedway, Eddie Mac and the team set similar expectations in the Merchants Bank 150 at the famed bullring in Barre, Vermont. 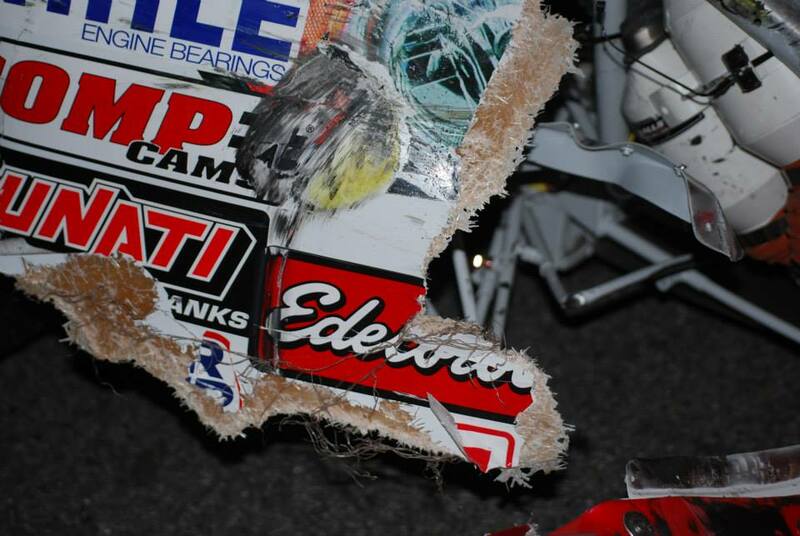 However, Eddie fought an ill handling car starting in practice on Sunday. 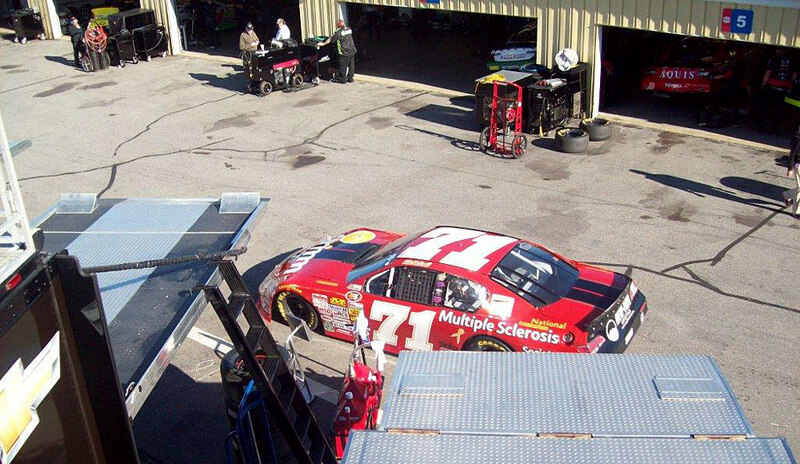 The crew made a number of changes on the Hancock Electric/MS Society Chevy yet nothing appeared to make the car handle as it did on Saturday. 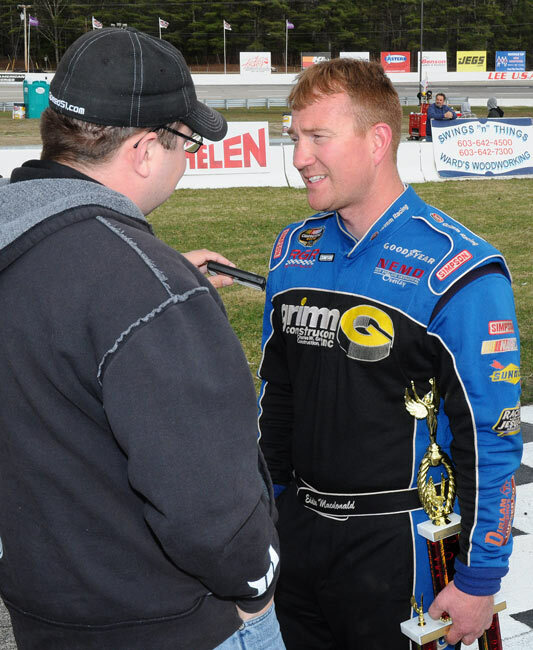 After finishing sixth in the heat race, Eddie qualified for the 15th annual Merchants Bank 150 in the consolation race and had to start in the 23rd position. Thirty six NASCAR K&N Pro Series East cars took the green flag in the Blue Ox 100 at Richmond International Raceway on Thursday with Eddie MacDonald in the unenviable 33rd starting position. 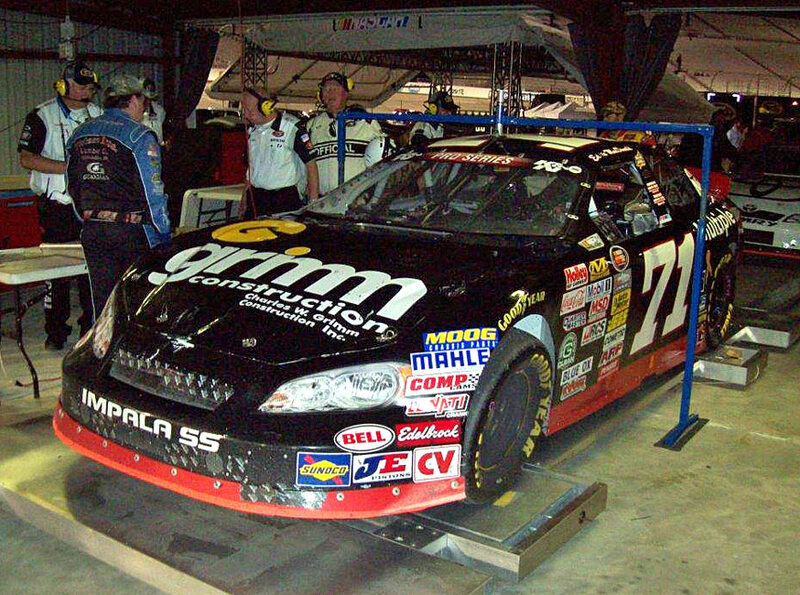 When the checkered flag waved at the end of the 100 lap (75 miles) race the Grimm Construction Chevy scored an impressive fourth place finish. MacDonald’s time was only 33rd fastest and had to take a provisional spot to make the field with hopes the car would run well enough until the team could make adjustments during the first caution. 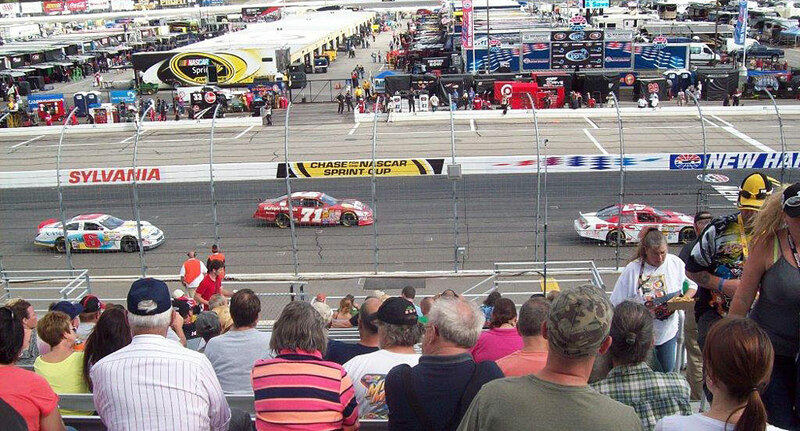 Their wish came to be with the leader only 20 car length’s behind the #71 as the first caution flag waved on lap 46. Two critical moves were made in the pits that propelled MacDonald through the field for the remaining laps. The second critical move involved the hood pins. Richmond is only .75 of a mile so the pace car speed around the oval does not allow much time for under the hood adjustments. 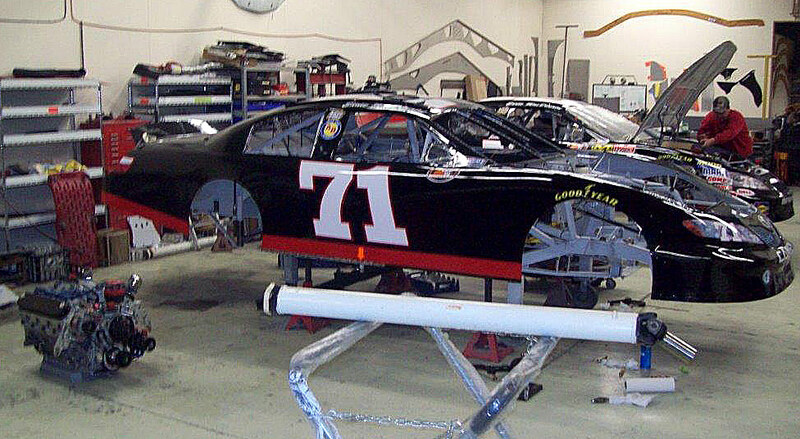 With the pace car leading the field out of turn four LaChance instructed the crew to replace only two hood pins knowing the official would order the #71 back to pit road to replace the rest of the pins. 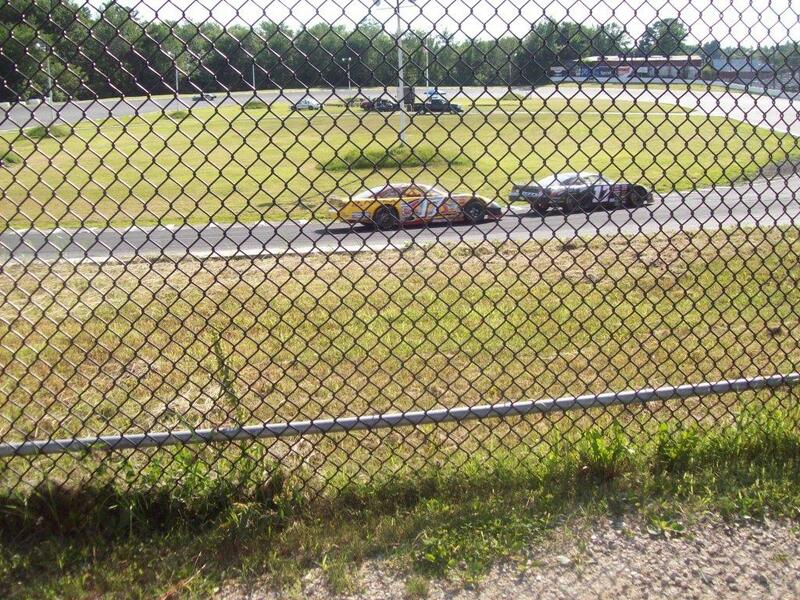 However, the move allowed MacDonald to get back on the track just ahead of the pace car and not go a lap down. 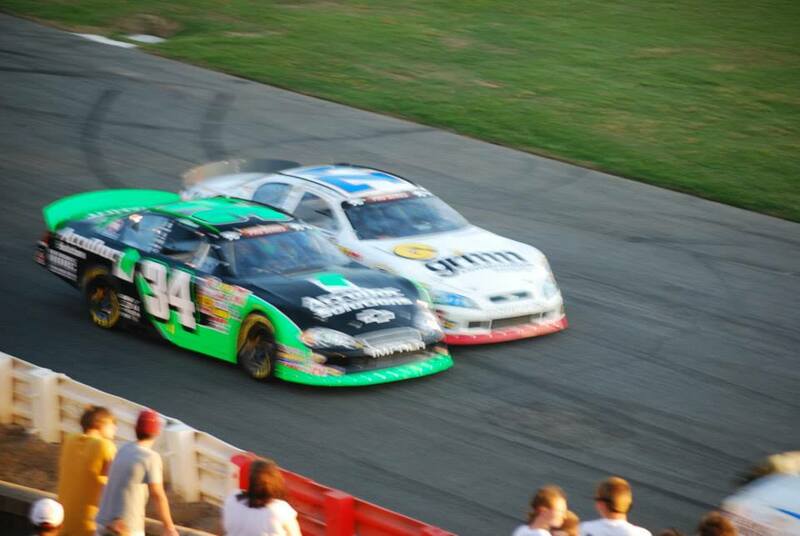 The green flag waved with only four laps to go with MacDonald in seventh place. The #71 quickly passed two cars on the restart and with only two laps to go passed the #11 car after a door to door battle to take the fourth spot and secure the team’s best finish this season. The run vaulted Eddie Mac back into fifth place in the point’s race. After a hectic few weeks, the team has a little time to catch its breath. 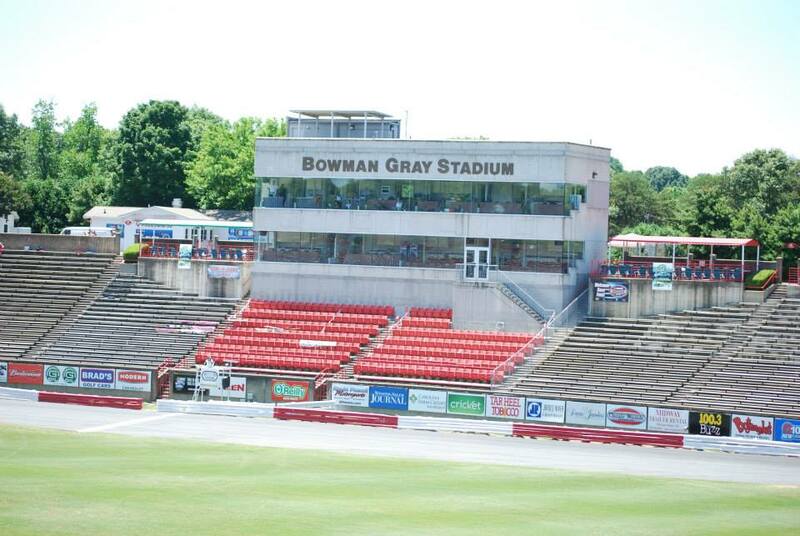 The next K&N race will be on June 1 at the legendary Bowman Gray Stadium in Winston Salem, N.C. for the NASCAR Hall of Fame 150. 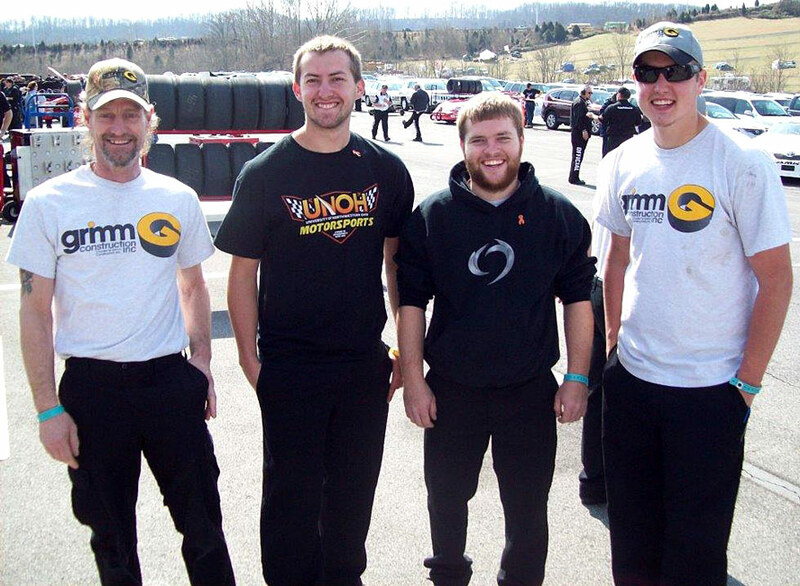 Racing may be about winning but it also has plenty of room for support and compassion for people and causes and this is what Grimm Racing is all about. If anyone has any doubt about the validity of the statement, all they have to do is to look at the vinyl covering the car. 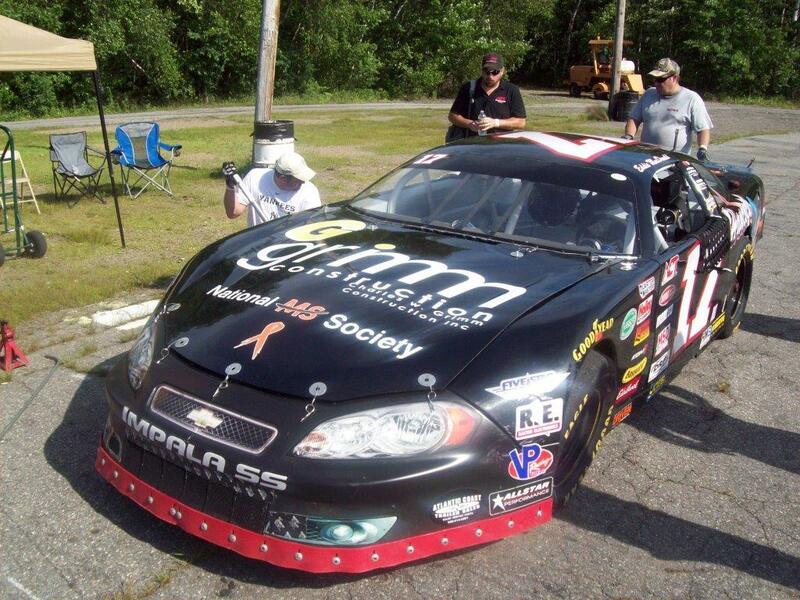 The MS, New Path Adventures, Boston Strong logos, and the Eric Williams emblem are displayed on every Grimm car. 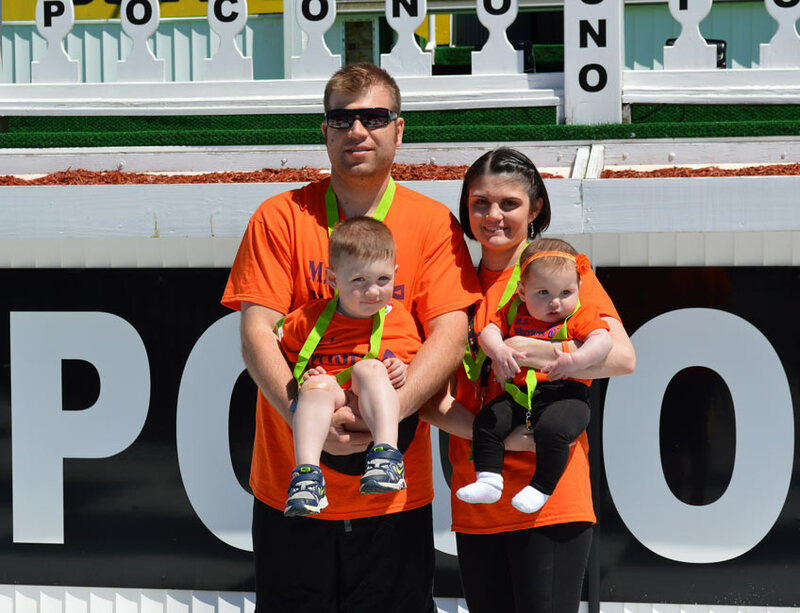 The Grimm family was deeply moved by the horrific events on Marathon Monday in Boston and the decision was easily reached to display the “Boston Strong” ribbon on the car. 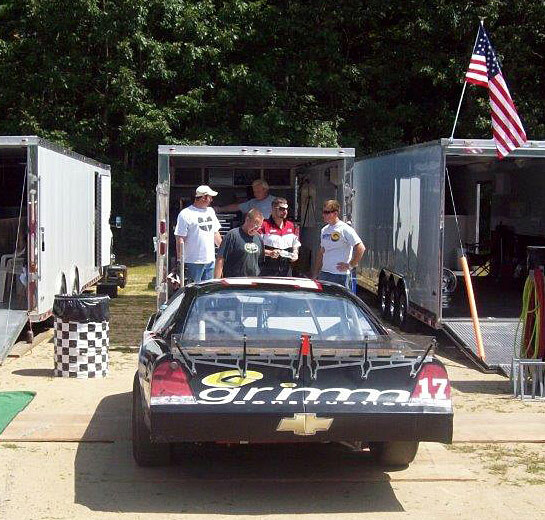 Eddie MacDonald and many of the team members call the Boston area home and felt the need to support those killed, injured, and their families was something Grimm Racing does for all those in need. 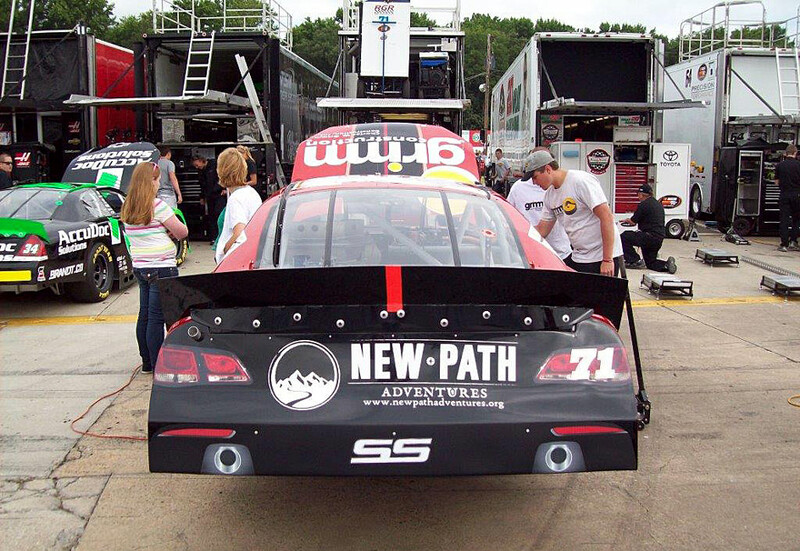 Rob Grimm decided that “New Path Adventures” logo would be displayed on the back of the car for the season. 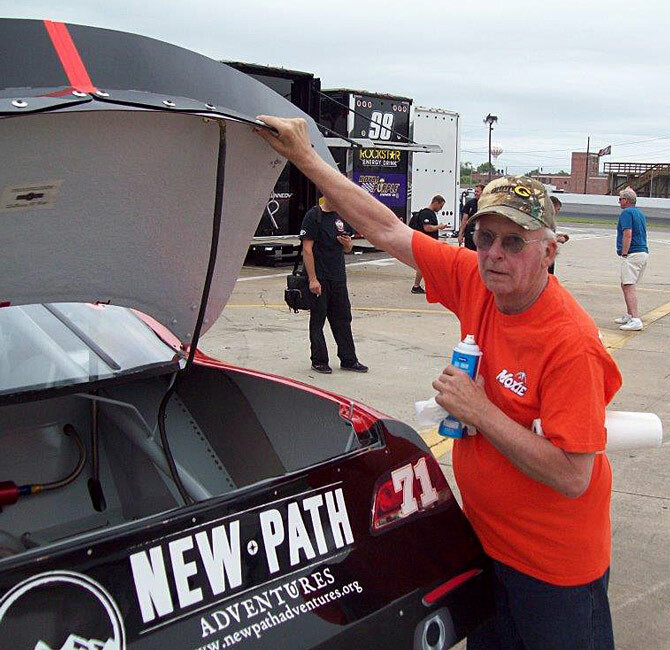 New Path Adventures is based in Dallas, Texas and ministers to troubled youths ages 13-19. 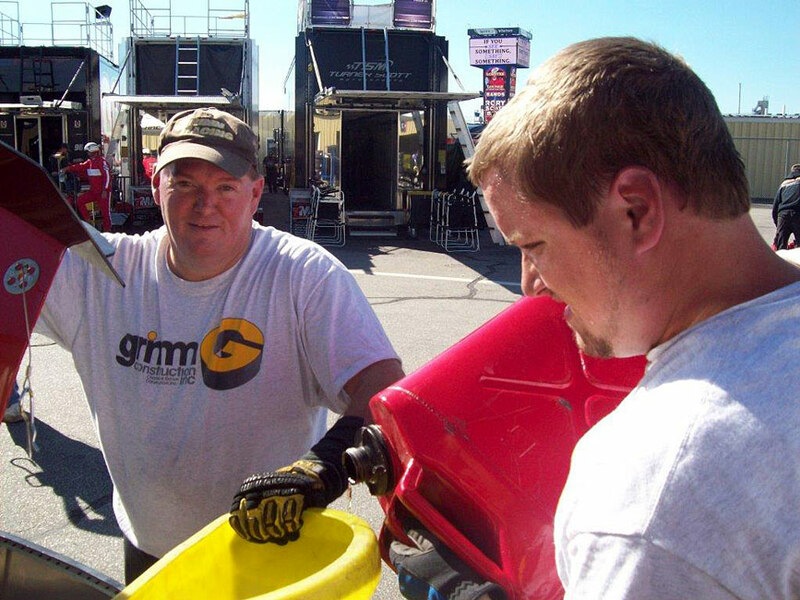 Crew member Steven Owens, nephew of Rob Grimm, is proud to say his brother Jonathan Owens and Alan Owens offer guidance and a positive change in the choices these youngsters make in their daily lives. 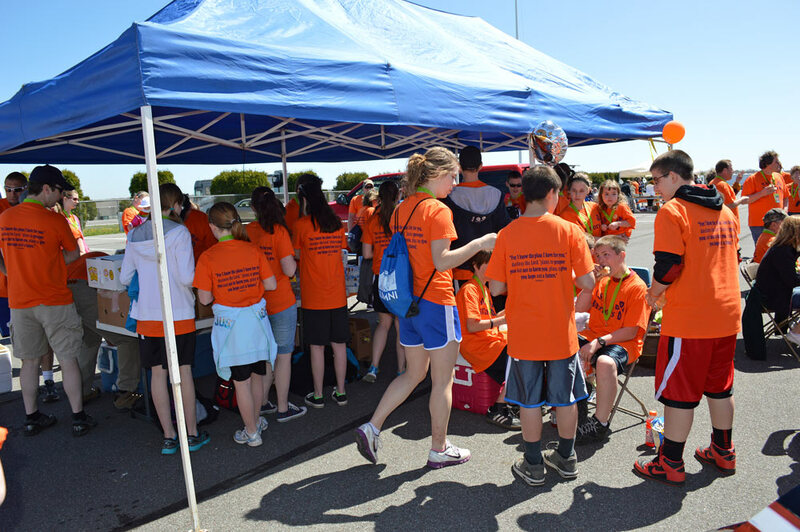 The Spanish to English Ministry recently completed a very successful bike ride across the state of Texas, an 865 mile journey, to raise money. Alan and Jonathan work with a group of 7-10 youngsters by taking them from their environment and harmful behavior, minister to them while living out of backpacks in the wilds of Texas. NewPathAdventures.org is a good source for information. 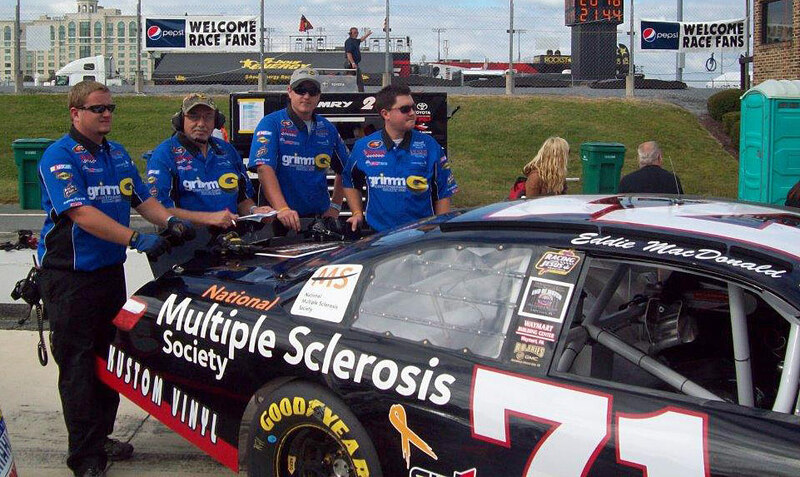 Being a member of Grimm Nation is much more than supporting the #71 on the track. It means a commitment to show support for those in need. 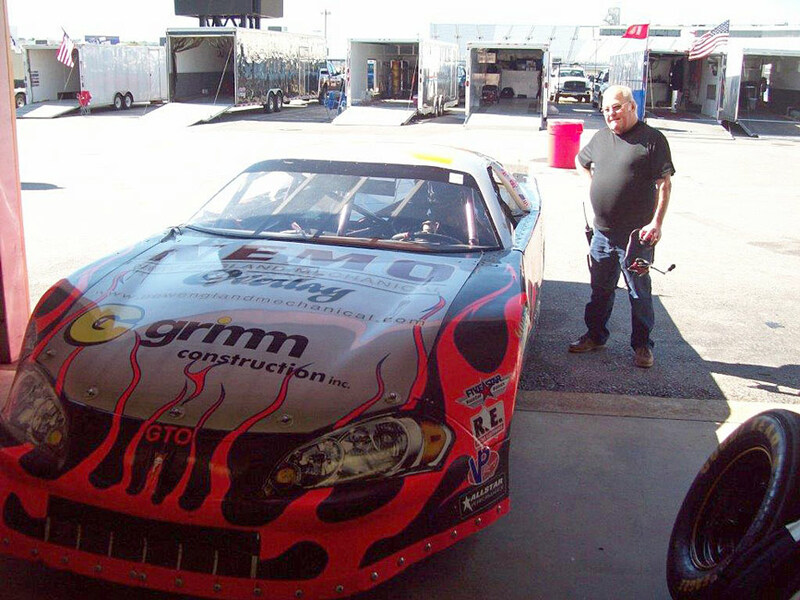 After last week’s races in Florida and New Hampshire, Eddie MacDonald and the Grimm Racing Team will take the green flags this week on Thursday at Richmond International Raceway and on Sunday at Thunder Road in Barre, Vermont. For the third year in a row, RIR will host NASCAR’s K&N Pro Series East event in the Blue Ox 100 as part of the big Cup weekend at the banked .75 mile D-shaped track. 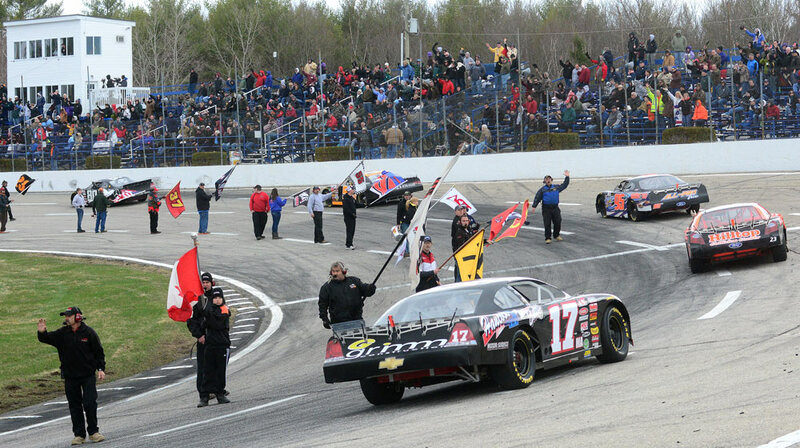 When the checkered flag waves sometime Thursday night, the team will pack up for a return to the Newburyport, Mass. 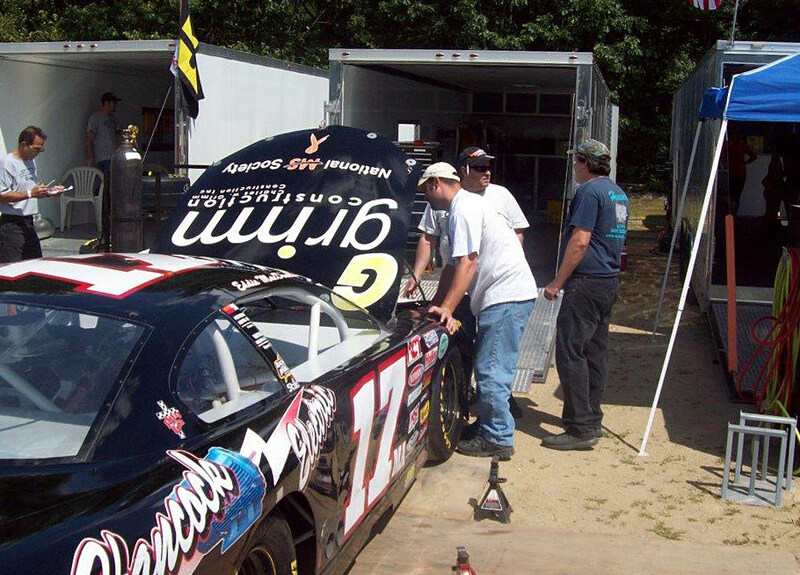 shop on Friday to get ready for a Saturday morning departure for the American Canadian Tour race at the historic “bullring” in the Green Mountain state. NASCARHomeTracks.com will live stream practice (beginning at 12:00 noon), qualifying, and the Blue Ox 150 from Richmond on Thursday, April 26. Speed will televise a tape of the race on May 16 at 3:00 pm. 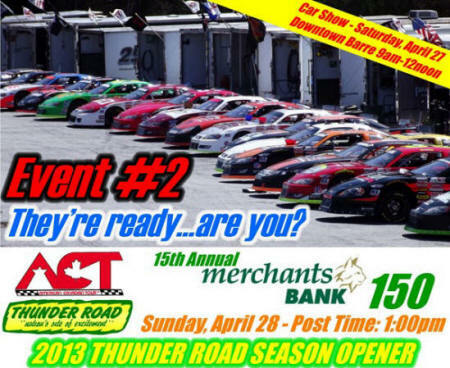 Action gets under way at Thunder Road at noon with the ACT race scheduled for 4:30 pm. • Originally known as the Atlantic Rural Exposition Fairgrounds, Richmond International Raceway held its first race in 1946 as a half-mile dirt track. • The track name changed to Virginia State Fairgrounds in 1967. • The track surface was changed from dirt to asphalt between races in 1968. • The track name changed to Richmond Fairgrounds Raceway in 1969. • The track was re-measured to .542-mile in 1970. • The track was rebuilt as a three-quarter-mile D-shaped oval following the Feb. 21, 1988 race. • Has six wins, two poles and 77 top 10s in 161 career starts. • Has finished in the top 10 in 19 of his last 22 starts dating back to the 2011 season. 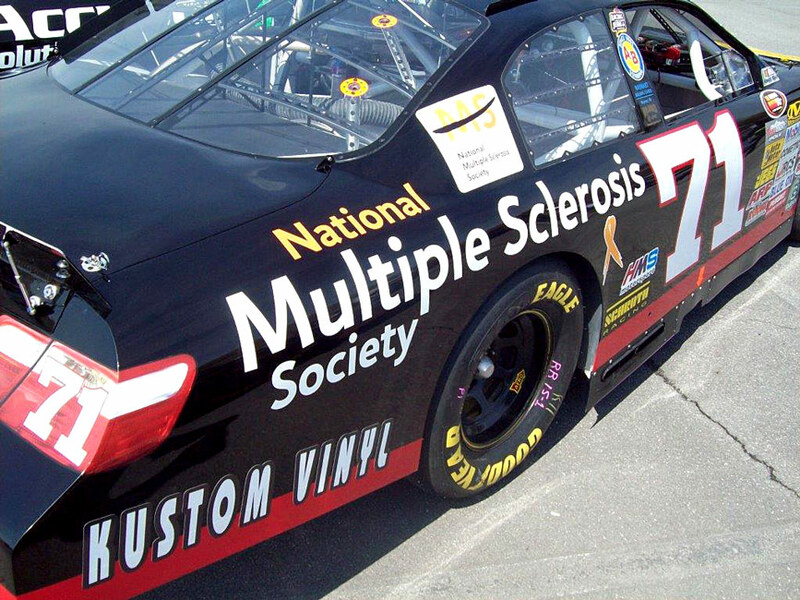 • Has finishes of 14th and eighth in his two career starts at Richmond. • This week will mark his 162nd career start, which will tie him with past series champions Brad Leighton and Andy Santerre for 10th on the all-time list. 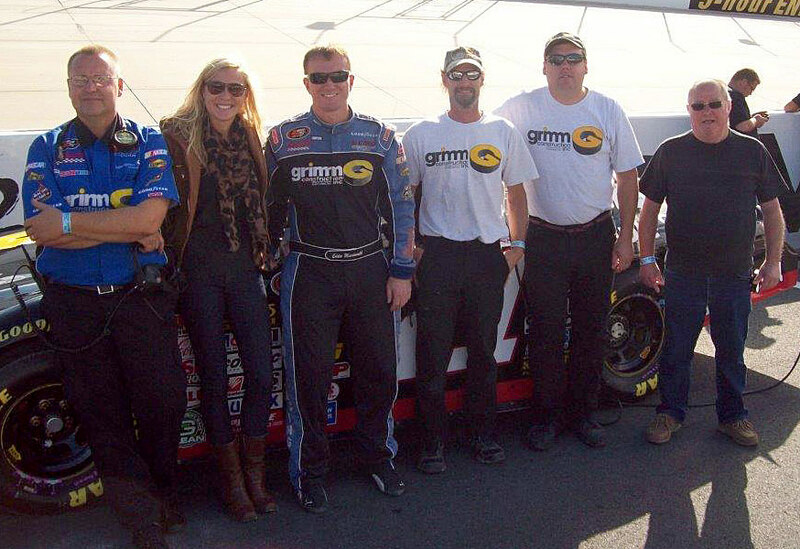 In less than 24 hours Eddie MacDonald and the Grimm Racing Team competed in two races separated by 1500 miles. 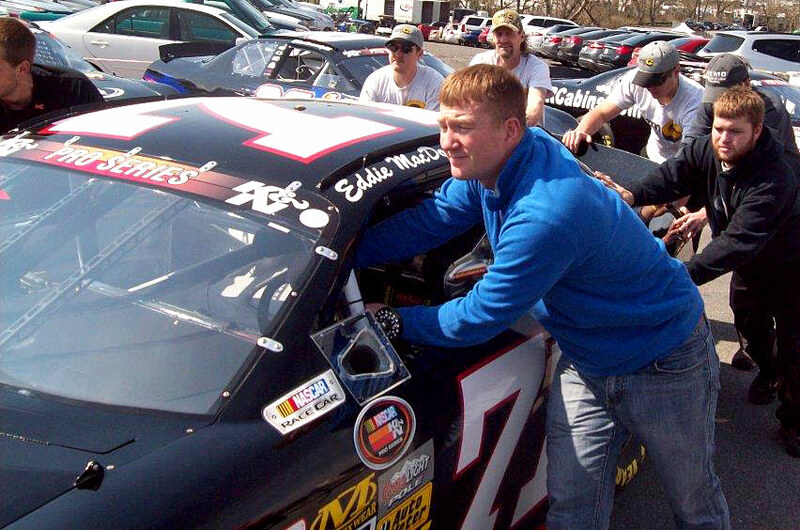 On Saturday night, MacDonald finished 15th in the NASCAR K&N Pro Series East race at Five Flags Speedway in Pensacola, Florida. 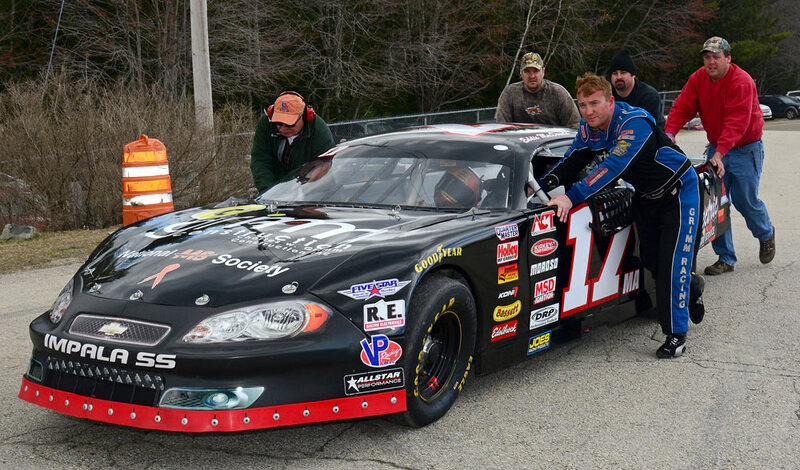 On Sunday afternoon the veteran driver took the checkered flag in third place in the American Canadian Tour’s Governor’s Cup 150 at Lee USA Speedway in Lee, NH in the season opener. The Rowley, Mass. native started 23rd in the inaugural NAPA Auto Parts 150 on the half mile track in Florida and was headed toward the front when the handling went away. 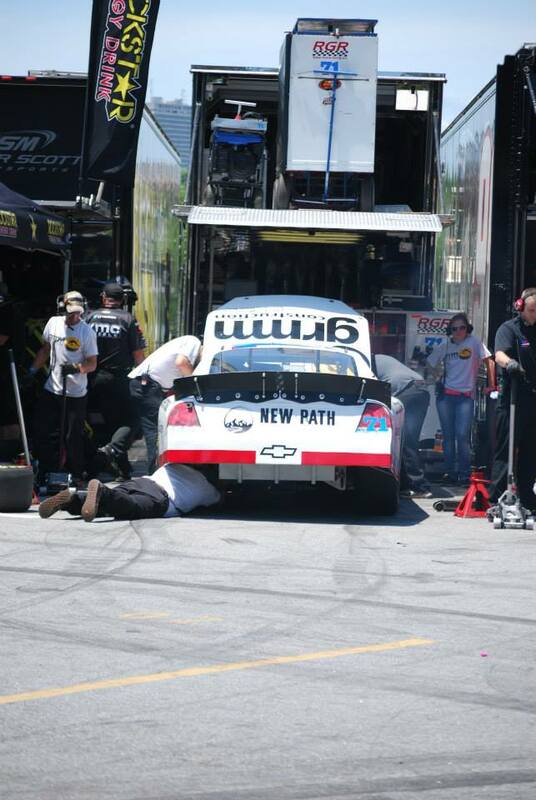 A mandatory ten minute break at the halfway mark allowed the teams to make adjustments and change four tires. 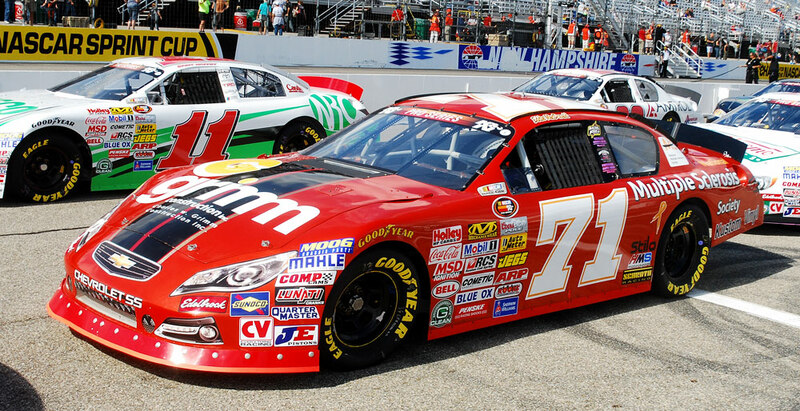 The #71 Grimm Construction Chevy ran in the 12th spot with MacDonald confident of a good finish. 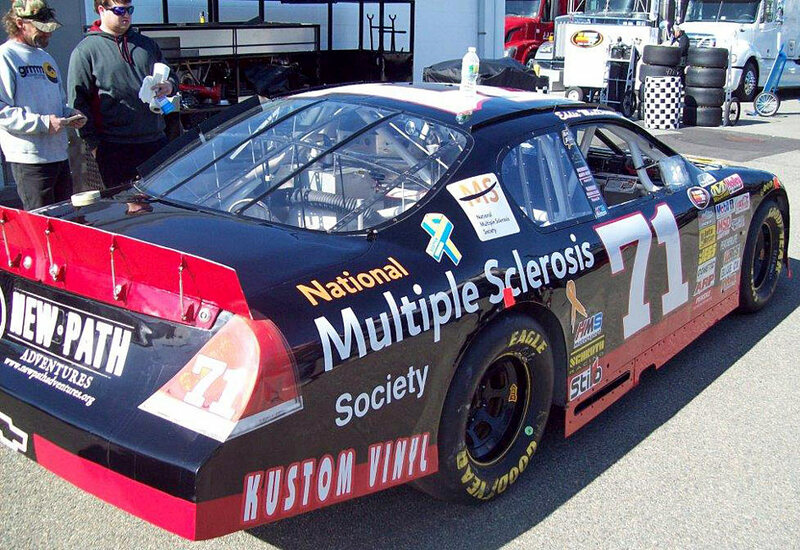 The #71 carried the National Multiple Sclerosis Society logo on the rear quarter panels as it will all season in support of MS Awareness. The #17 Late Model raced at also displayed the Logo for the Governor’s Cup race with Eddie Mac saying, “It is always great to win but you really realize what is important when something like MS affects someone you know. The Grimm family needs all our support at this time and hopefully we can raise awareness and support to find a cure for this disease. It was great to have a lot of family members make the trip from Pa. to Lee for the race. It really meant a lot to us to have them there. I didn’t get to see everyone, but knowing they were there to support us with everything they are dealing with really says a lot about their strength. 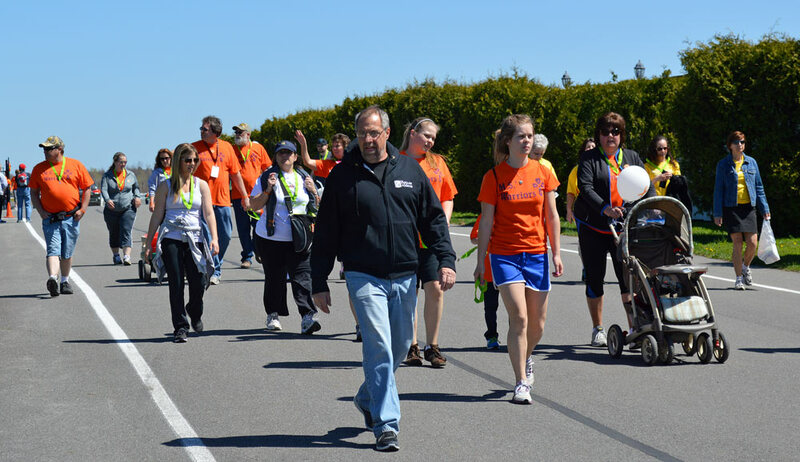 Megan and a lot of Grimm Nation will be participating in the MS Walk around Pocono Speedway on May 5 and I urge everyone to support the cause in some way. 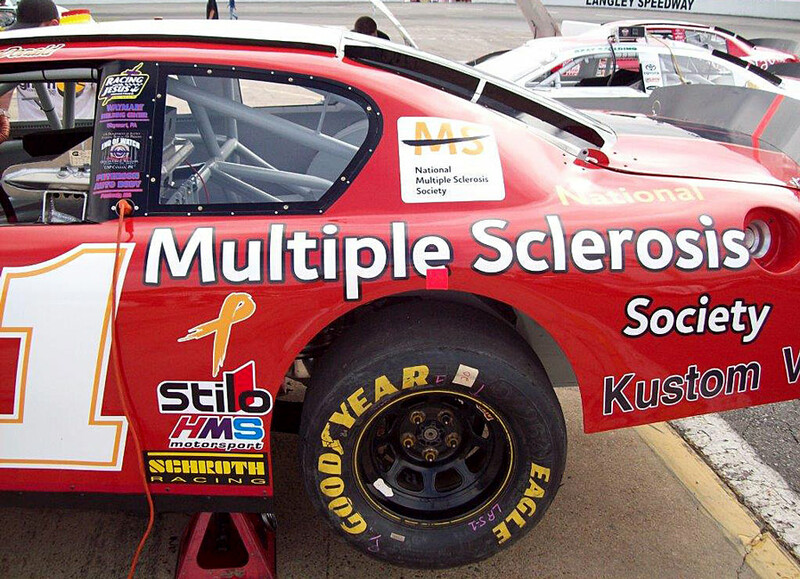 Donations can be made in Megan’s (Spaulding) name to the MS Society. 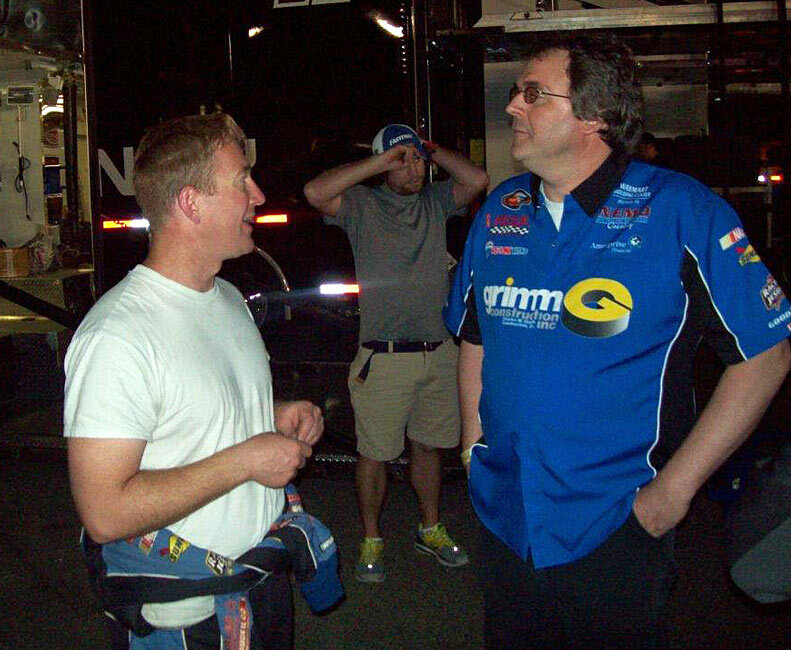 When the NAPA 150 ended, crew chief Rollie LaChance and Eddie Mac drove five hours to Atlanta airport to catch a ride to Boston. 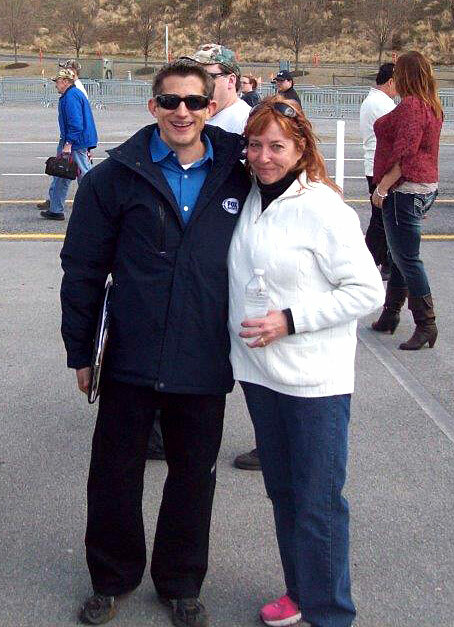 The exhausted pair arrived at the track at 11:00 am just in time for the driver’s meeting. 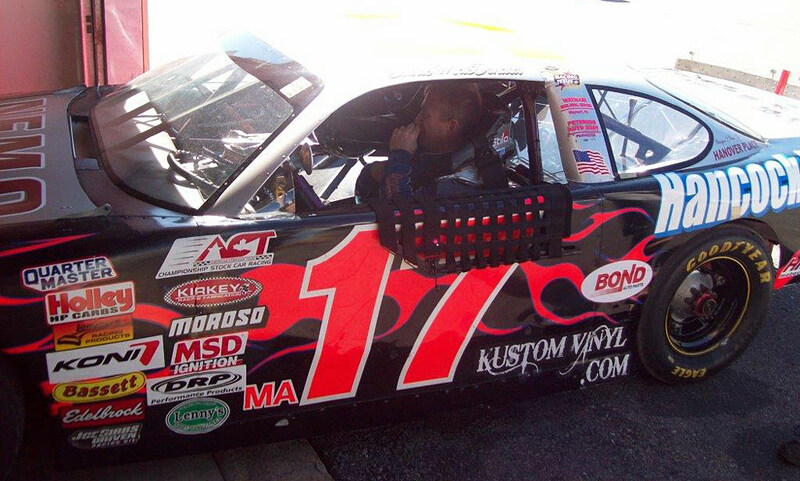 With only one 40 minute practice session the #17 was able to finish fourth in the heat to secure an 18th starting position for the 150 laps. When the green flag waved MacDonald advanced a few spots and was riding comfortably until lap 60 when LaChance suggested he pick it up with the leaders closing. By lap 76, Eddie Mac was 12th and heading to the front. After the caution on lap 90, the Freddie Peterson owned Chevy began making its move to catch the leaders. A spectacular three wide pass with MacDonald splitting the outside and inside cars was rewarded with a third place position with sights set on the top two drivers. 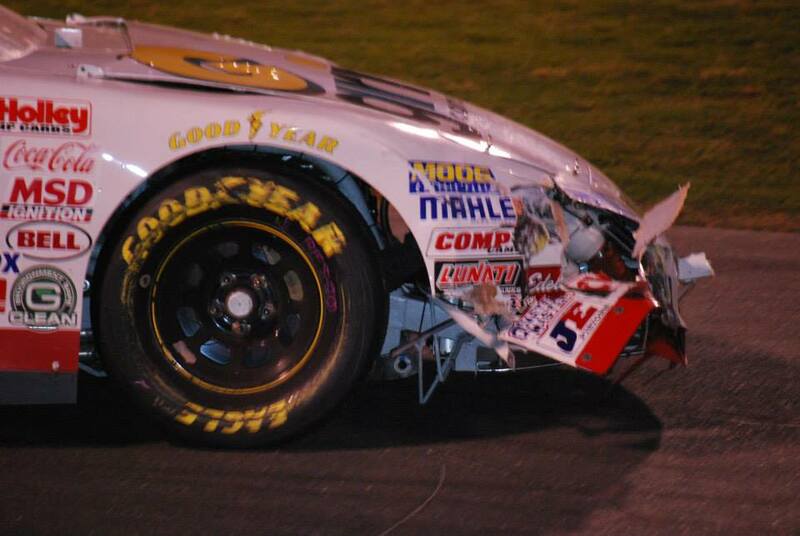 MacDonald took over second on lap 128 with 22 laps remaining but three caution flags took their toll. 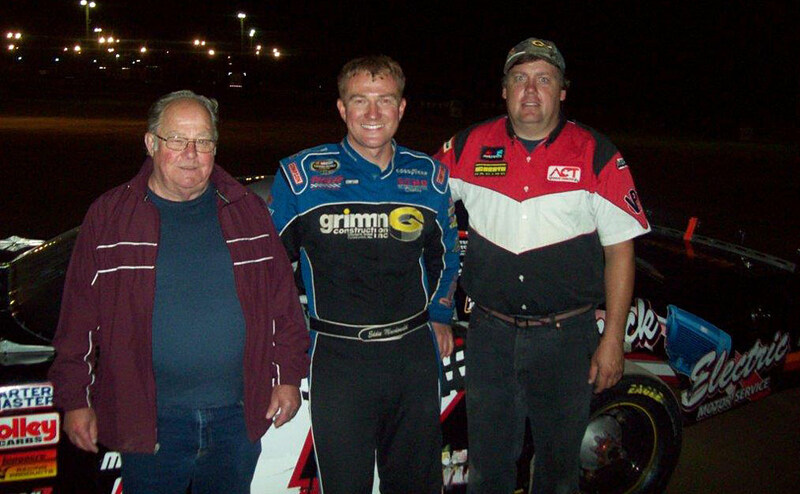 L to R: Eddie MacDonald #71, 3rd; Winner Jimmy Herbert #58: & Travis Fadden #1, 2nd. 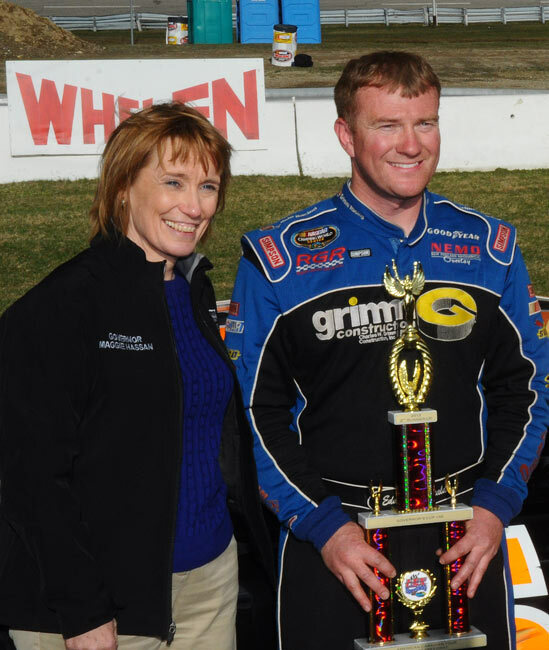 The Lee USA Speedway is honored to announce that Governor Maggie Hassan will be the Grand Marshall for the Annual Governor’s Cup 150 on April 14th. In January, Mrs. Hassan became only the second woman ever to be sworn in as New Hampshire’s governor. Prior to becoming governor, she served in the NH Senate for five years representing the 23rd district which includes Exeter and Kingston and was the Majority Leader. Her husband Thomas is principal of Phillips Exeter Academy. 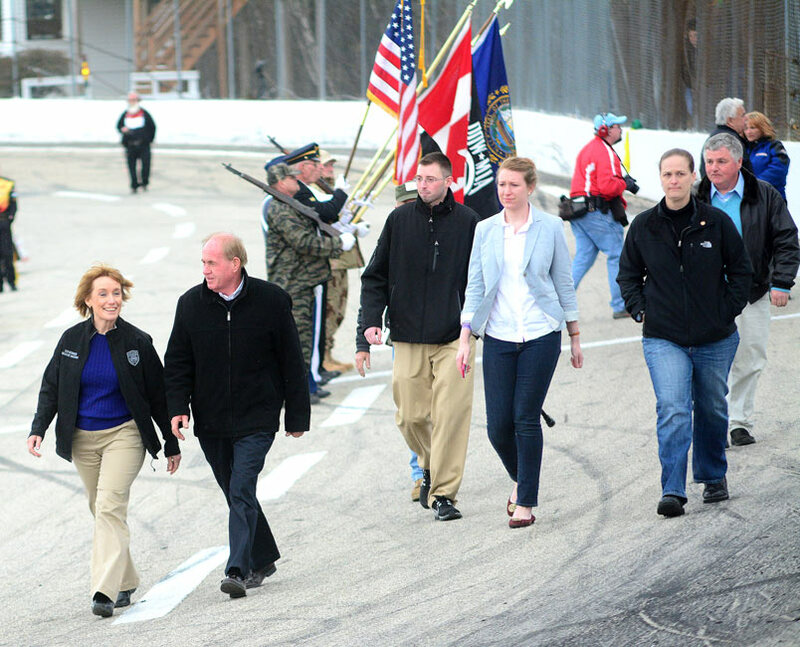 Governor Hassan will welcome the thousands of racing fans flocking to the Lee USA Speedway from all over the northeast and Canada for the very first auto racing event of the 2013 season in the Granite State . 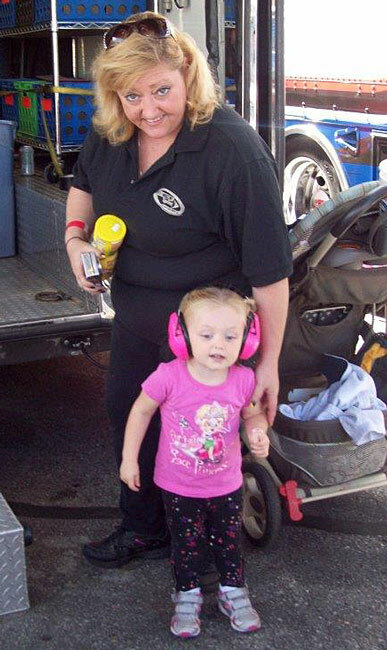 She will personally greet the drivers before the race, drop the green flag on the main event, and award the prestigious Governor’s Cup Trophy to the winner. 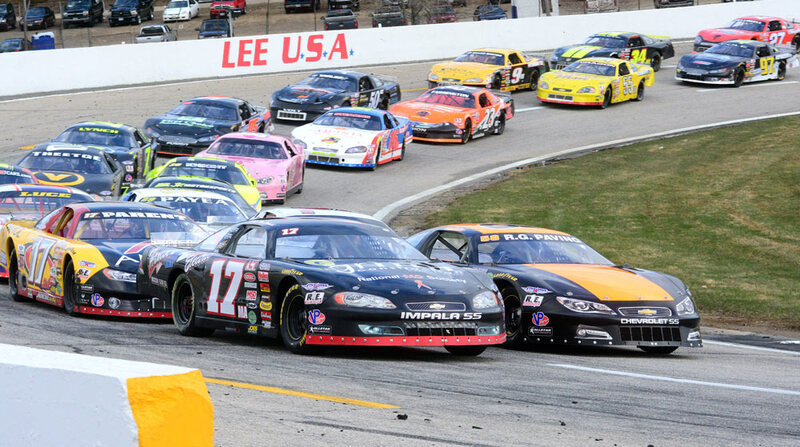 Like the Daytona 500 is to NASCAR, the Governor’s Cup 150 is the biggest race of the year at Lee USA and the kickoff of the American Canadian Tour. 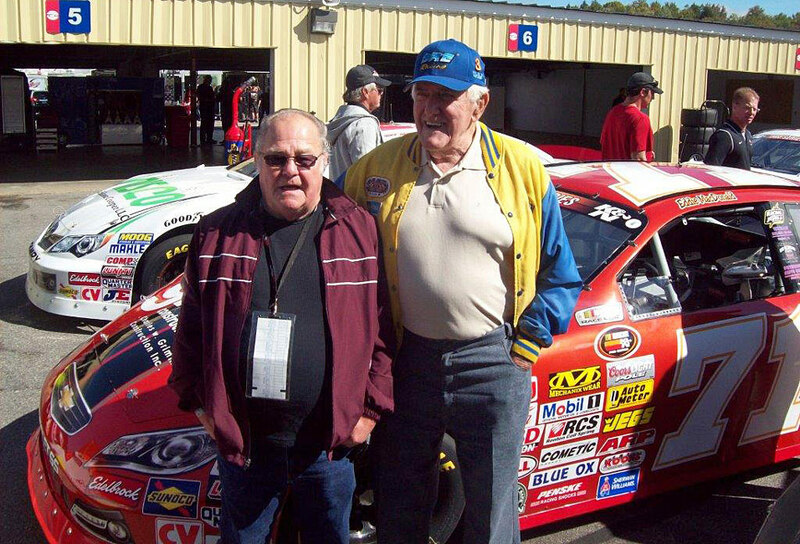 Approximately 50 of the best late model drivers of both countries will be vying for “The Cup.” Legendary drivers Marty Vachon, Dave Dion, Bobby Gahan, Myles Chipman, and Beaver Dragon have all won this premier event. Many more would like to join them. Pelham, NH driver Joey Pole won the big trophy two years ago, but last year “The Cup” went back to Vermont with 5 time ACT Champion Brian Hoar. Hoar took the lead to win his first Governor’s Cup late in the race after several local favorites faltered. 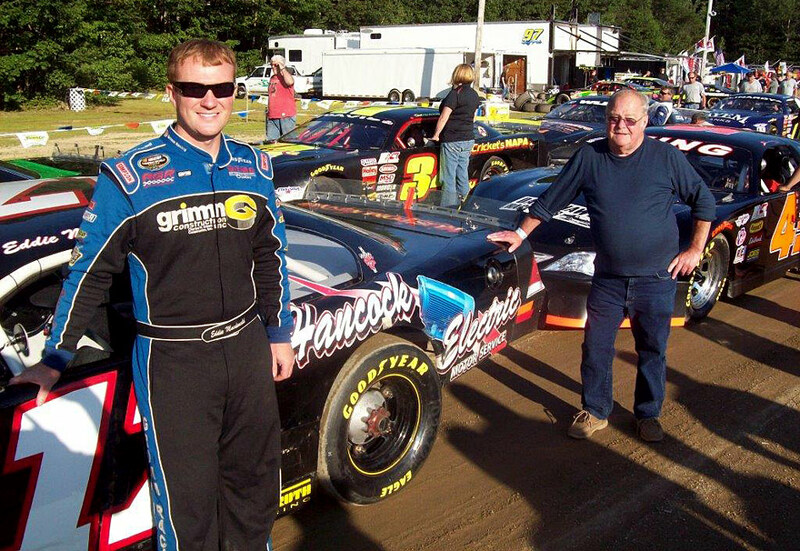 Pole and arch ACT rival Wayne Helliwell, Jr. of Dover are the Granite State’s best two chances to win it back. Helliwell is the local favorite. In 2012 he knocked off Hoar on top of the ACT standings after a five year reign. He has won four Lee USA titles and nobody knows the track better than he does. But he seems to be able to win the big ACT races everywhere but here. 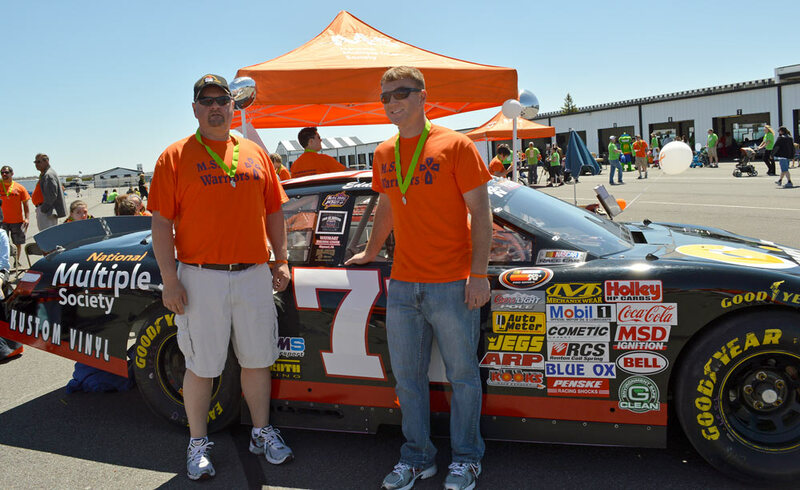 Last year, he put his bright orange EKeys for Cars #27 on the pole for the Governor’s Cup 150 and led the first half of the race. However the blistering pace overheated his tires and he fell back into the pack. As the same phenomenon slowed the late race leaders, Helliwell rebounded to finish a close second to Hoar. A few more laps and the race might have been his. Favored to win whenever he straps in at an ACT Tour event is Eddie MacDonald, son of Lee USA Speedway owners Red and Judy MacDonald. 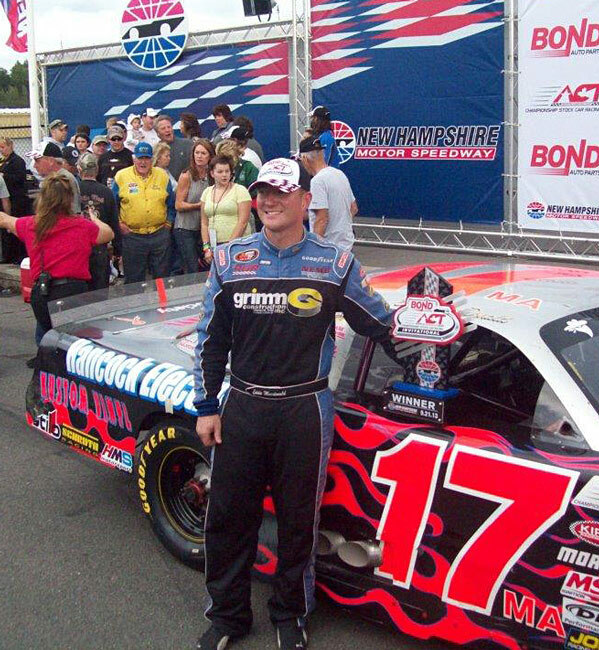 Eddie Mac has won twice at the big track in Loudon and has won the Oxford 250 in Maine twice in a row, but he has never won a single race at his family owned facility. 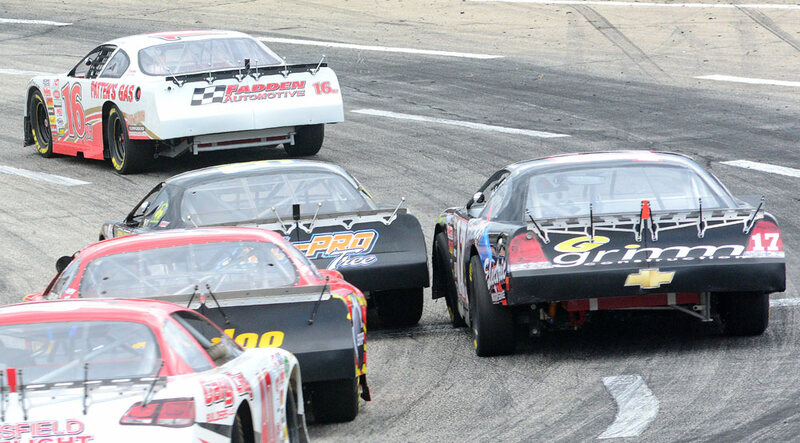 Last year Eddie brought a brand new car to the Governor’s Cup 150 and surged from mid pack to take the lead from Maine driver Ben Rowe on lap 109. 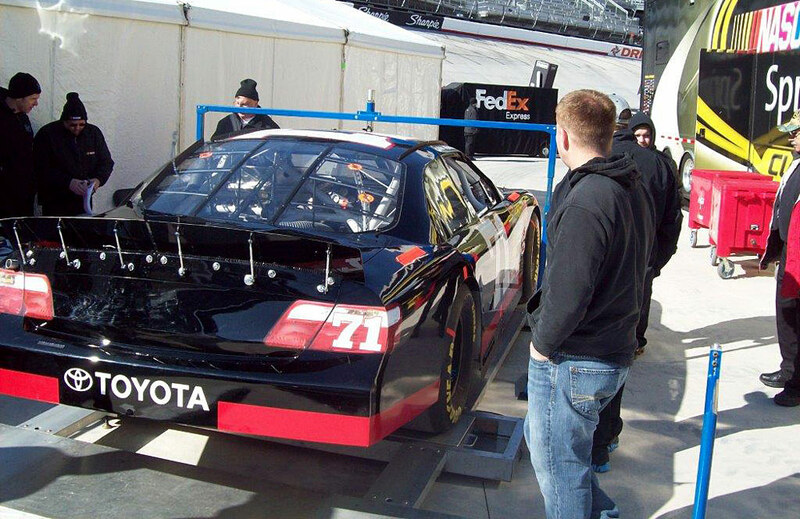 Just when he seemed to have that first win in the bag, the handling went away on his jet black #17. A mere 20 laps from the finish he was tapped from behind and bobbled the car for an instant allowing the lead and victory to slip away. 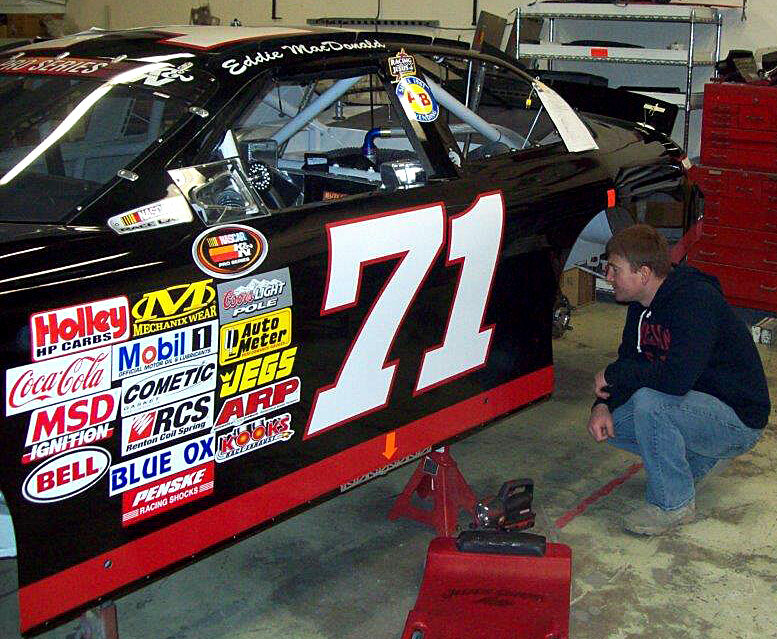 MacDonald will be flying in from Florida where he is scheduled to compete in a NASCAR K&N Series event on Saturday night. He hopes to make it to the track by 11 AM on Sunday morning. He won’t have much time to ready his ride for qualifying heats. No time trials here. And the heats are intense. Only the first six make it through the first round. 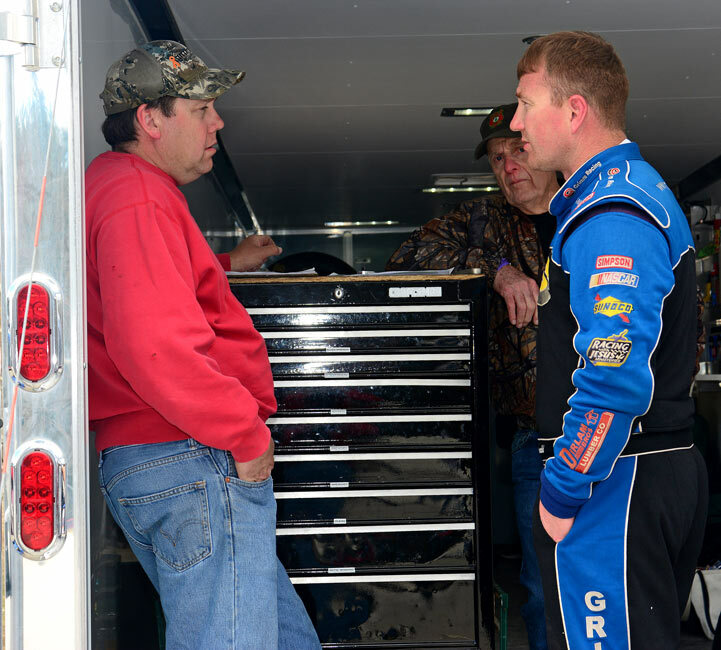 A second round of qualifying will fill out the 28 car field, but more than a dozen drivers usually are forced to take that long ride home without even getting a starting berth in the Governor’s Cup 150. In addition to the Governor’s Cup 150, 50 lap events for the Late Model Sportsman and the North East Mini Stock Tour will complement the program. Lee USA’s 2012 late model sportsman champ JR Baril will begin his title defense. His most serious challenger is Michelle Fushpanski, who was runner up last year. She has since built a completely new car to wrest the crown away from Baril. The late model sportsman event will be open to all similar cars throughout the region and many are expected. 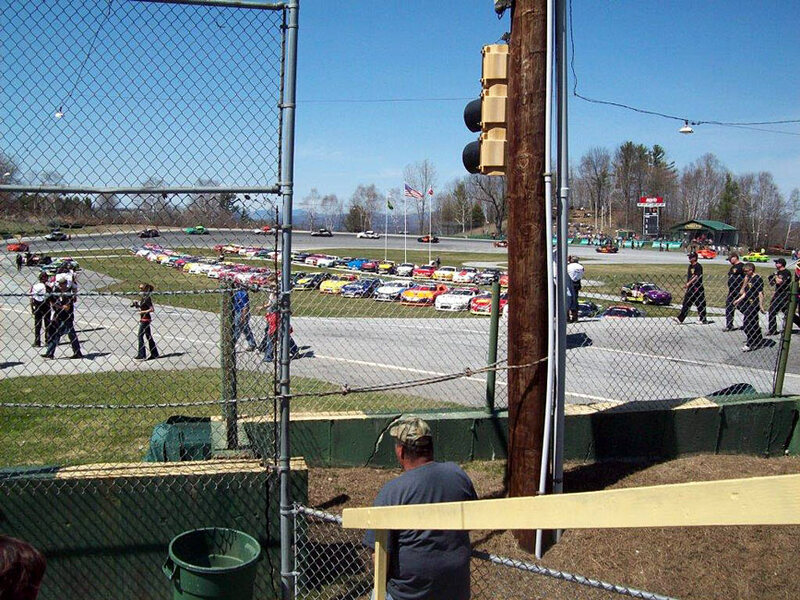 However, fifty points will be awarded to all Lee USA Speedway regulars making it an imperative start for any driver considering a championship bid. Four cylinder standouts Loren Smith, Emerson Cayer, Billy Osborne, and 2012 NEMST Champion Danny Field will compete in the mini stock 50 lapper. 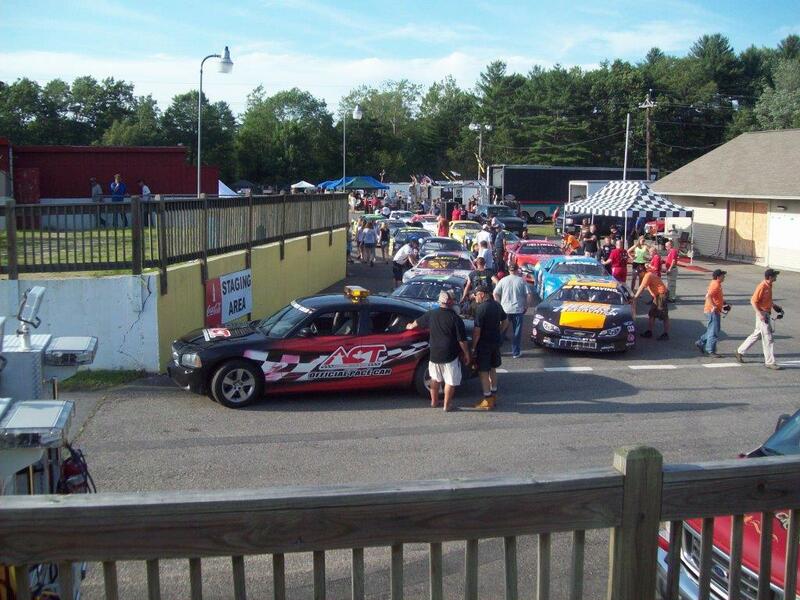 Twenty-seven entries from all over New England have already been received for the series’ season opener. Five hours of practice on Saturday afternoon are open to all from 12 PM to 5 PM. The gates will open for the Governor’s Cup 150 on Sunday at 10 AM with qualifying heats starting at 1 PM. 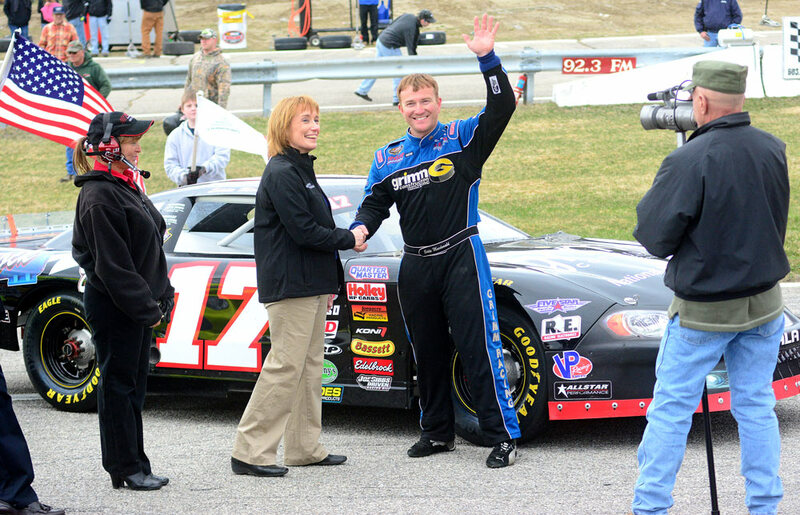 The Race: The NAPA Auto Parts 150 will be the inaugural event for the NASCAR K&N Pro Series East at Five Flags Speedway and the third of 15 races on the 2013 schedule. It will also mark the first points event in series history in the state of Florida. The Procedure: The maximum starting field will be 30 cars, including provisionals. The first 26 starting positions will be based on two-lap time trials and the remaining four will be filled through the provisional process. The race will be 150 laps (75 miles) with a 10-minute break at or near the conclusion of Lap 75. 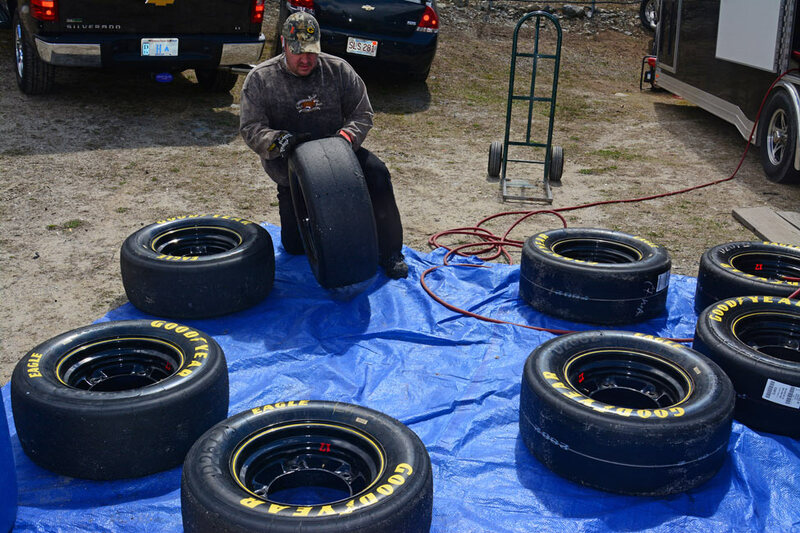 The maximum tire allotment is 16: eight for practice, four for qualifying and to begin the race and four additional tires for use during the race. The Track: Five Flags is a half-mile asphalt oval with 15 degrees of banking in the turns and nine degrees in the straightaways. The facility opened in 1953, the same season the track held its only NASCAR Sprint Cup Series event. The History: This marks the first stand-alone points event for the series. 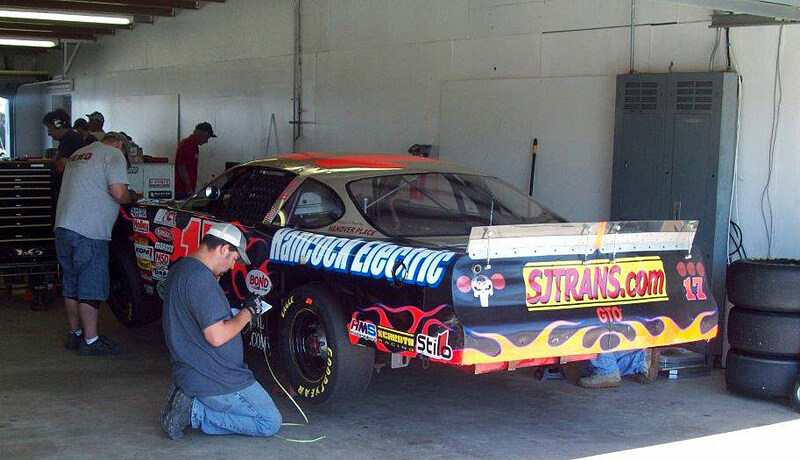 The former NASCAR Slim Jim All-Pro Series last made an appearance in 1997. Five Flags will become the 44th facility to welcome the K&N Pro Series East for a stand-alone event since its inaugural season of 1987. Florida will also be the 18th state the series has visited. • Has six wins, two poles and 77 top 10s in 160 career starts. • Has finished in the top 10 in 19 of his last 21 starts dating back to the 2011 season. 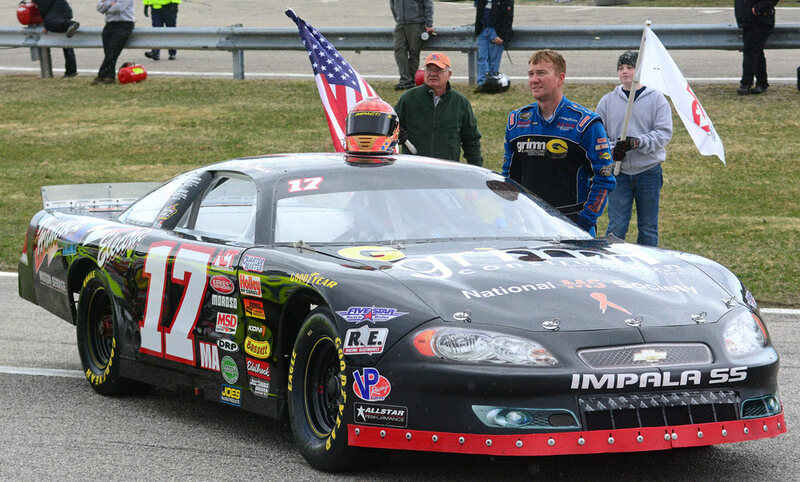 • Has three wins and an average finish of 12th in 94 career starts at 24-different intermediate short tracks. 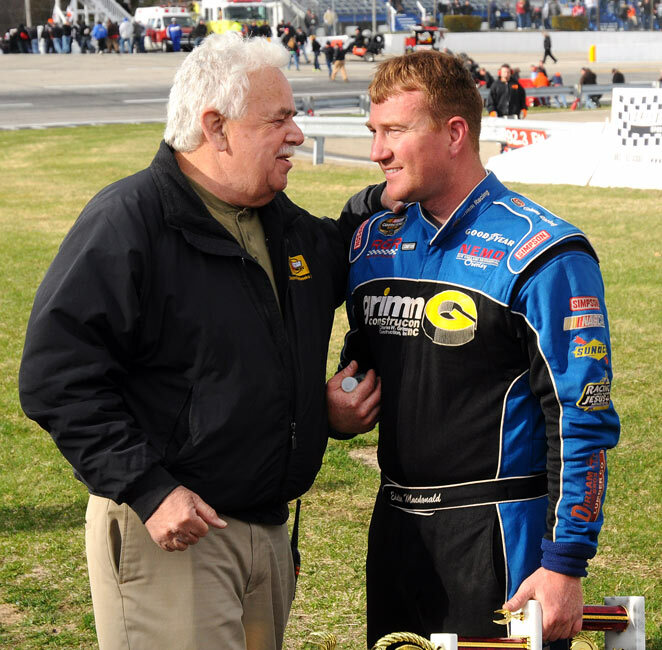 • The first edition NAPA Auto Parts 150 at Five Flags Speedway will also be the first stand-alone, points-paying race in NASCAR K&N Pro Series East history in the state of Florida. • Active career wins leader Brett Moffitt has won a race within the first four events of a season in each of his previous four years. He’s finished second and fifth in the current season’s first two events. • Only five drivers entered for this event have previous experience at Five Flags, which came in either Super Late or Pro Late Models. 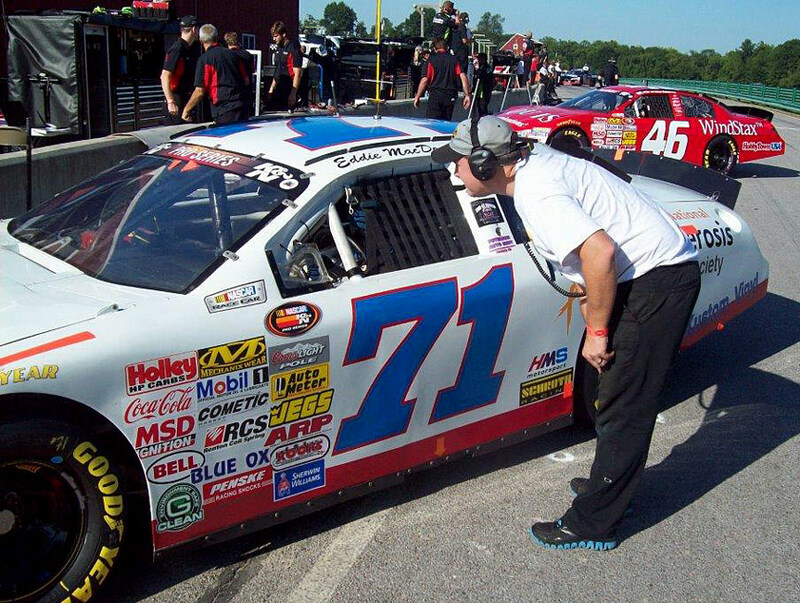 Eddie MacDonald posted a satisfying eighth place finish in the Kevin Whitaker Chevrolet 150 presented by G-Clean in the NASCAR K&N Series East’s second race of the season. The scheduled race date of March 23 was rescheduled to April 6 due to rain. 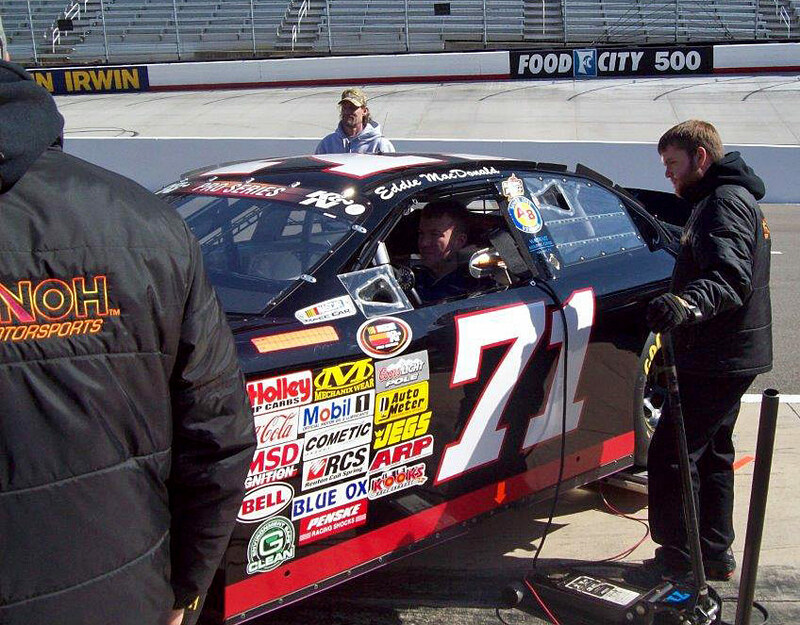 MacDonald scored a seventh place run in the season opener at Bristol Motor Speedway after starting 30th on the grid. 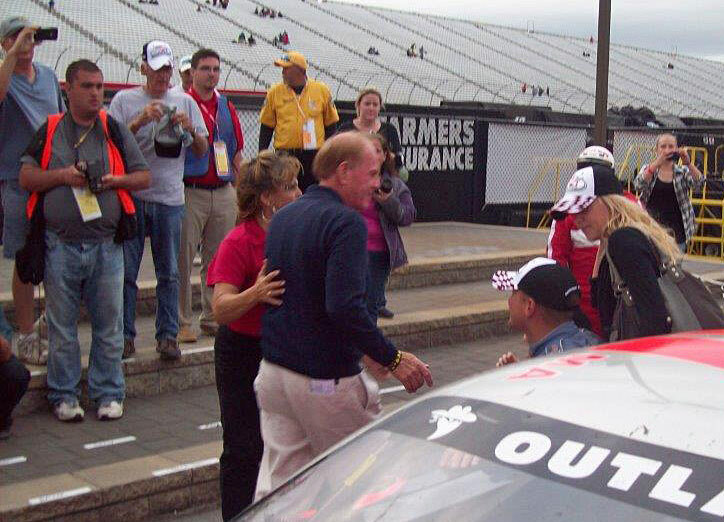 Eddie Mac received the Coke Cola Move of the Race Award for the Bristol effort. After two events both driver and team owner Rob Grimm sit in fifth place in the points. 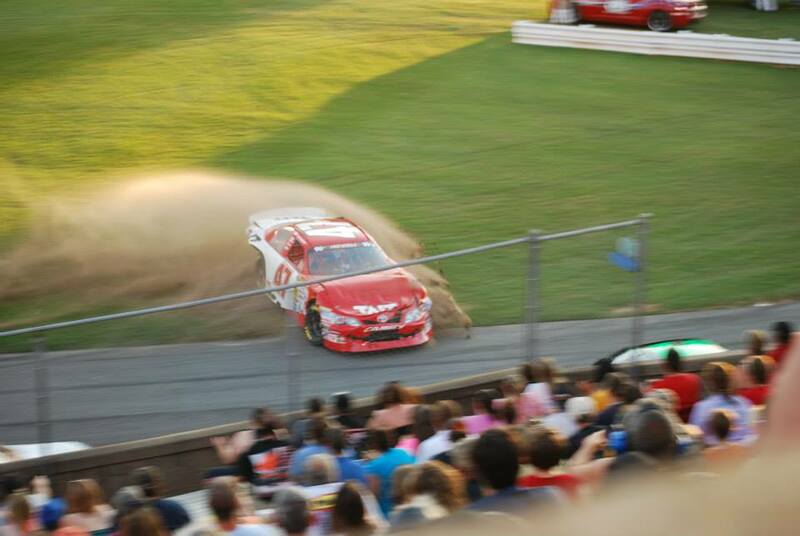 Five Flags Speedway is home to the famous Snowball Derby and is celebrating its 60th anniversary. The half-mile oval with 15 degree banking in the turns hosted only one NASCAR Cup series event during its first year in 1953 with Herb Thomas beating Lee Petty. 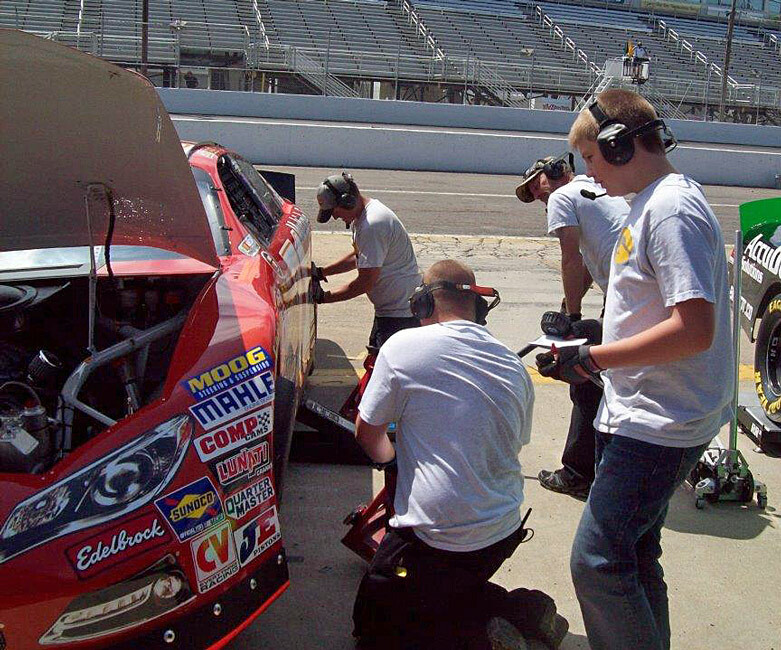 The K&N first visit schedule includes two practices, qualifying, and the NAPA 150 on Saturday. Speed 51 will broadcast the event on its website. 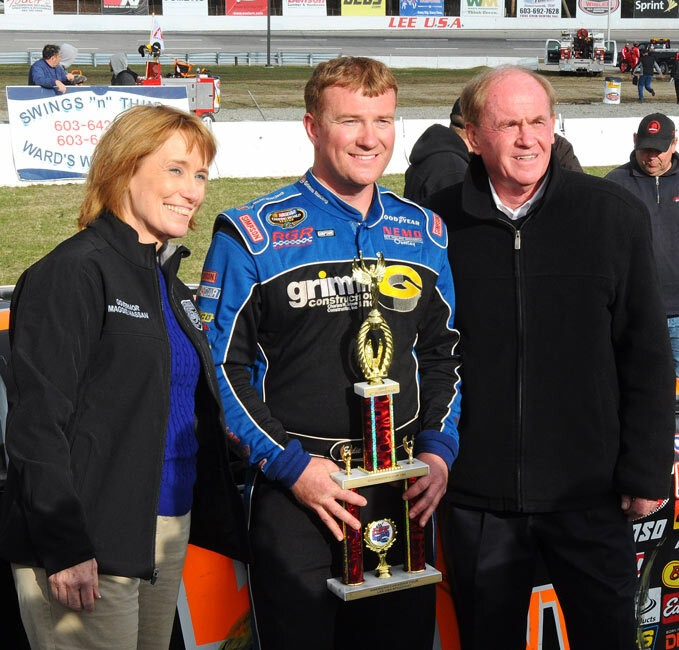 The Race: The eighth edition of the Kevin Whitaker Chevrolet 150 pres. 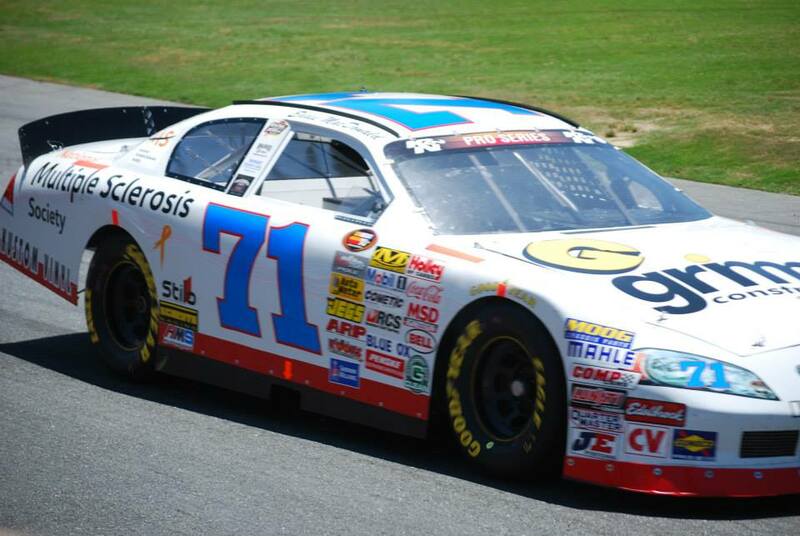 by G-Clean will mark the 10th all-time event for the NASCAR K&N Pro Series East at Greenville Pickens Speedway, and the first of two in 2013. The Procedure: The maximum starting field will be 30 cars, including provisionals. The first 26 starting positions will be based on two-lap time trials and the remaining four will be filled through the provisional process. The race will be 150 laps (75 miles) straight through with no tire changes. 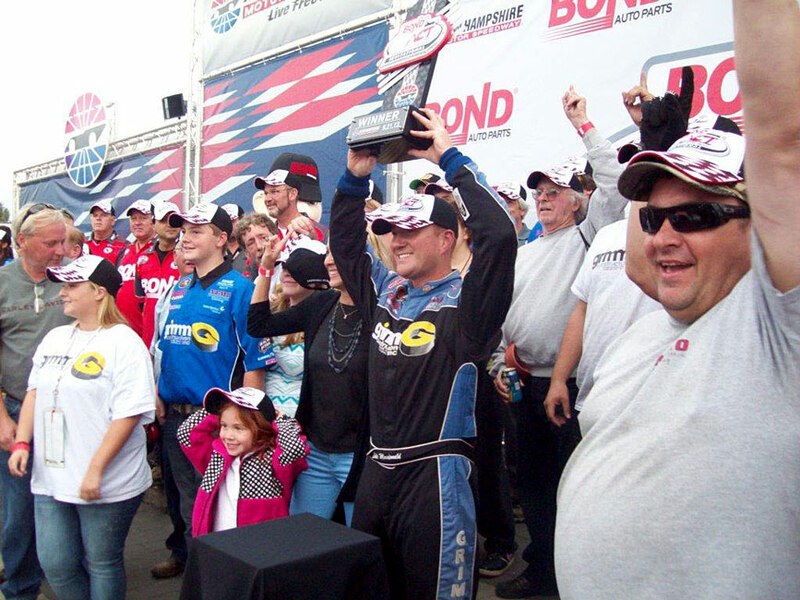 Race Winners: The nine previous K&N Pro Series East races in Greenville have produced eight different winners. Only Darrell Wallace Jr., who took the checkered flag in this event last year, has won at the track twice. Pole Winners: Like with race winners, there has been only one driver to earn multiple poles at GPS: Brett Moffitt. Moffitt set the qualifying record at 20.534 seconds (87.659 mph) in the 2011 season-opener, and his 2010 pole eclipsed Joey Logano’s series record as the youngest pole winner at 16 years, eight months. • Has six wins, two poles and 76 top 10s in 159 career starts. 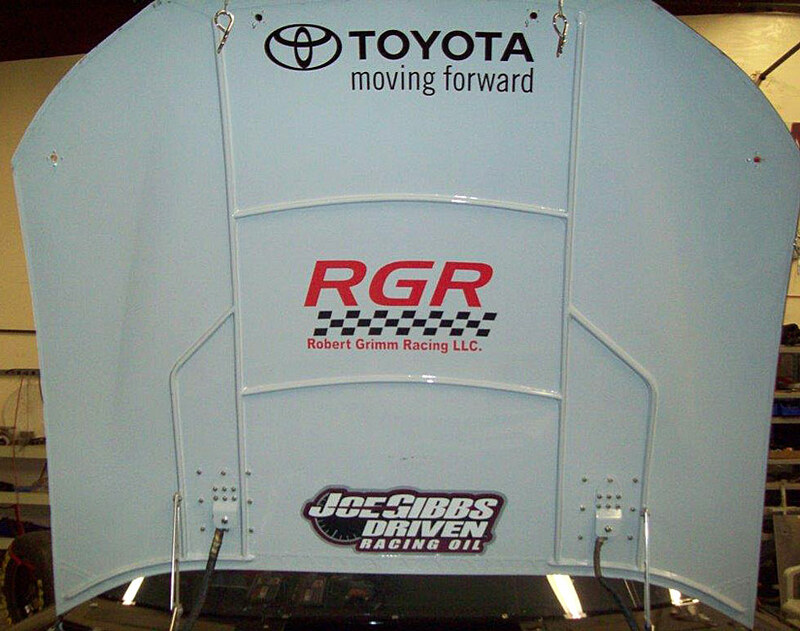 • Tied with series champion Kyle Larson for the most top-10 finishes last year with 12. • Has five top 10s with an average finish of 10th and a best result of third in eight career starts at GPS. • His eight starts at GPS are the most of any competitor at the track. 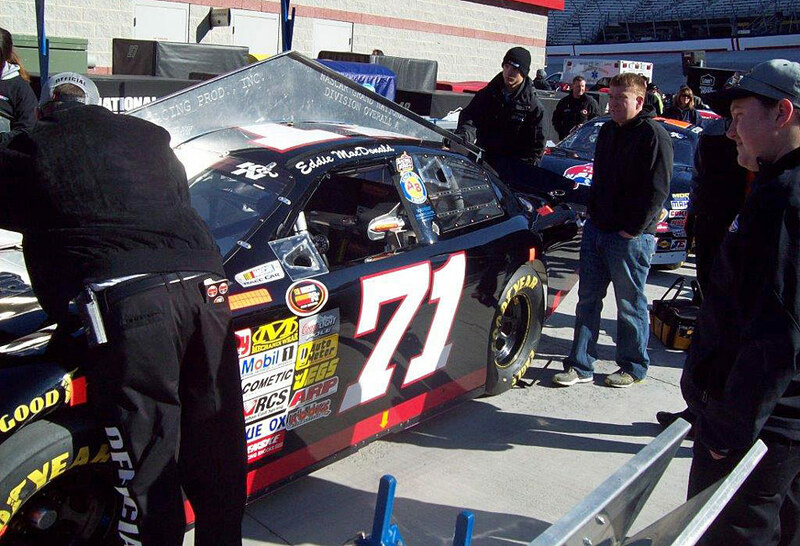 • The 2013 season is the 27th for the NASCAR K&N Pro Series East. • The 2013 schedule features 15 races at 13 different tracks across 11 states. • The competition season opened with the non-points UNOH Battle At The Beach on Feb. 19 on the short track at Daytona International Speedway. Cameron Hayley won the K&N Pro Series feature. • Dylan Kwasniewski took the checkered flag in the first points race of the season on March 16 at Bristol Motor Speedway. He assumed the lead from polesitter Michael McGuire on Lap 30 and held it the rest of the way. 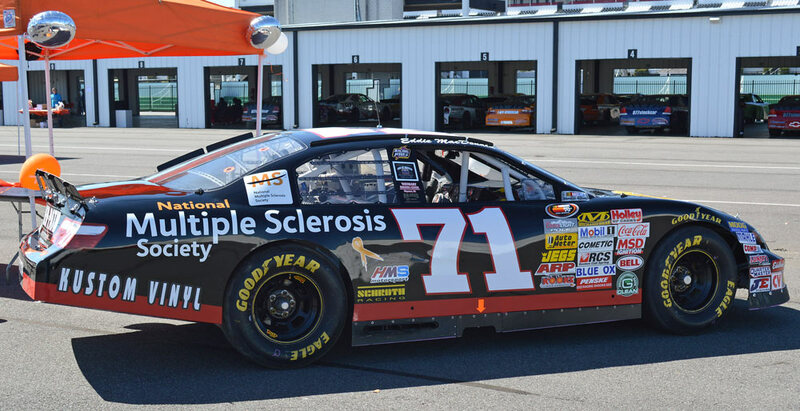 Eddie MacDonald opened the NASCAR K&N Pro Series East season with an impressive drive from the back of the field to post a seventh place finish in the Drive4COPD 125 on the famed “World’s Fastest Half Mile.” The race had special meaning for the team as it displayed the “Multiple Sclerosis Awareness Week” logo in support of Megan Spaulding, the daughter of team owners Karla and Rob Grimm, who was recently diagnosed with the disease. Despite the car tightening up, the Grimm MS Awareness Toyota moved steadily to the front and restarted on lap 102 after the sixth caution flag in the eighth spot. The final yellow flag on lap 107 reset the field for the lap 110 restart. 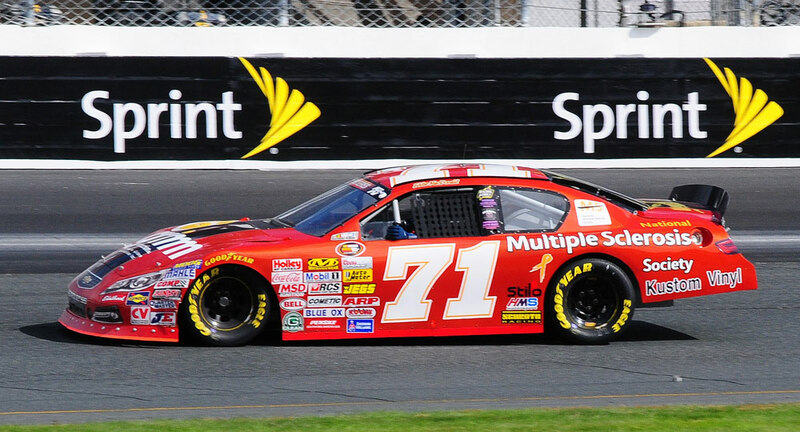 With five laps to go, the #71 was eighth and gained one more position on the final lap to finish seventh. 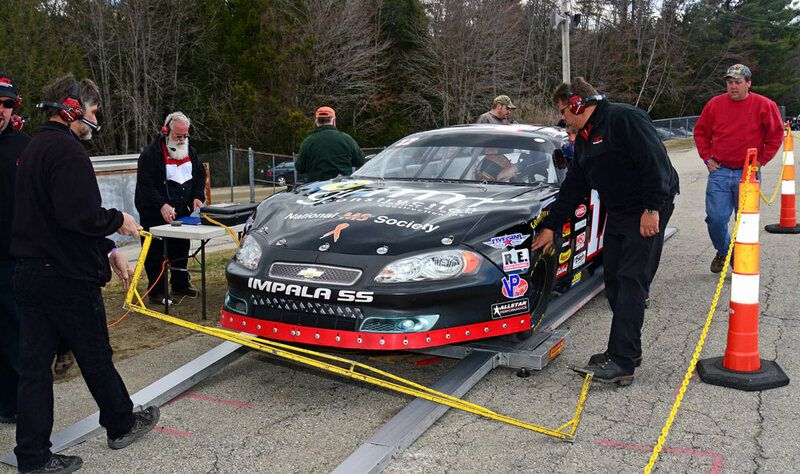 The team has a quick turnaround with the second race of the K&N season scheduled for Greenville Pickens Speedway (S.C.) on Saturday, March 23. 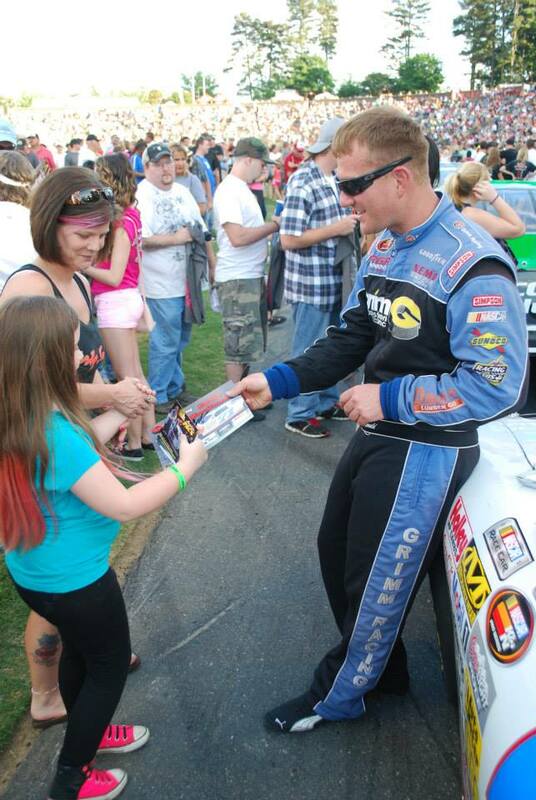 The Kevin Whitaker Chevrolet 125 will be presented by G-Clean. 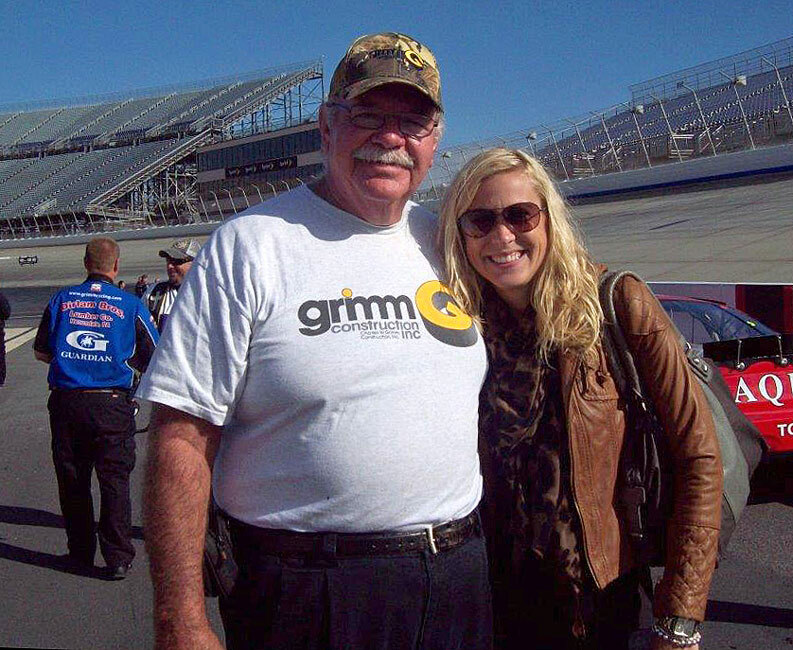 When the green flags waves to open the NASCAR K&N Pro Series East season at Bristol Motor Speedway on March 16, Eddie MacDonald and the entire Grimm Racing team will have added meaning for the event. 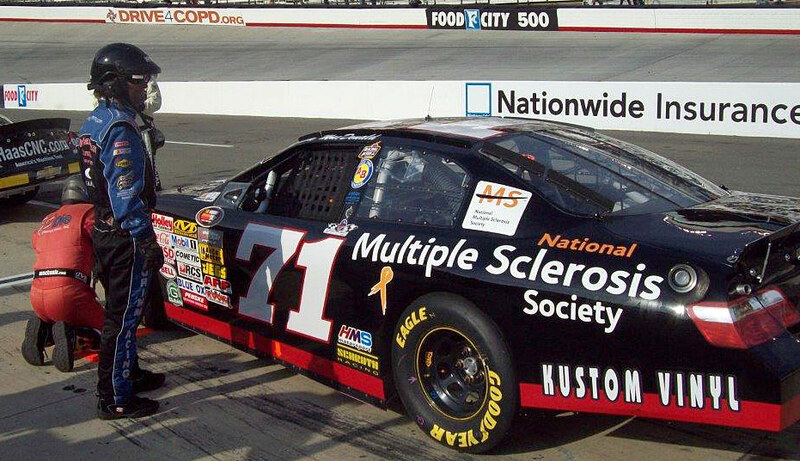 The #71 will proudly display the National Multiple Sclerosis Society logo on the rear quarter panels in support of MS Awareness Week running March 11-17 during the Bristol 125 on “The World’s Fastest Half Mile.” This disease recently hit close to home in the Grimm Racing family when Megan Spaulding, the daughter of team owners Karla and Rob Grimm, was diagnosed with MS. 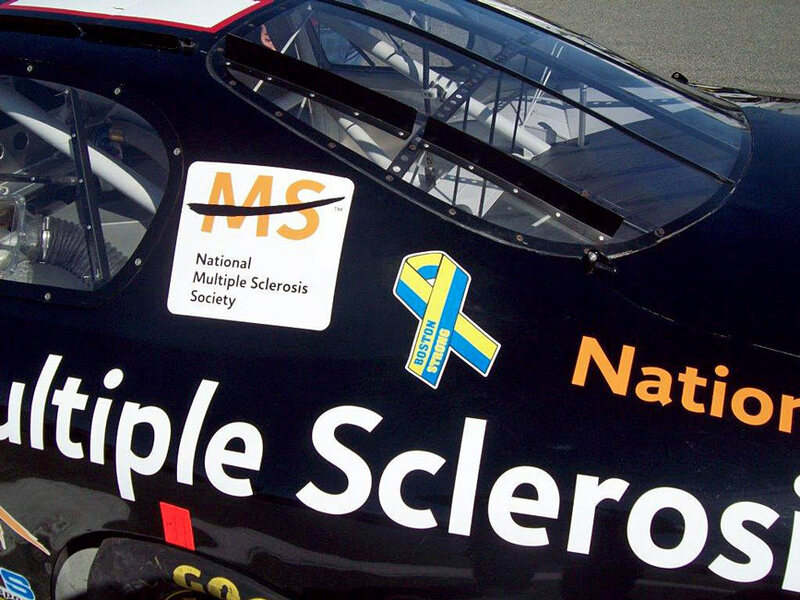 The cars will also display the MS logo on the pillar posts for the entire season with the crew wearing patches, pins, and bracelets during each race to show their support. 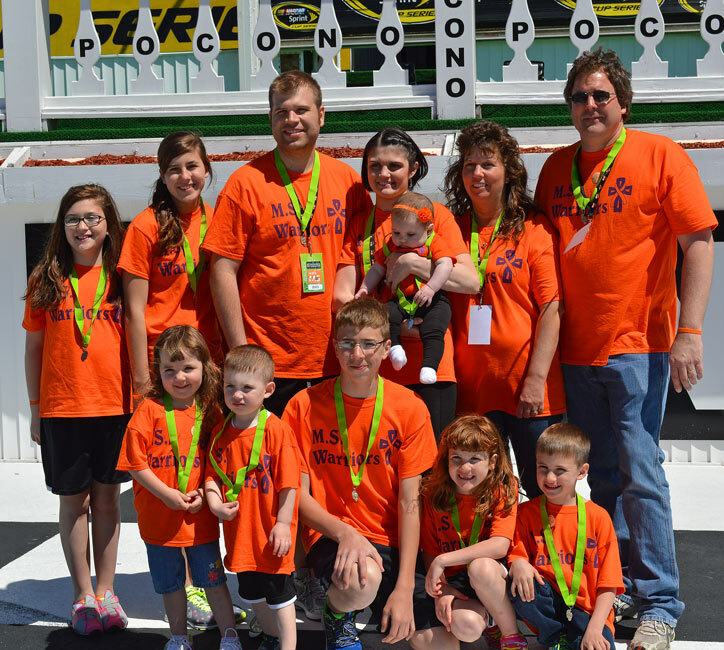 In addition to team involvement during race days, Megan, family members, and members of Grimm Nation plan to participate as a team called “MS Warriors” in the MS Walk at Pocono Raceway on Sunday May 5. 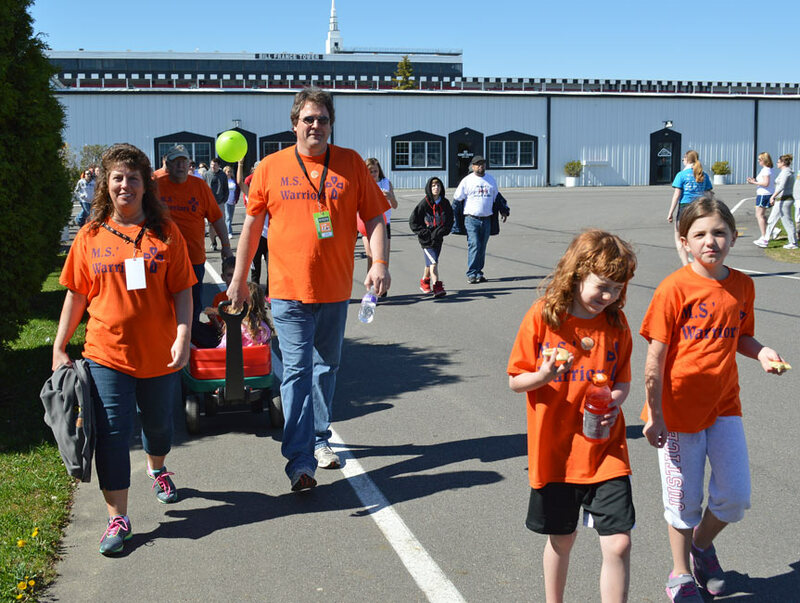 This is the third consecutive year the raceway will host the event that is open to everyone to walk the three mile course around the track. 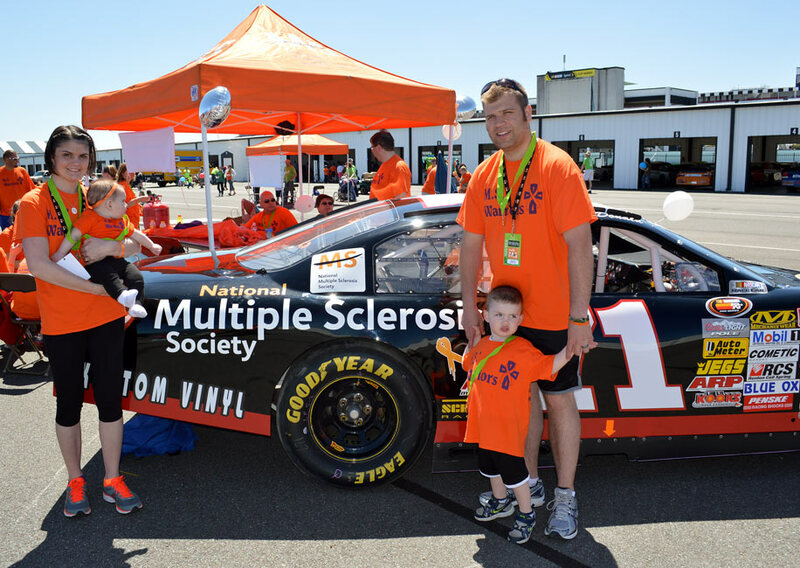 Anyone who wishes to donate to MS research in Megan’s name may stop by the #71 hauler at Bristol or throughout the season. Donations may also be made in Megan’s name and mailed to Jolene Drandson, 43 Elizabeth Road, Sandown, N.H. 03873. 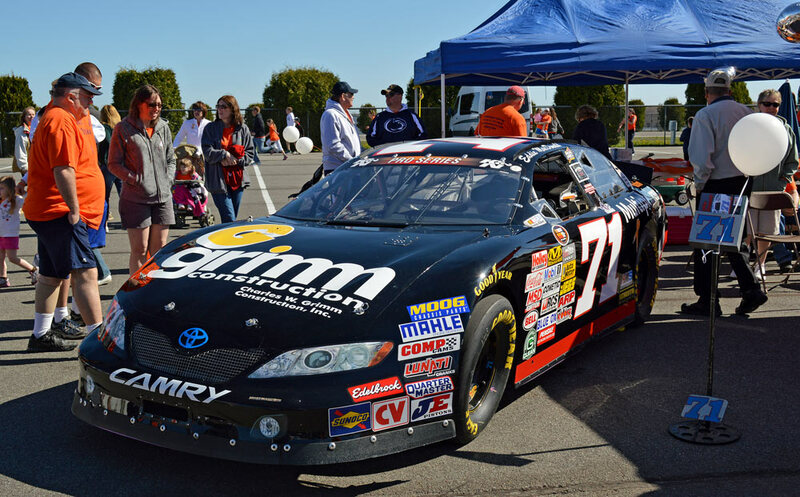 The Race: The DRIVE4COPD 125 will mark the opening of the 15-race 2013 regular season schedule for the NASCAR K&N Pro Series East. The Procedure: The maximum starting field will be 36 cars, including provisionals. The first 32 starting positions will be based on two-lap time trials and the remaining four will be filled through the provisional process. The race will be 125 laps (66.625 miles) with a five minute break at or near the conclusion of Lap 70. 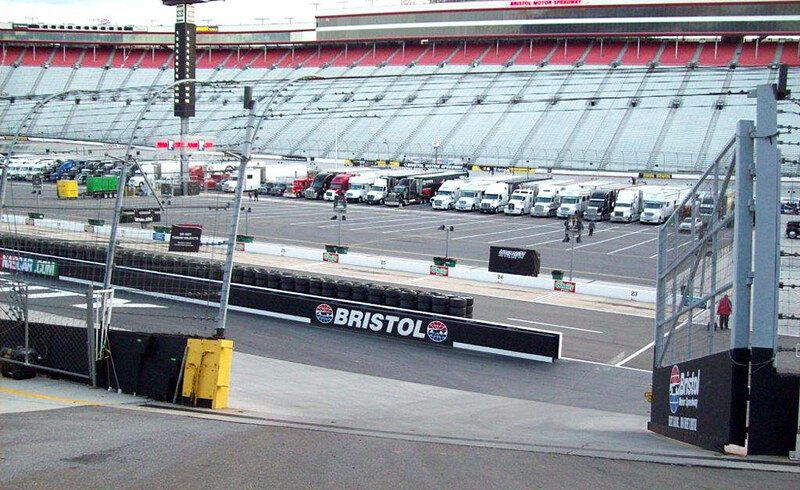 The Track: Known as the “World’s Fastest Half Mile,” Bristol is a .533-mile concrete oval with banking between six and 10 degrees on the straightaways and 24-28 degrees in the turns. Race Winners: Nelson Piquet Jr. won the inaugural NASCAR K&N Pro Series East race at Bristol in 2012 in his series debut. Piquet led 63 laps en route to the checkered flag. Pole Winners: As the pole winner of the inaugural series event at Bristol, Piquet established the track qualifying record at 118.811 mph (16.150 seconds). 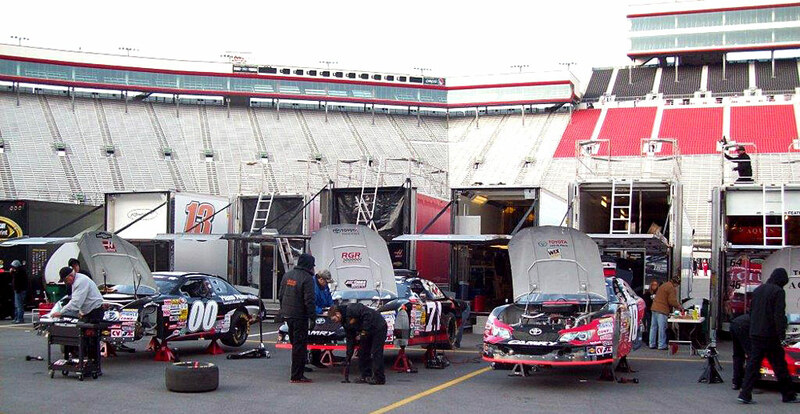 New Faces at Bristol: Of the 43 drivers on the pre-entry list for the DRIVE4COPD 125, 15 will attempt to make their official NASCAR K&N Pro Series East debut. There are a total of 26 Bristol entries that will be eligible for Sunoco Rookie of the Race and Sunoco Rookie of the Year honors as they’ve had seven or less starts in the series prior to 2013. 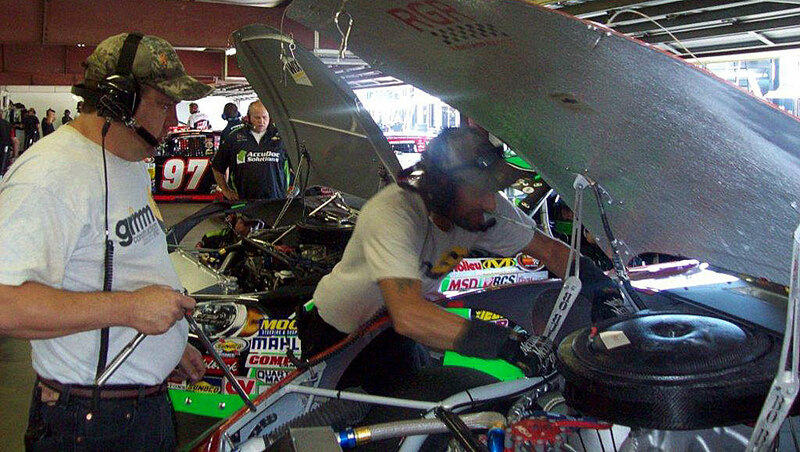 DAYTONA BEACH, Fla. – NASCAR has announced the 2013 NASCAR K&N Pro Series East schedule that features 15 points races at 13 different tracks across the eastern United States. 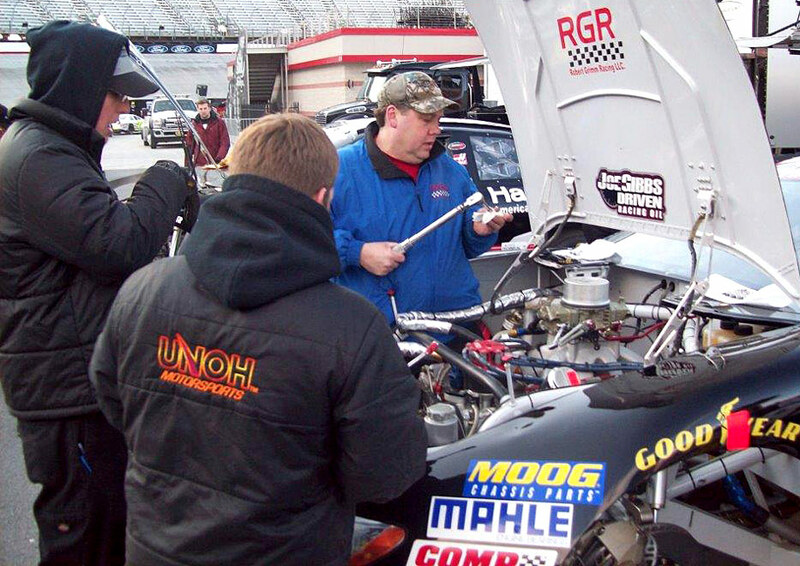 The season will commence with the inaugural UNOH Battle at the Beach exhibition event on the .4-mile track at Daytona (Fla.) International Speedway on Feb. 19 in which the K&N Pro Series East and K&N Pro Series West will compete in combination. 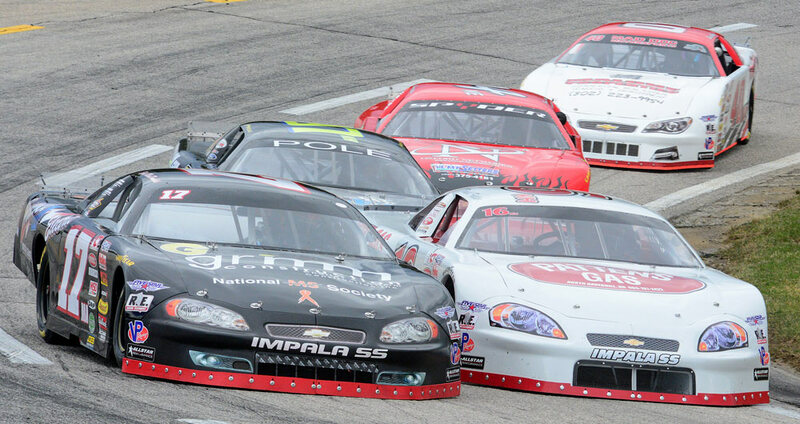 The K&N Pro Series East will then return to The Sunshine State on April 13 for its first appearance at the half-mile Five Flags Speedway in Pensacola. In another debut event, NASCAR returns to Road Atlanta, the 2.54-mile road course located in Braselton, Ga., on Oct. 18. The stock-car series will join the American Le Mans Series presented by Tequila Patrón for the Petit Le Mans weekend. 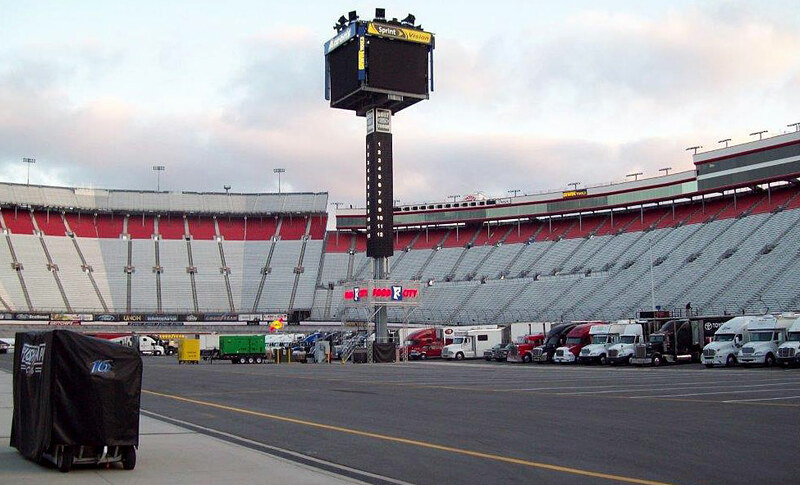 Following Daytona, the 2013 regular season will begin at Bristol (Tenn.) Motor Speedway, on March 16 as part of the spring NASCAR Sprint Cup Series weekend. 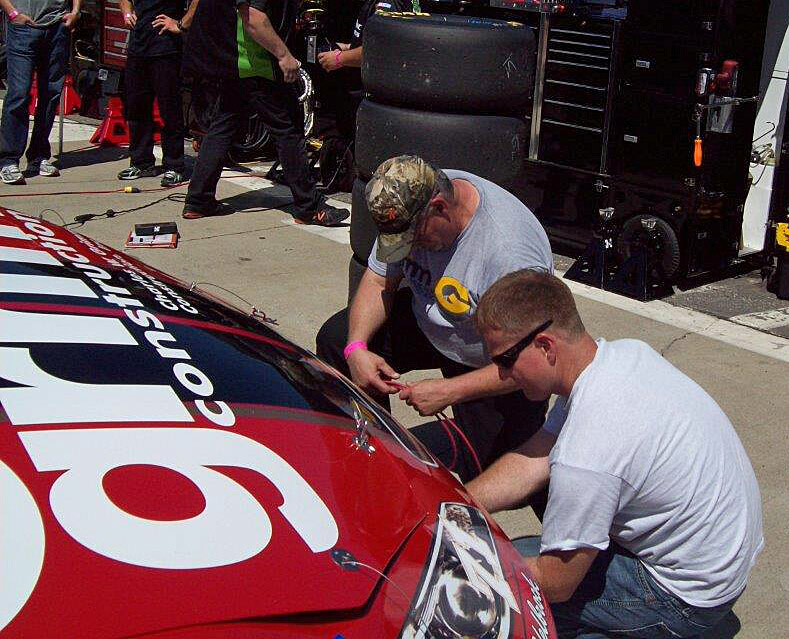 Iowa Speedway again will welcome both the K&N Pro Series East and K&N Pro Series West for combination contests. This year the first date is set for June 7 while the return date is Aug. 2. 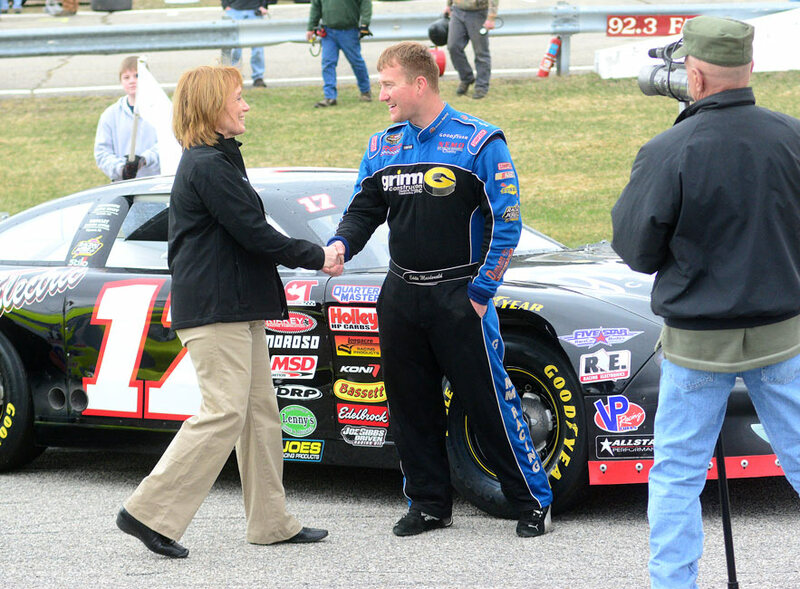 Both events will be held in conjunction with the NASCAR Nationwide Series at the Newton, Iowa track. 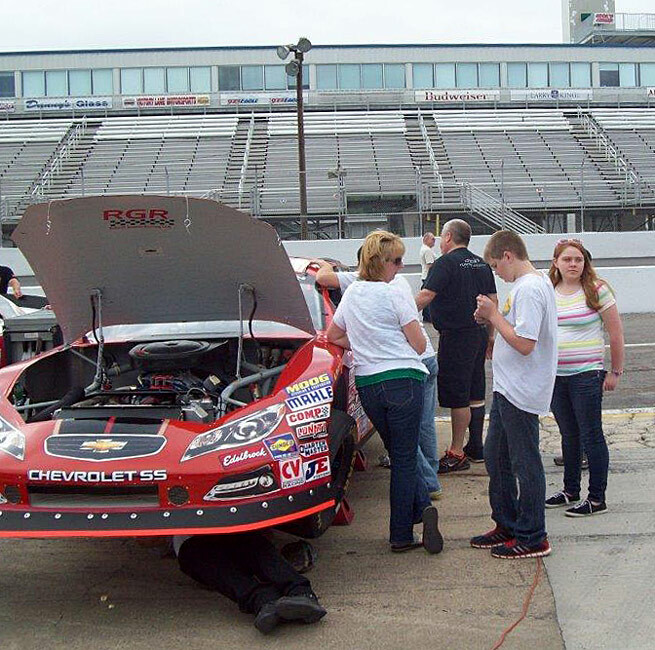 In addition to Bristol and the two Iowa races, the K&N Pro Series East will have three more companion events in 2013 with NASCAR’s national series. The East will return to Richmond (Va.) International Raceway on April 25, New Hampshire Motor Speedway in Loudon, N.H., on Sept. 21, and Dover (Del.) International Speedway on Sept. 27. 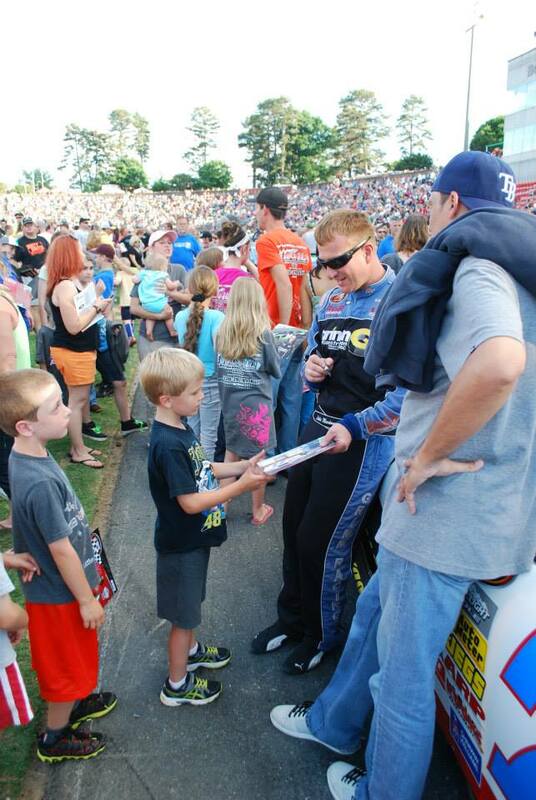 Greenville (S.C.) Pickens Speedway will host the series with dates on March 23 and Sept. 2. 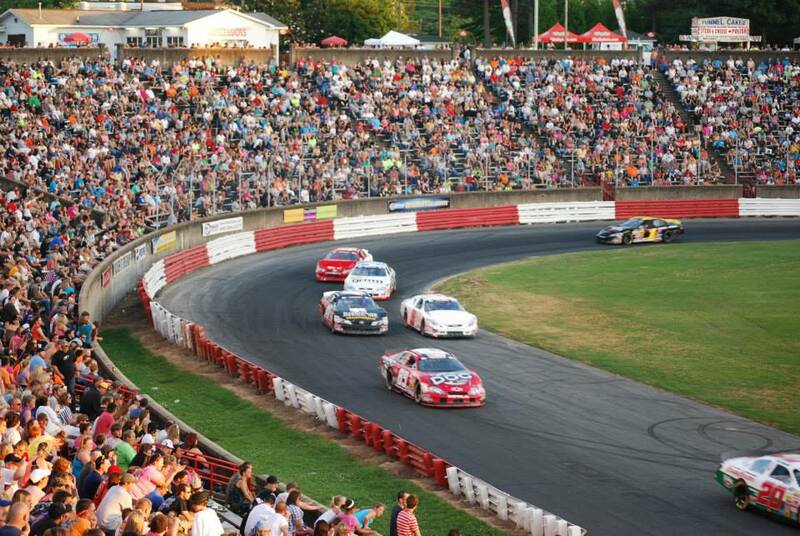 Short tracks Bowman Gray Stadium in Winston-Salem, N.C. on June 1, Langley Speedway in Hampton, Va. on June 22 are featured dates on the slate as are a July 13 date at Columbus (Ohio) Motor Speedway and a visit to CNB Bank Raceway Park in Clearfield, Pa. on July 20. 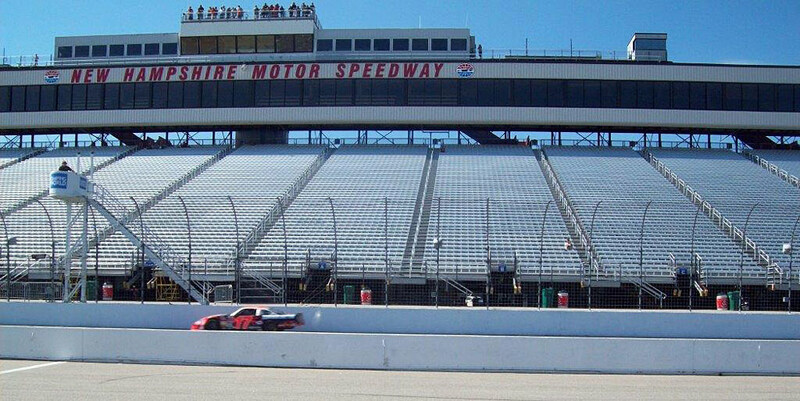 The 2013 season will conclude at Rockingham (N.C.) Speedway on Nov. 2.